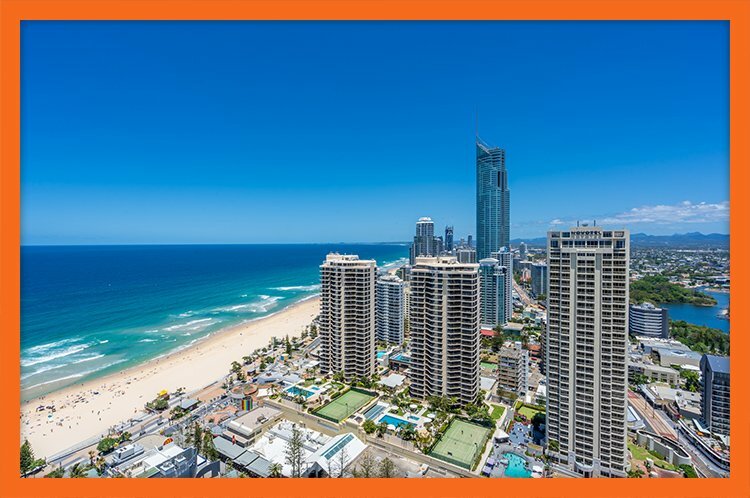 Located in the heart of Surfers Paradise, Orchid Residences is co-located within one of the Gold Coast's newest hotels whose name alone is renowned for five-star luxury - all around the world. 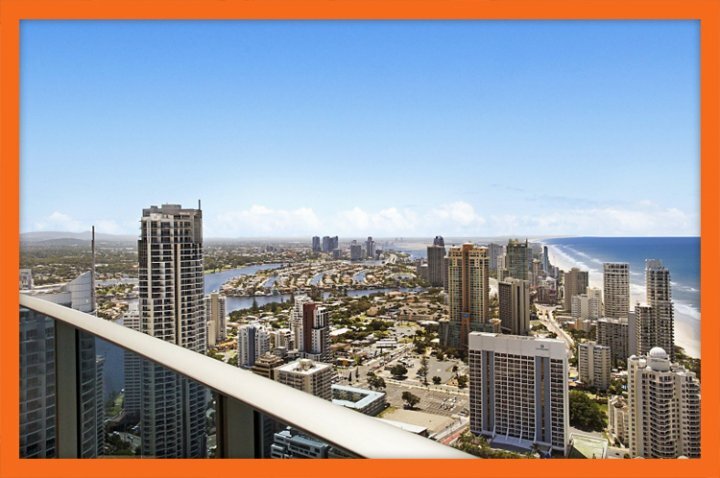 Orchid Residences is located on Orchid Avenue in Surfers Paradise, just 50 metres from Cavill Avenue and 200 metres from the spectacular beachfront Esplanade and Surfers Paradise Beach. Everything is at your fingertips from the very best shopping outlets, to the hottest bars and the best restaurants. You need only exit the foyer and you're right where you want to be. The resort boasts very impressive first-class facilities. These include an indoor pool, an outdoor pool and seven spas, a sauna, two fitness centres, a day spa, barbeque facilities, a terrace, free Wi-Fi in public areas and GCHR managed apartments and even bicycle rental. In addition to these great activities, the resort offers a long list of amenities including a tour desk, child minding services, meeting facilities, a business centre, a beauty shop and a gift shop. The resort also has on-site restaurants and bars which are highly acclaimed and recommended. 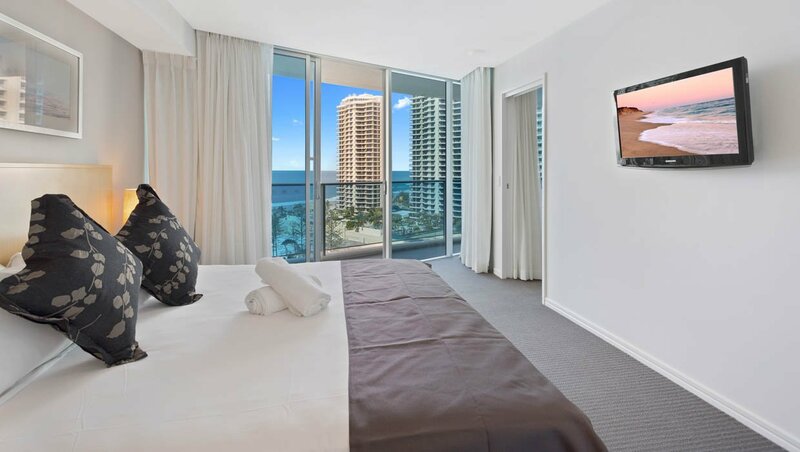 Apartment Overview If you're looking to pamper yourself with luxurious holiday accommodation in Surfers Paradise but don't want to spend a fortune, then Apartment 11303 at Orchid Residences is meant for you! 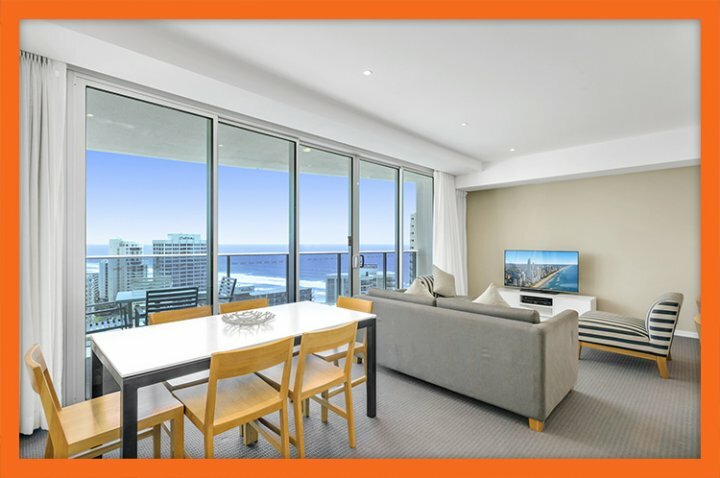 This stylish apartment is centrally located in Surfers Paradise, within the Hilton Hotel and minutes away from the beach and the cosmopolitan tourist hub. Situated on the 14th level of the hotels Boulevard Tower, Apartment 11303 is a sophisticated hotel apartment which gives off an air of dignity. A 2 bedroom apartment with 2 bathrooms, Apartment 11303 boasts world class facilities for your holiday enjoyment. 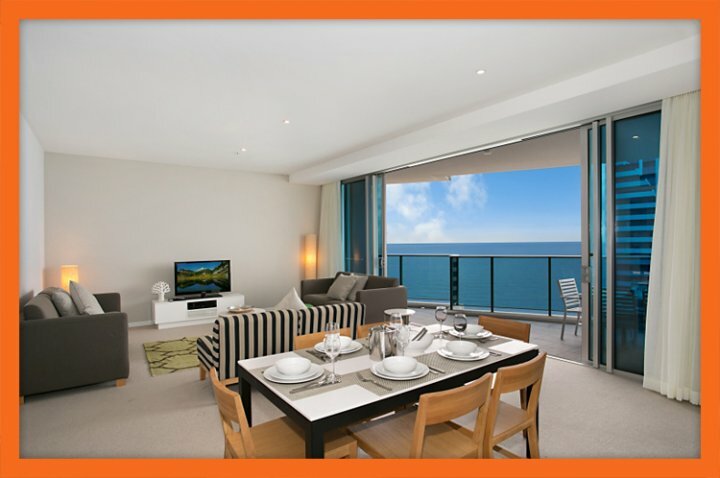 Apartment Features When you choose Apartment 11303 as your holiday accommodation, you can indulge in a royal lifestyle. The living area of this apartment is grand, to say the least. 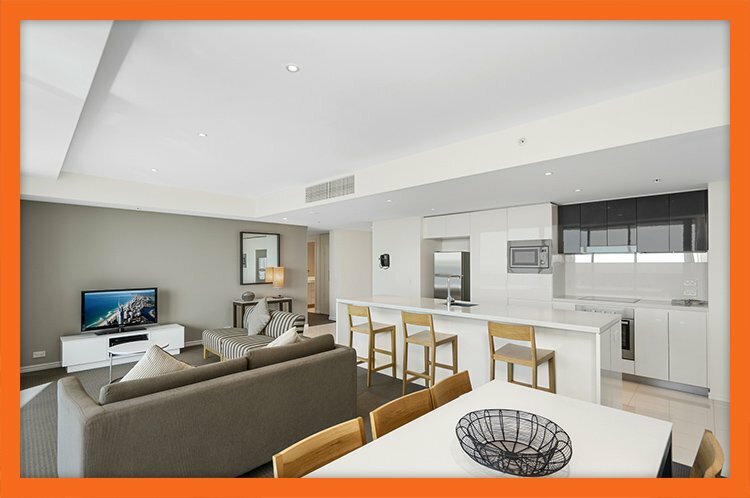 Spacious and well designed, the lounge area contains comfortable sofas and has various entertainment options including free Foxtel premium and free Wi-Fi, while the wraparound balcony offers you stunning views of Surfers Paradise and the beach. The apartment's fully-equipped gourmet kitchen allows you to enjoy home cooked meals, while the provided laundry facilities ensure that you need not spend anything extra on your holiday. A secure undercover parking space is also provided at no additional fee when you stay in Apartment 11303. Bedding Configuration The east facing bedrooms of Apartment 11303 are exquisitely designed and offer regal views of the Pacific Ocean. The master bedroom includes a king size bed and also features its own private ensuite bathroom. This bedroom also opens out to the balcony and is equipped with a TV set for your entertainment. The second bedroom is equipped with a double bed. 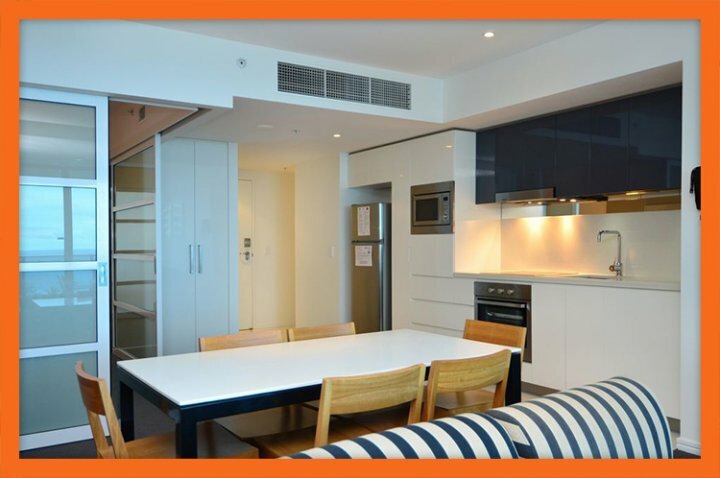 The tariff for Apartment 11303 sleeps up to 4 guests, but you can accommodate 2 extra guests by placing a request when you make your booking and we will provide two foldaway beds at a surcharge. 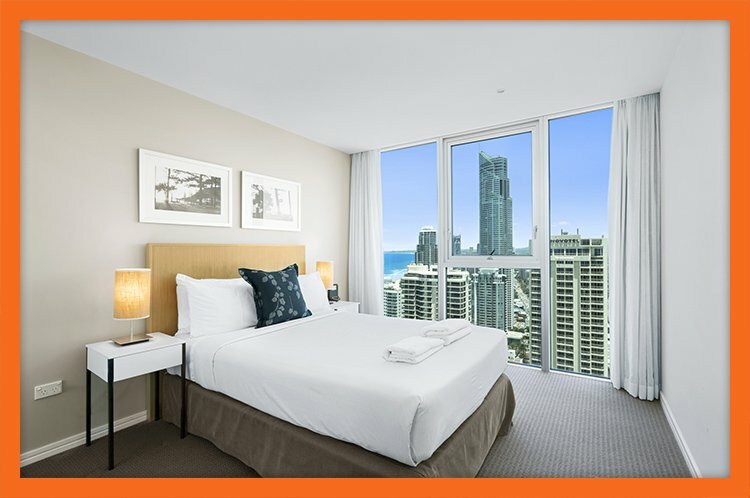 Resort Facilities Orchid Residences lies within an internationally acclaimed Surfers Paradise hotel and by choosing to stay in Apartment 11303, you have complete access to the world-class facilities and amenities offered by the hotel. 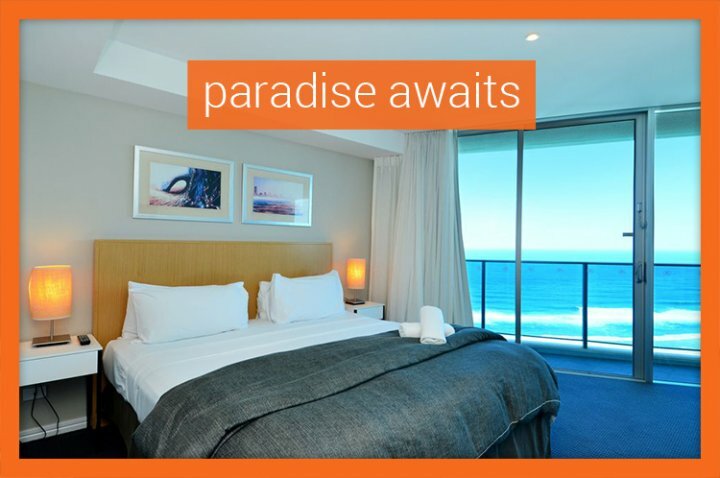 When you're not enjoying the beaches or the tourist centres of Surfers Paradise, you can treat yourself to some fun in this resort. Some of the major highlights and attractions including a number of swimming pools, restaurants and bars, spas and saunas, a gymnasium and a fitness centre and a theatre only to name a few. 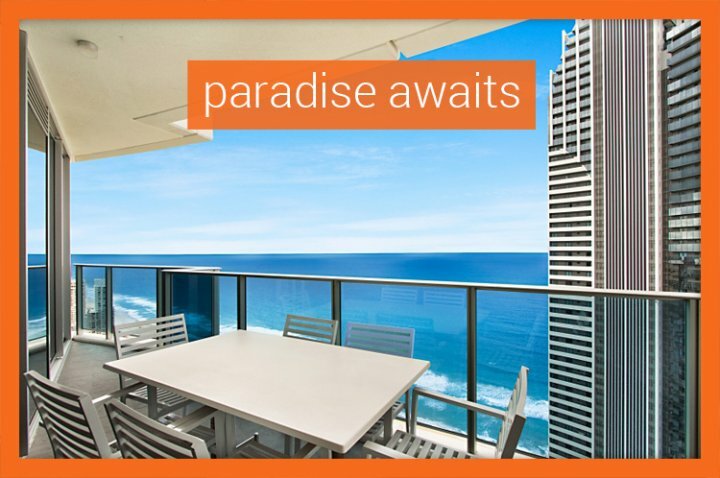 Enjoy affluent lifestyle on your Surfers Paradise holiday at an affordable cost, only at Orchid Residences' Apartment 11303. 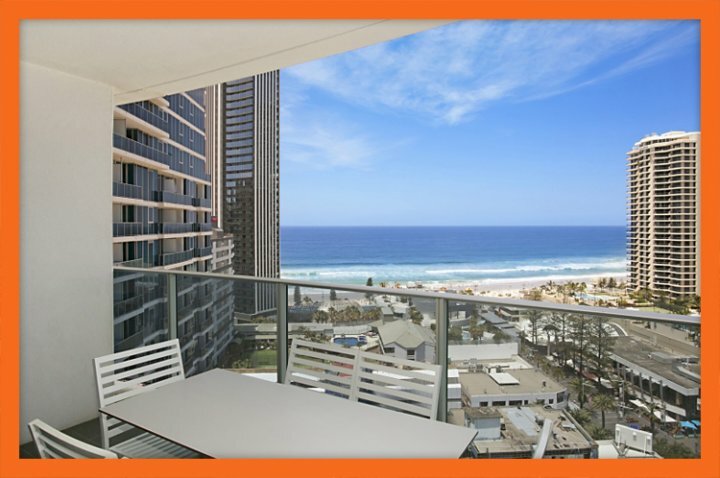 Apartment Overview For stylish, yet affordable Surfers Paradise accommodation, it doesn't get much better than Apartment 11405 at the Orchid Residences. 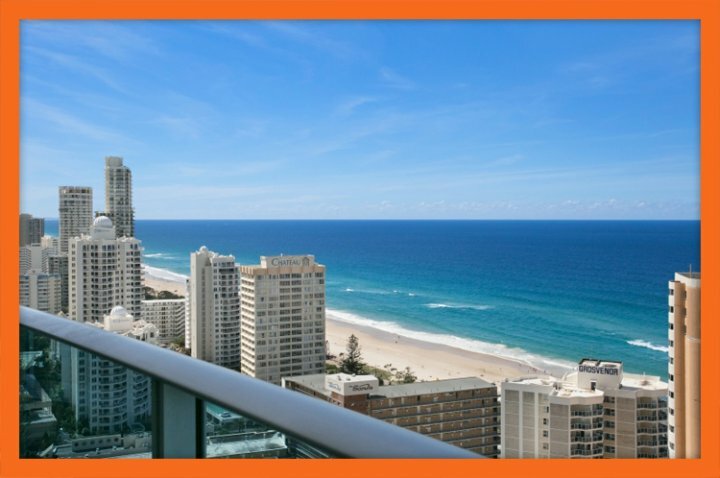 Centrally located within one of the most famed Surfers Paradise hotels, this apartment promises to offer you with best in luxury, comfort, convenience and location. Situated high on the 14th level of the hotels Boulevard Tower, Apartment 11405, this 3 bedroom 2 bathroom apartment boasts state-of-the-art interiors complemented with world-class facilities. 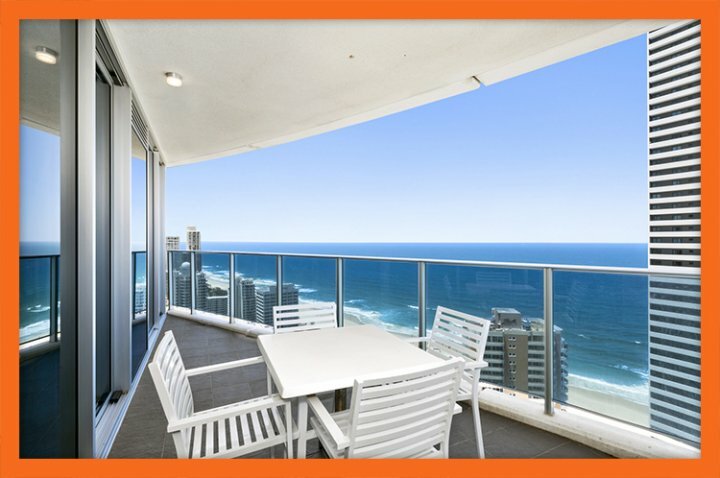 This apartment is ideal for a group of friends or a family visiting Surfers Paradise. 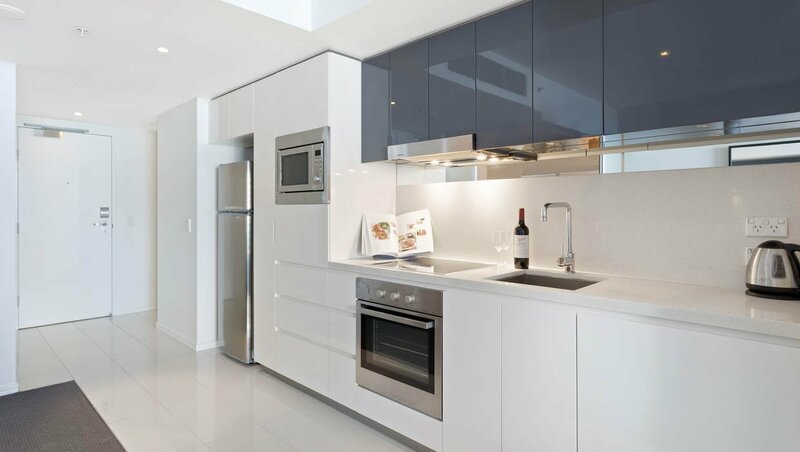 Apartment Features Apartment 11405 presents an elegant mix of luxury and functionality. Featuring an open-plan living area, which consists of a lounge, a gourmet kitchen, a dining area and a balcony, this apartment will certainly stack up to your expectations of a luxurious holiday escape. The lounge makes for a comfortable place for relaxation and it is equipped with a large TV and Premium Foxtel for your entertainment. The fully air-conditioned apartment also includes free Wi-Fi throughout the duration of your stay. You can even make your own meals, thanks to the fully equipped gourmet kitchen, which offers great cost savings. 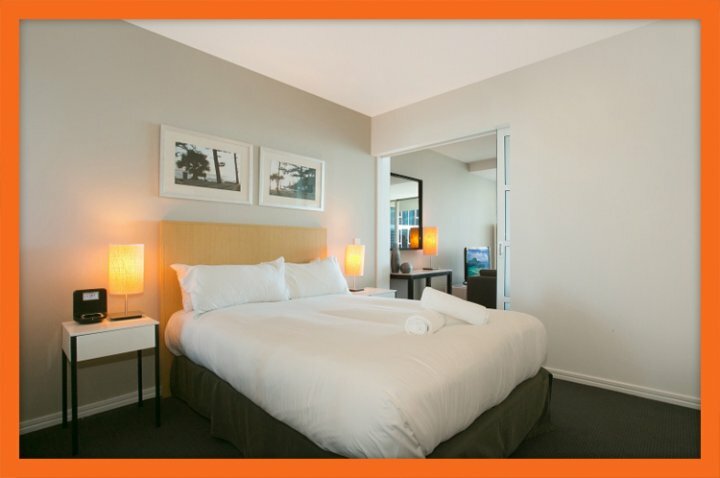 Laundry facilities, towels and linen are also provided, along with a free secure car. Bedding Configuration All bedrooms of Apartment 11405 reflect a contemporary design and are well furnished to provide you with ultimate comfort on your holiday. The master bedroom is equipped with a king bed and includes a personal safe and a TV. This east facing bedroom, which also features an attached ensuite bathroom, allows you to wake up to ethereal views of the sunrise on the Pacific Ocean. The second bedroom includes a double bed, while the third bedroom includes two single beds - both these bedrooms share the main bathroom. Both the second and third bedrooms face the south and offer splendid views of the hinterland and the beaches. The standard tariff for Apartment 11405 includes up to 6 guests. However, this apartment can sleep 2 extra guests if you wish. 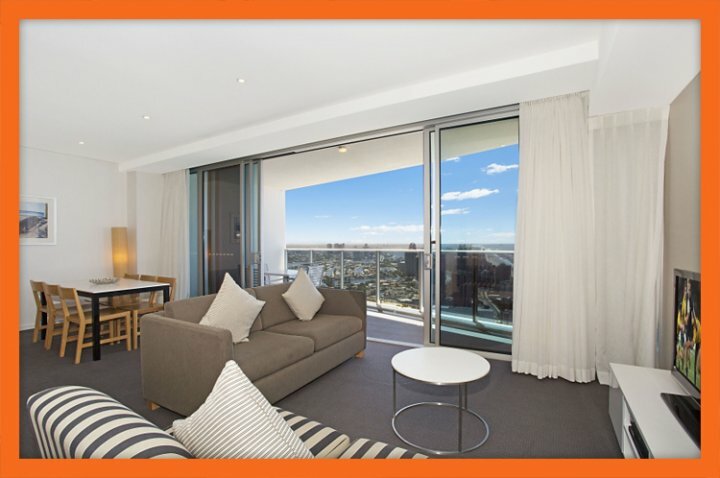 A small surcharge fee will be charged should you choose to have more than 6 people in the apartment on your holiday. Resort Facilities Co-located in a 5 star hotel, Orchid Residences offers you a world of facilities. 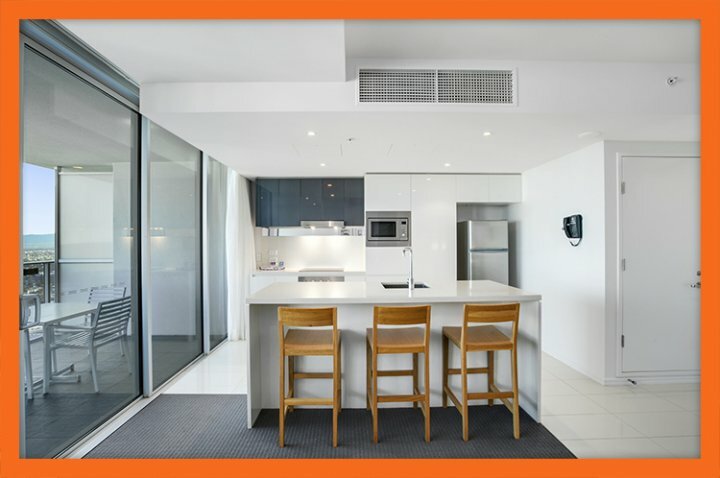 When you stay at Apartment 11405, you will have full access to all hotel facilities, which include first class swimming pools, a 24/7 fitness centre, a spa and a sauna, gardens and open entertainment areas and BBQ facilities to name a few. Children will also love the splash pool provided by the hotel. 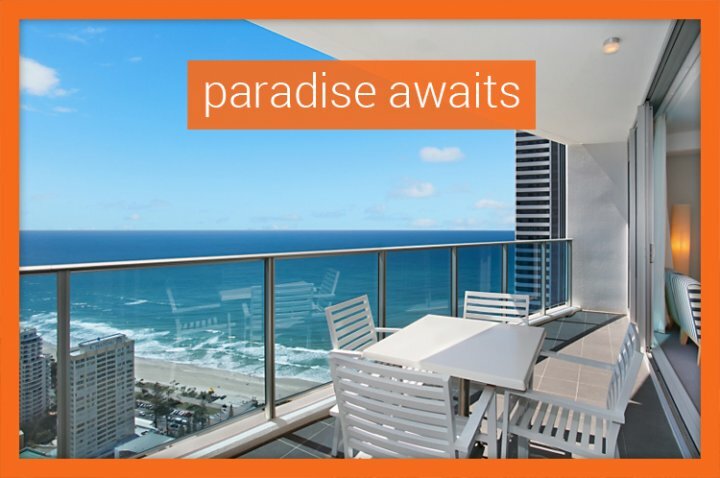 With so much on offer at an affordable price point, choose Apartment 11405 at the Orchid Residences as your Surfers Paradise accommodation. 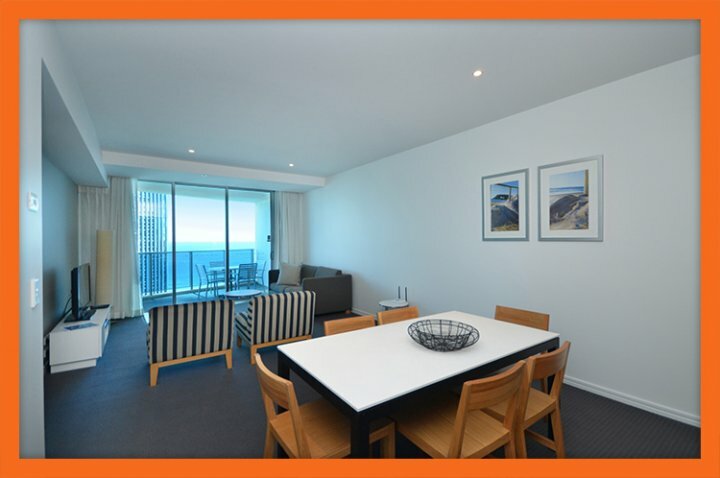 Apartment Overview Apartment 11502 lies within one of the most famous and sought after hotels, and is within walking distance from Surfers Paradise beach, Cavill Avenue and all the best attractions in Surfers Paradise what more could you ask for! Located on the 15th level of the hotel's Highrise Tower, Apartment 11502 is a splendid 2 bedroom apartment which has 2 bathrooms. 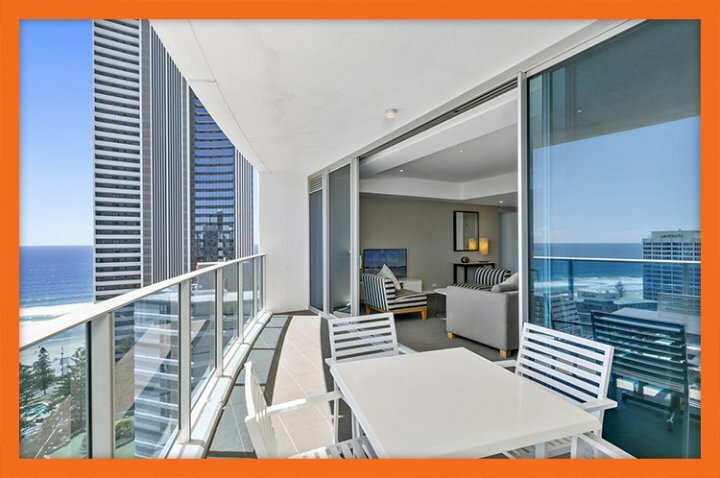 Spacious, luxurious and comfortable, this apartment is ideally suited for a small family or two couples looking to share their Surfers Paradise accommodation. 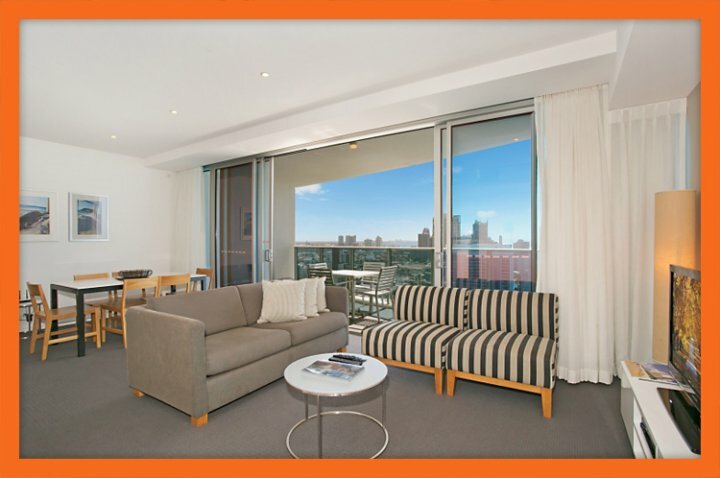 Apartment Features Apartment 11502 offers you everything that you could wish for from a holiday apartment. Featuring a spacious living area, other highlights of the apartment include full air-conditioning, a furnished lounge, a fully-equipped gourmet kitchen, a large dining area and an elegant balcony. 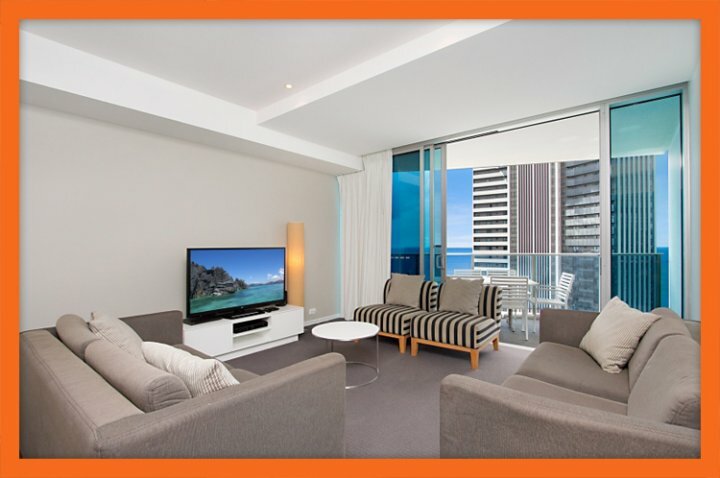 The lounge area definitely makes for a great relaxation spot after enjoying a day out in Surfers Paradise. 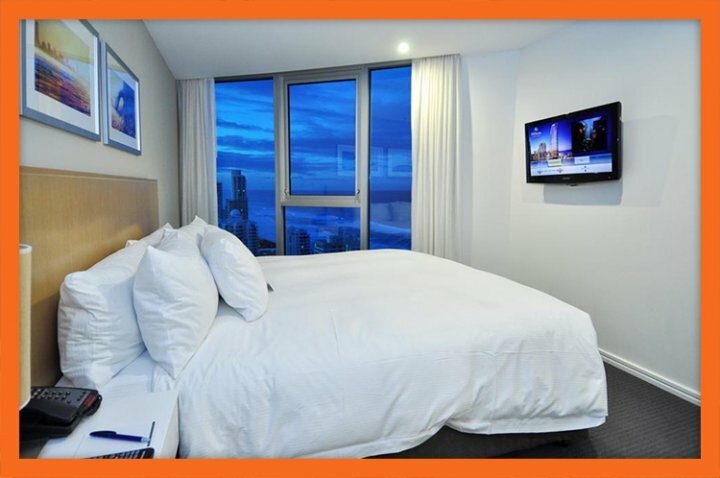 It is equipped with a TV and free Premium Foxtel and other entertainment systems as well. Free Wi-Fi facilities ensure that you're always connected to the world even when you're on your holiday. The gourmet kitchen allows you to enjoy home cooked meals. You can choose to have your meals in the elegant dining area, or outdoors on the balcony to enjoy an alfresco dining experience. Full laundry facilities and a free undercover parking space are some of the other features of Apartment 11502. Bedding Configuration Both bedrooms of Apartment 11502 are extremely spacious and feature immaculate interiors. The master bedroom contains a king bed while the second bedroom includes a double bed. The master bedroom is also equipped with a TV set and features a grand private ensuite, while the second bedroom also has direct access to the main bathroom. Both bedrooms offer stunning views of the Pacific Ocean and the beaches. The tariff for Apartment 11502 includes 4 people, yet this apartment is roomy enough for you to accommodate two extra guests. If you have more than 4 members, you can place a request when booking the apartment and we will provide you with two foldaway beds at a small additional fee. Resort Facilities Being co-located within the Hilton Hotel, there are many great facilities for you to enjoy. Children will enjoy playing around in the splash pool, while adults can revel in the plunge pool and bar area. Outdoor BBQ and entertainment areas, gardens, a spa and a sauna, outdoor swimming pools and a fitness centre are some other highlights of this resort. 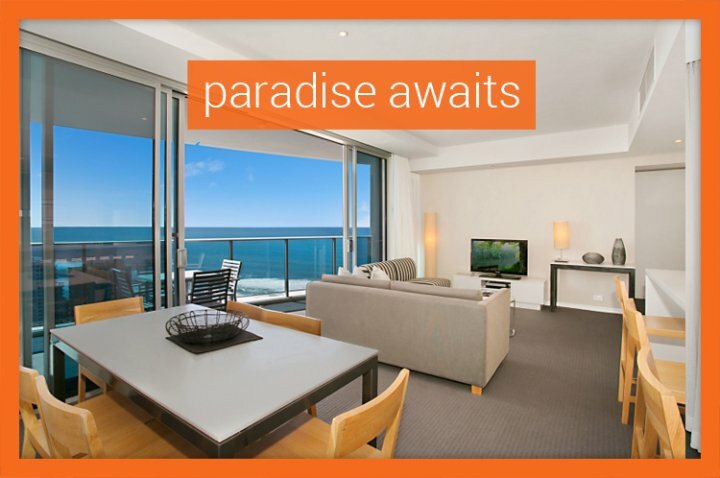 Choose Orchid Residences Apartment 11502 as your Surfers Paradise holiday accommodation. You will certainly not regret it! Apartment Overview Apartment 11504 is a holiday makers dream. 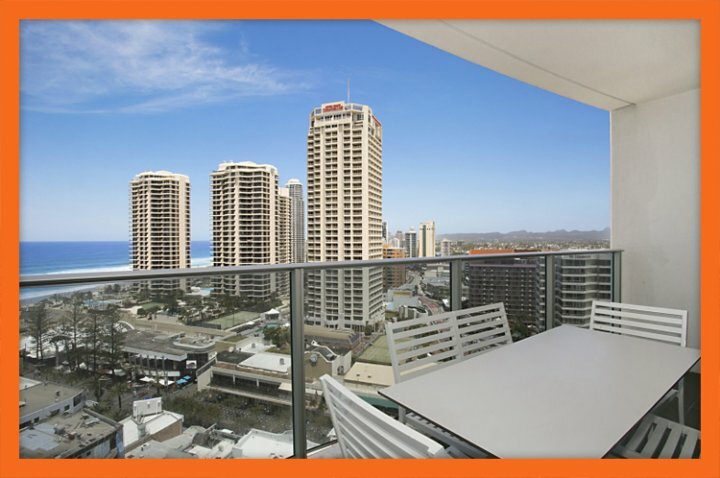 Boasting a prime location, spectacular views, free Wi-Fi, free Foxtel Premium, and a free car parking space, this immaculate 2 bedroom, 2 bathroom holiday apartments offer the best in holiday living and genuine value for money. Apartment Features Located on the 15th floor of Orchid Residences and co-located within a 5-star resort, Apartment 11504 is packed full of mod-cons. Fully air-conditioned throughout, it comprises homely comforts such as a full-sized kitchen and fully equipped laundry, spacious living area, private balcony and much more. The apartment features two bedrooms and two bathrooms. 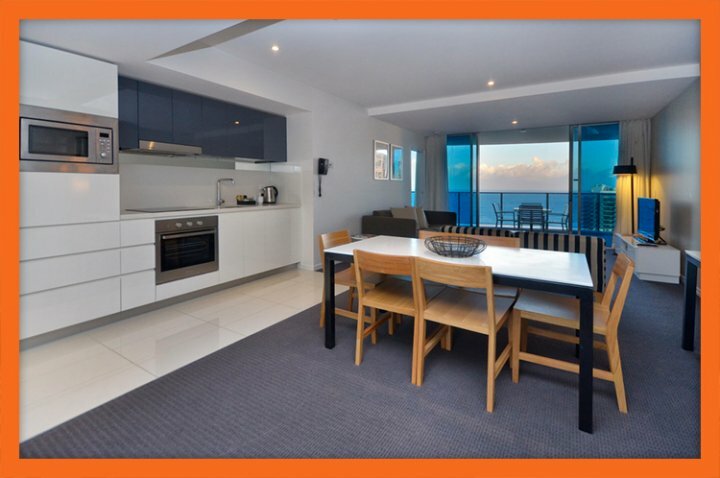 The living area is fitted with a flat-panel TV (with Premium Foxtel) and a DVD player, the dining area has a 6-seater dining table, and the balcony, which offers stunning Ocean views, is furnished. 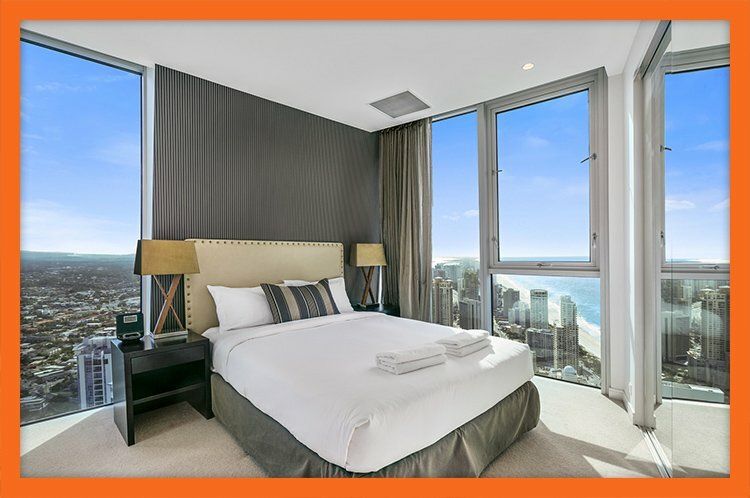 Bedding Configuration Apartment 11504 comprises two bedrooms. The master bedroom has a king-size bed, TV, walk-in robe, ensuite bathroom and balcony access. The second bedroom has a double bed and built in robe. The tariff sleeps 4 guests, however as many as six guests can be accommodated in the apartment (for a small additional fee). Simply, place a request during the booking process. Resort Facilities Situated in a 5-star resort, guests have full access to all facilities of the resort. Such facilities include a sauna and spa, FOUR swimming pools, 24hr gymnasiums, a private theatre, BBQ area, amongst others. Choose Apartment 11504 at Orchid Residences for a superior holiday experience staying in a superior holiday apartment. 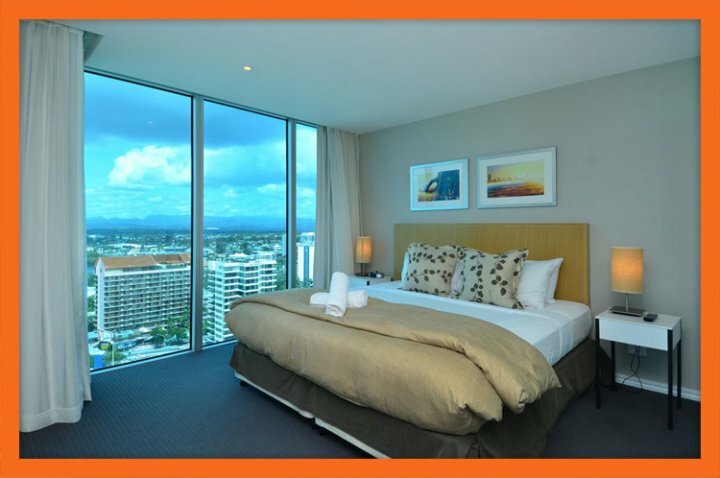 Apartment Overview Orchid Residences' Apartment 12102 is an immaculately presented hotel apartment that is co-located within one of the most prestigious hotels in Surfers Paradise. 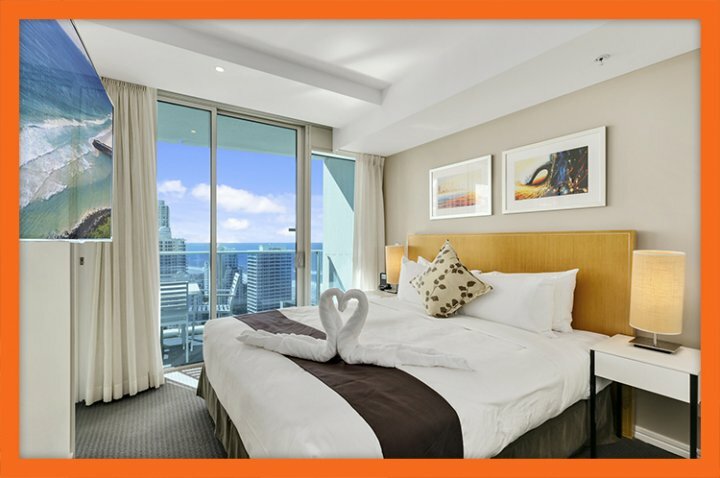 Apartment 12102 is located on the 21st level of the hotel's Highrise Tower and features two bedrooms and two bathrooms. This makes it the ideal accommodation choice for families or groups of friends looking for first class luxury at affordable prices. 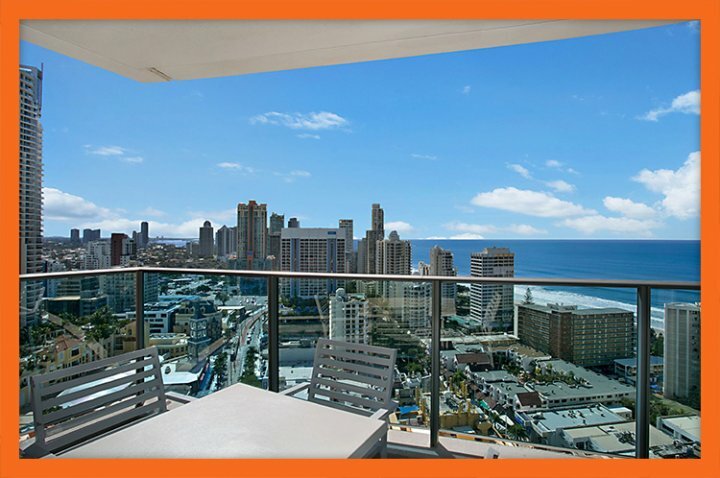 Boasting spectacular views of Surfers Paradise and the Pacific Ocean, this North East facing apartment is one Surfers Paradise hotel apartment not to be missed. 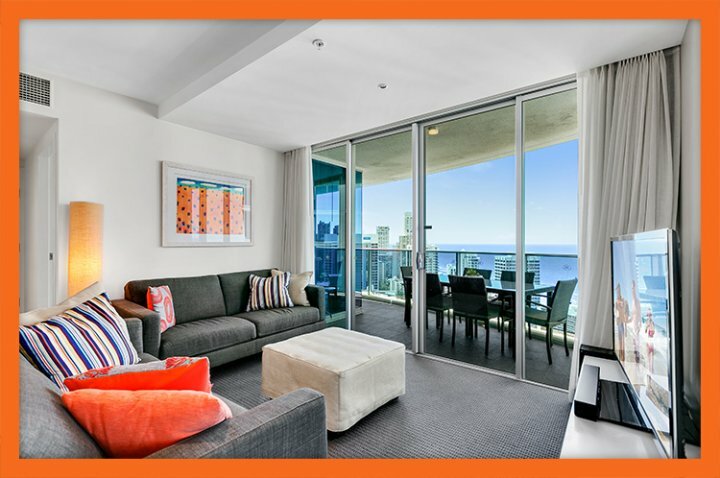 Apartment Features Apartment 12102 comprises everything you need for a luxurious Surfers Paradise holiday. With spacious open plan living areas, you and your guests can relax in the 5 star comforts that this impressive apartment presents. The spacious lounge offers spectacular views and direct access to the balcony. Recline on the balcony or relax in the lounge while enjoying the modern entertainment features which include a flat panel television, DVD player and stereo. 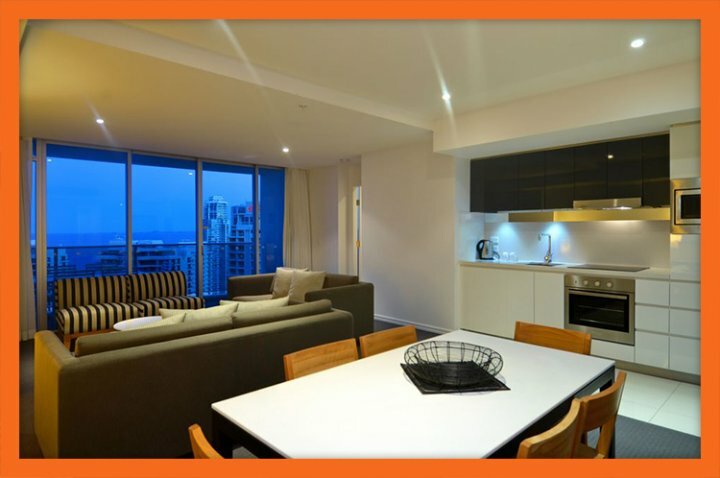 Stay in and prepare a home cooked meal in the gourmet kitchen and dine on the balcony or in the separate dining area. The kitchen is fully-equipped with all the appliances and utensils needed to prepare anything from a snack to a 5 course meal. The apartment also features two bathrooms, full laundry facilities and a free undercover parking space. Bedding Configuration Apartment 12102 features two spacious bedrooms which sleep 4 guests in the tariff and up to 6 when rollaway beds are ordered at the time of your booking (at an additional fee) The master bedroom features a king size bed, a walk-in robe and private ensute bathroom. 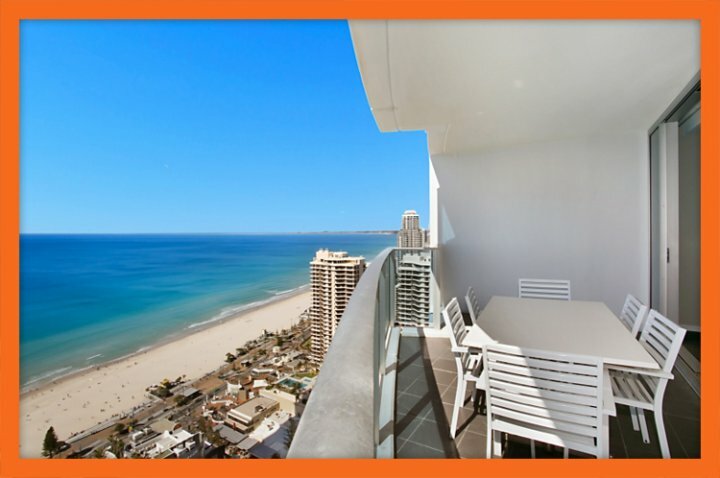 It also has direct access to the balcony and boasts glorious views over the ocean. The second bedroom features a double bed and built-in robe. 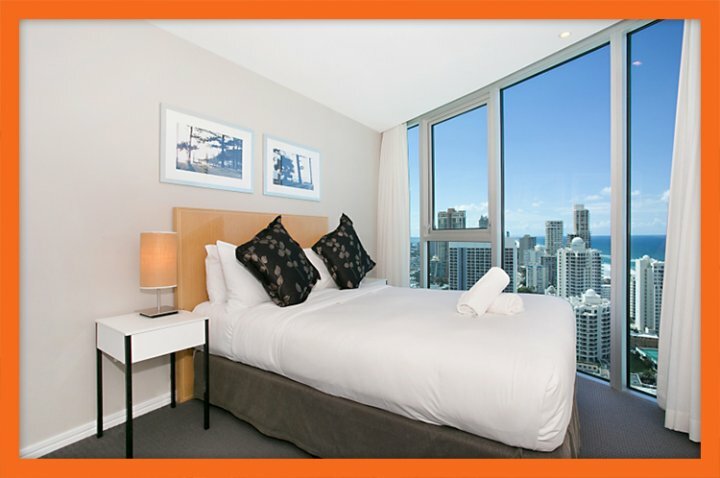 Resort Facilities As Orchid Residences is co-located within a 5 star Surfers Paradise hotel, your reservations grants you access to all the quality facilities of the resort. Such facilities include four swimming pools, a spa and sauna, two gymnasiums, barbeque facilities and much more! 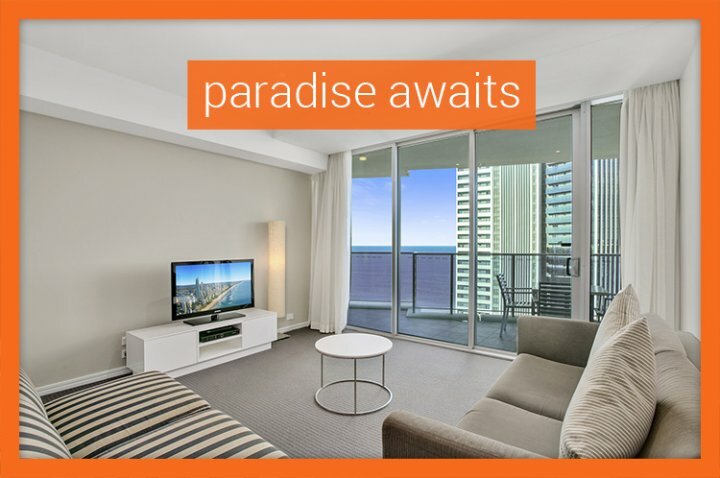 Best of all, you'll be stay on Orchid Avenue in the very heart of Surfers Paradise so everything you need is literally at your doorstep! 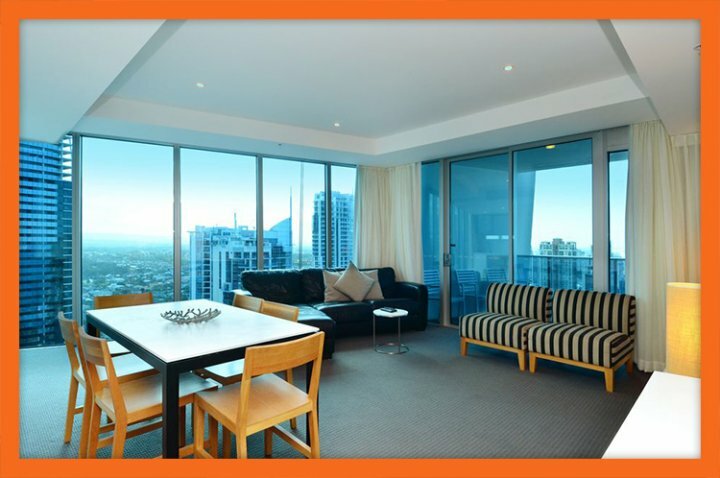 Don't miss out of this fantastic hotel apartment for your Gold Coast holiday. 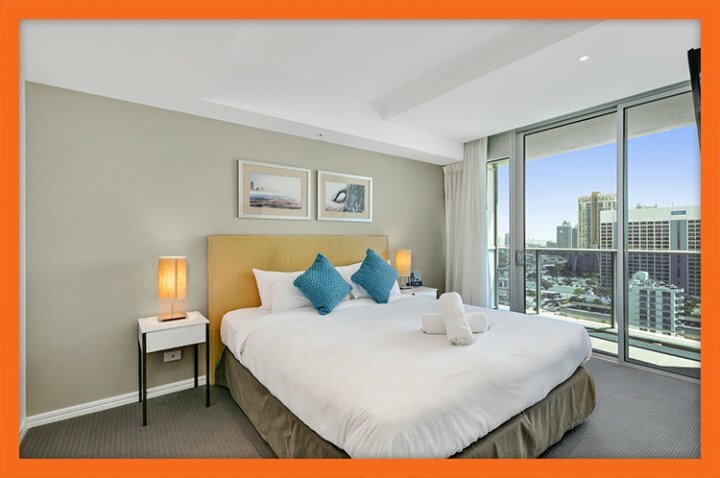 Book your stay with GCHR.com.au today! 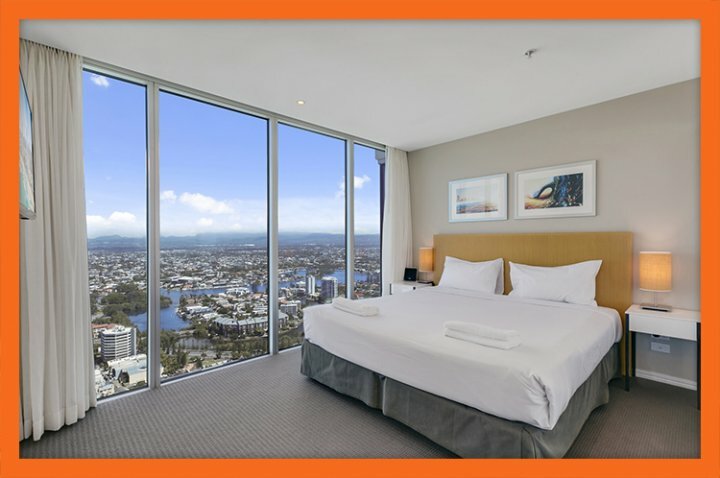 Apartment Overview Are you looking for luxury accommodation in Surfers Paradise at an affordable price Well then, Orchid Residences' Apartment 12804 is perfect for you. 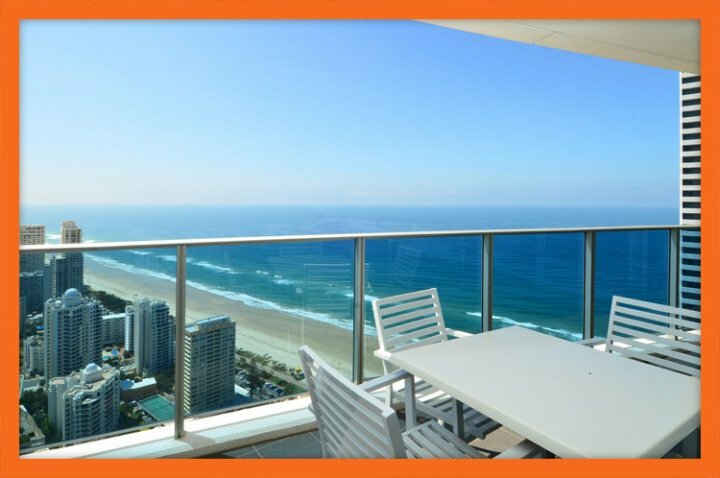 Located in the heart of Surfers Paradise and co-located within one of the most popular 5-star hotels, Apartment 12804 is close to the beach and all major attractions that Surfers Paradise has to offer. 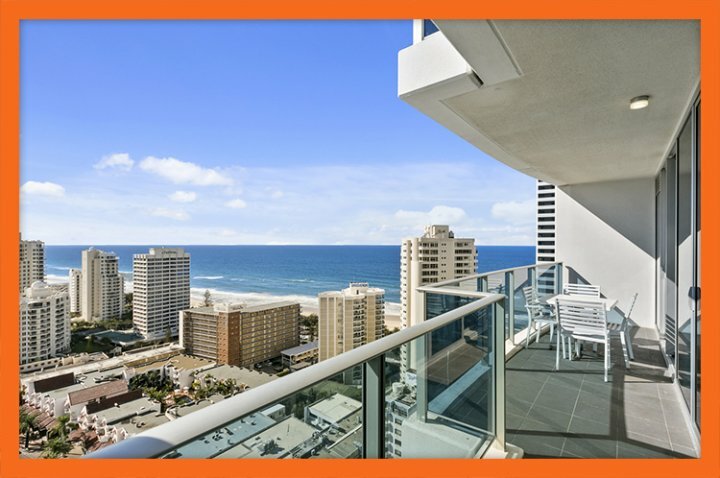 Located atop the 28th level of the hotel's Boulevard Tower, Apartment 12804 offers splendid views of the cosmopolitan area of Surfers Paradise and the beaches. 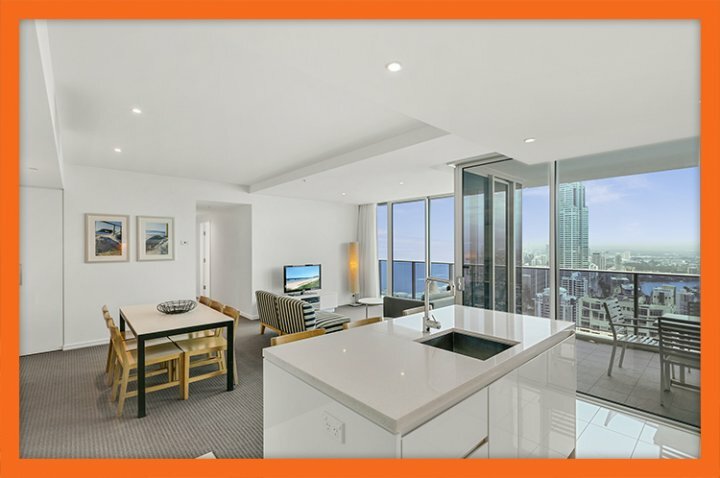 Offering 2 bedroom and 2 bathrooms, this luxury apartment will certainly make your Gold Coast holiday much more pleasurable and enjoyable. Apartment Features Stylish and immaculate, Apartment 12804 definitely offers luxury accommodation which will add to the charm of your holiday experience. This east facing apartment presents a large balcony with magnificent views of the Pacific Ocean and offers a spacious lounge, a gourmet kitchen and a large dining area. The lounge offers you all the entertainment you need, thanks to a large flat panel TV, Premium Foxtel and other entertainment options. If you're looking to stay connected with friends or catch up with some quick work on your holiday, you'll surely appreciate the free Wi-Fi facilities of this apartment. If you choose to stay in Apartment 12804, you will also be provided with a secure undercover parking space for your vehicle at no additional cost. Bedding Configuration The bedrooms of Apartment 12804 are indeed, sophisticated and inviting. The main bedroom of this apartment features a king bed, a TV set and has its very own private ensuite bathroom. 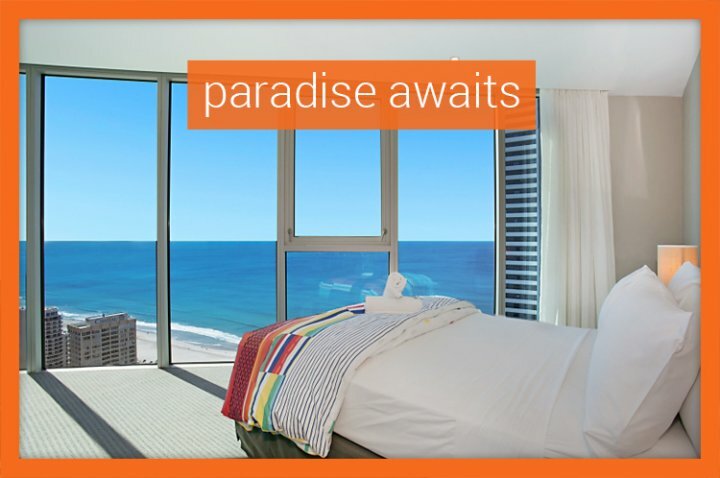 This bedroom has direct access to the balcony for you to enjoy stunning views of the sunrise. 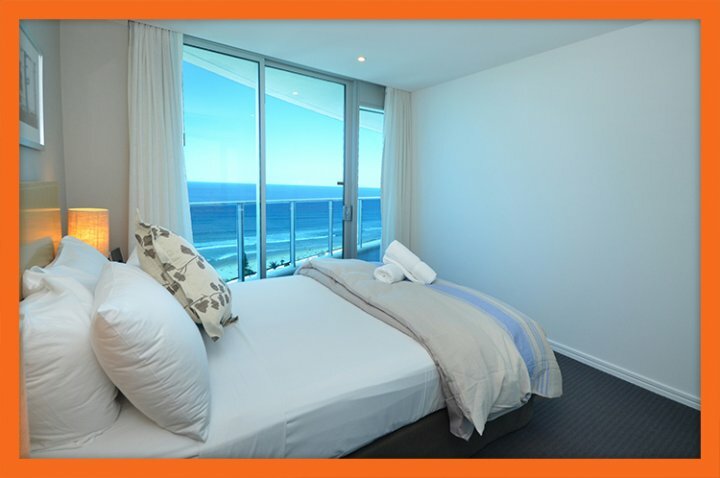 The second bedroom also overlooks the ocean and contains a double bed. Both bedrooms feature walk-in robes. Standard tariffs for Apartment 12804 include 4 people. Given that this apartment is spacious, you can also choose to accommodate 2 extra guests by placing a request when you make your booking. We will charge you a small fee and provide you with two additional rollaway beds. Resort Facilities Should you stay at Apartment 12804, you're definitely in for a treat as you can enjoy all the facilities offered by the hotel as well. Some of the highlights of the resort facilities include different swimming pools for children and adults, a fitness centre, a bar, open entertainment areas, a spa and a sauna and much more! 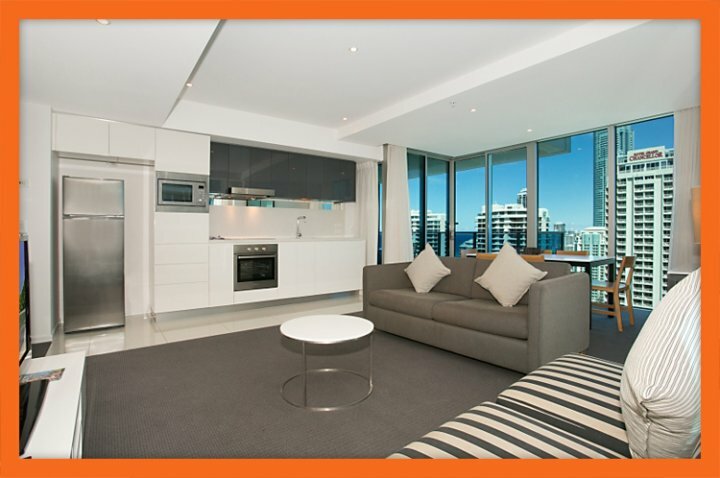 Luxury accommodation in Surfers Paradise does not get much better than Orchid Residences' Apartment 12804. 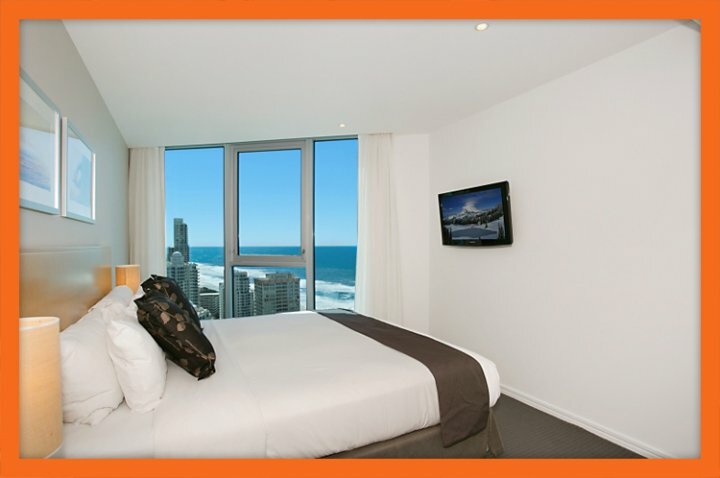 Apartment Overview If you're visiting Surfers Paradise but are worried about spending a fortune on your accommodation, you needn't worry. 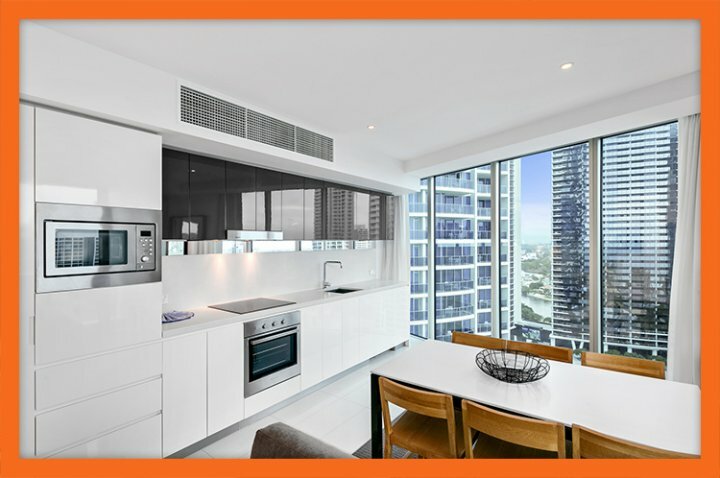 Apartment 12904 at Orchid Residences, which is co-located in one of the most popular Surfers Paradise hotels, has you covered. 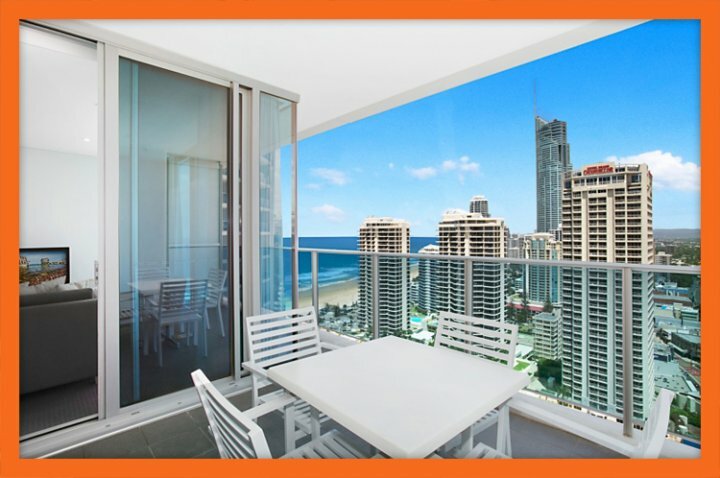 It offers you the convenience of being centrally located in Surfers Paradise, close to the beaches and other major attractions of the area. 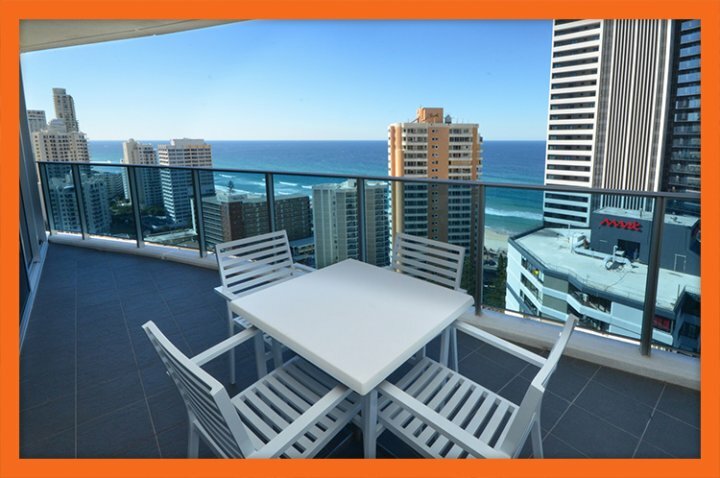 Apartment 12904 sits on the 29th level of the hotel's Boulevard Tower, far above the hustle bustle of Surfers Paradise, but it is still within walking distance from the beach. This 2 bedroom apartment with 2 bathrooms certainly offers great value for money and you'll certainly find it difficult to find another holiday apartment which has so much to offer. 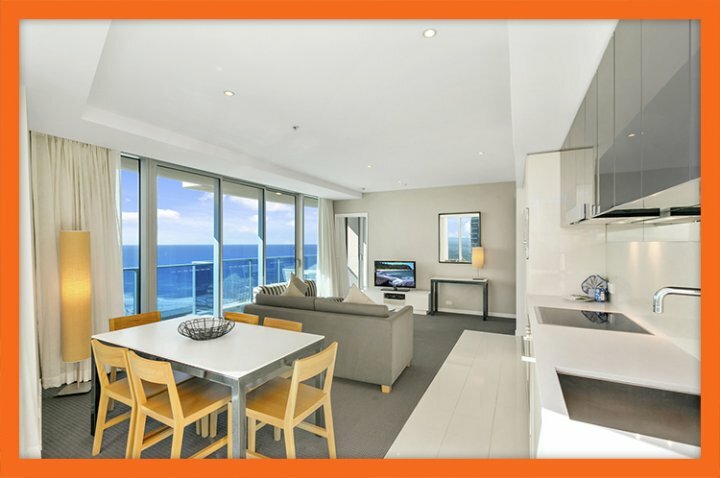 Apartment Features Apartment 12904 is designed to offer you everything you need for an indulgent holiday. 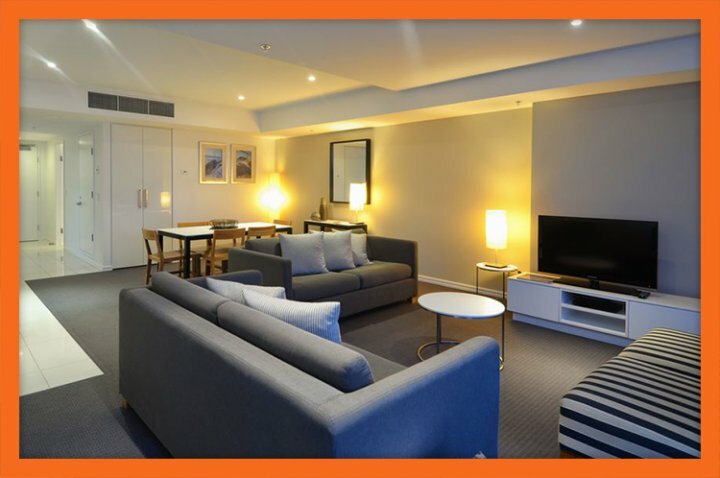 The lounge features comfortable sofas and chairs and includes Premium Foxtel at no additional charge. Unlimited Wi-Fi is also offered in this apartment, free of cost. One of the best things about Apartment 12904 is its large balcony, which offers unobstructed views of the Pacific Ocean. The balcony is equipped with tables and chairs for you to enjoy a fine alfresco dining experience. 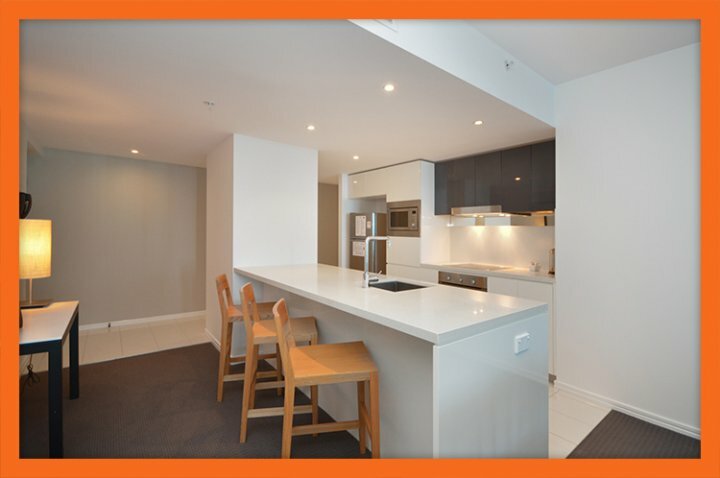 Apartment 12904 also features a fully-equipped gourmet kitchen and a large dining area. Laundry facilities are available in the apartment so you need not pack clothes for each day of your stay. You will also be provided with a secure undercover parking space for your car, completely free of cost. Bedding Configuration The immaculate bedrooms of Apartment 12904 are sophisticated to say the least. Elegant and inviting, both bedrooms offer surreal views of the ocean. 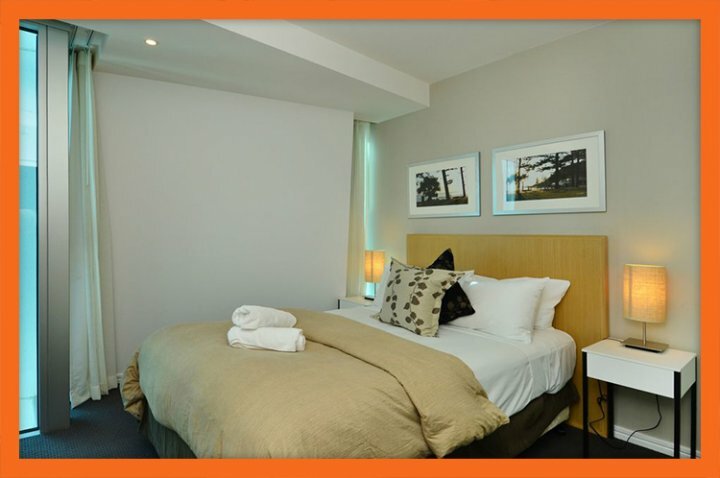 The master bedroom has a king bed, a TV set, its very own private ensuite bathroom and opens out to the balcony. The second bedroom is equipped with a double bed and also has direct access to the main bathroom. While the tariff includes up to 4 guests, it can sleep an additional 2 guests, provided you make a request at the time of booking the apartment. We provide additional rollaway beds at a small surcharge fee. Resort Facilities Orchid Residences is co-located within a world-class 5 star hotel. Should you choose to stay in Apartment 12904, you will also be able to enjoy all hotel facilities, including swimming pools, a spa and a sauna, a gymnasium and fitness centre, open BBQ and entertainment areas, a theatre and a bar and restaurants, among many others. No wonder the hotel is internationally acclaimed. So why look elsewhere Apartment 12904 at Orchid Residences offers you everything that you need from your holiday accommodation. 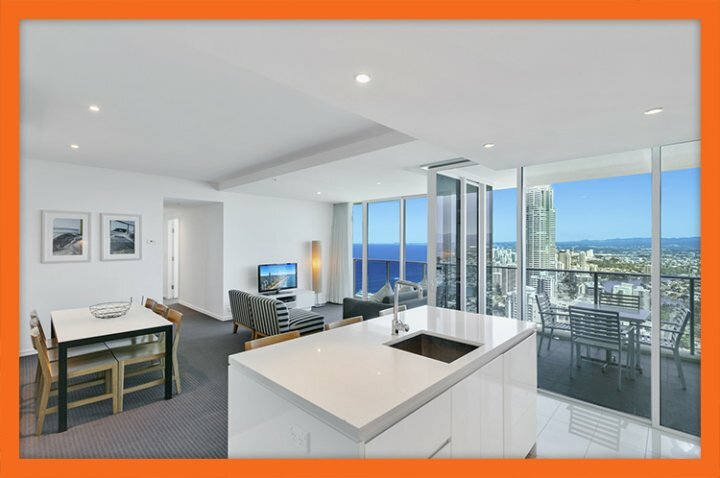 Apartment Overview Apartment 13005 at the Orchid Residences is certainly not to be overlooked co-located in one of Surfer Paradise's best 5-star hotel metres from Surfers Paradise beach boasting luxury accommodation fit for a celebrity - all at prices you CAN afford. Elegant and spacious, Apartment 13005 is a 3 bedroom 2 bathroom apartment that is located on the 30th level of Orchid Residences' Boulevard Tower. 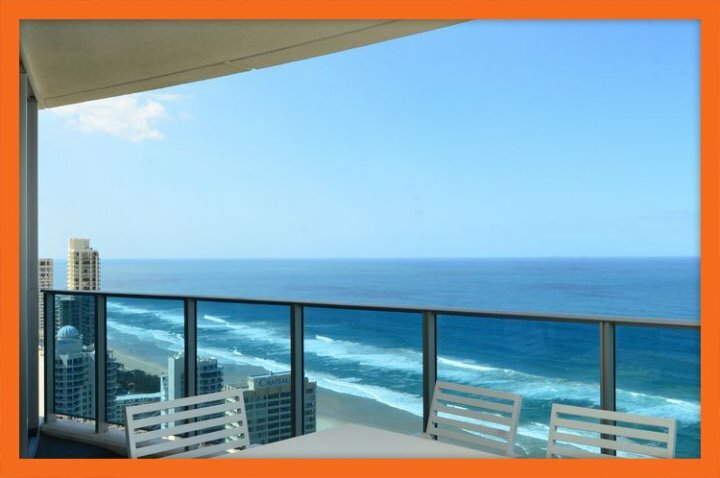 Offering stunning views of the Gold Coast beaches and hinterland, it is ideal for a family or a large group of friends looking to enjoy a holiday in Surfers Paradise. 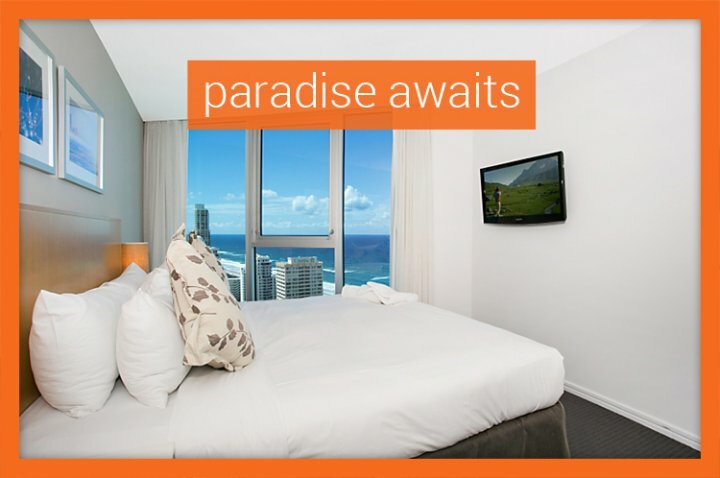 Enjoy Surfers Paradise accommodation that is walking distance from the beach, Cavill Avenue and the very best that Surfers Paradise has to offer. 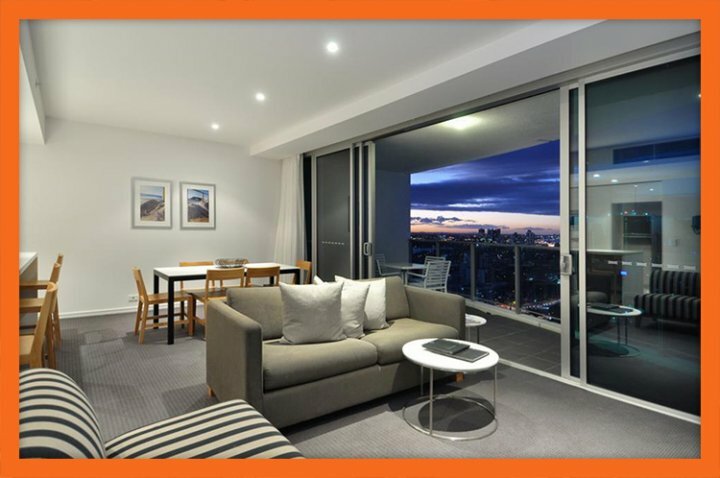 Apartment Features Given that Apartment 13005 is located in a 5 star hotel you can expect nothing less than first-class luxury accommodation from your apartment. The apartment features a large living area, which is complete with a lounge, a kitchen and a dining area and also includes a sprawling balcony. The lounge area is designed to offer you quality relaxation and comfort. 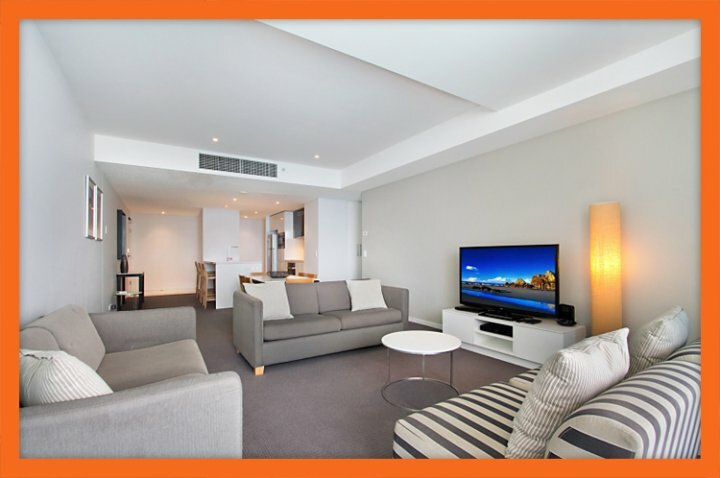 Equipped with sofas, the lounge includes various entertainment systems, with Premium Foxtel provided completely free of cost. Free Wi-Fi is also provided, so you can stay in touch with your friends or get some work done on your holiday. The fully-equipped gourmet kitchen is another highlight of this apartment, where you can choose to cook any meal, large or small. A free secure parking space is also provided along with Apartment 13005. 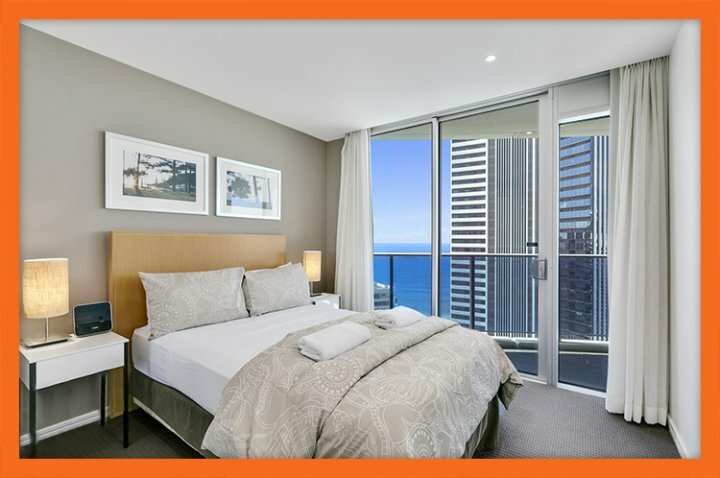 Bedding Configuration All three bedrooms of Apartment 13005 are charming, inviting and boast of immaculate interiors, while also offering splendid views of the ocean and the hinterland. The master bedroom contains a queen bed, a private ensuite bathroom, a TV set for your entertainment and also opens out to the balcony. Both the second and the third bedrooms contain double beds and share access to the main bathroom. 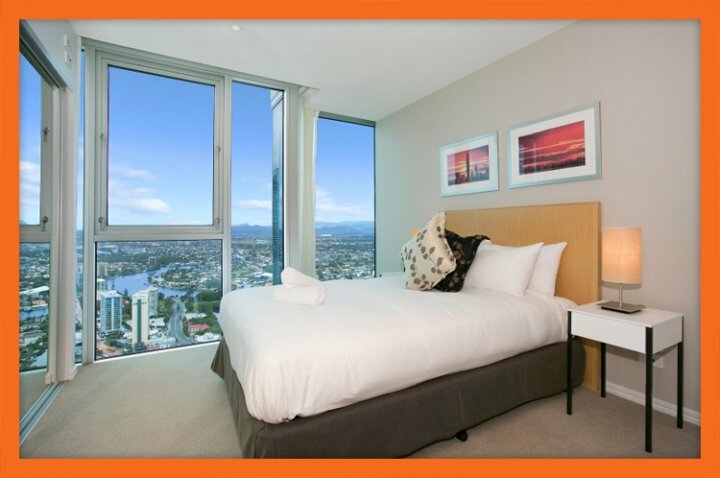 Standard tariffs for Apartment 13005 sleep up to 6 people, but for a small additional fee the apartment can sleep up to 8 guests simply make a request upon booking the apartment and foldaway beds will be provided. Resort Facilities Co-located within an internationally acclaimed hotel, Orchid Residences offers you all the facilities you could wish for from a 5 star holiday experience. Your kids will love the splash pool, while adults can enjoy lounging in the plunge pool and bar. A 24/7 fitness centre for health enthusiasts is also provided. Other attractions of this hotel include outdoor and indoor swimming pools, a spa and a sauna, a theatre and restaurants, among others. 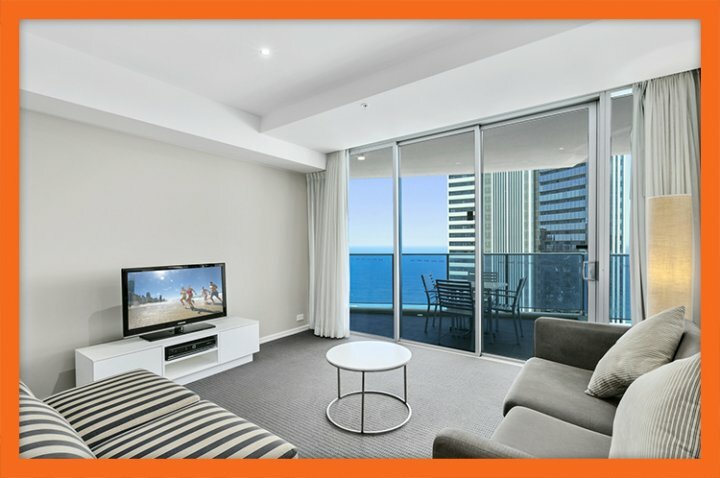 For the best possible holiday, choose Apartment 13005 at Orchid Residences for your luxury accommodation in Surfers Paradise. 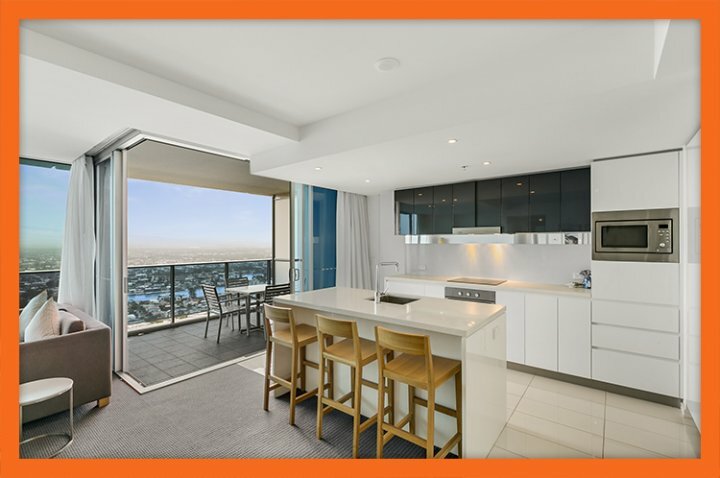 Apartment Overview For a relaxing Gold Coast holiday, you'll do no better than to book a stay in the ultra-stylish Apartment 21602 at Orchid Residences. 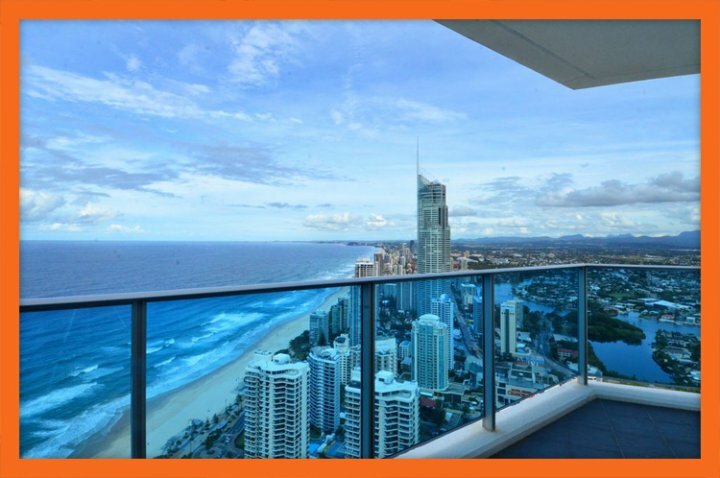 Located on the 16th floor of one of the Gold Coast's most famous 5 star hotels, Apartment 21602 is a luxurious 2 bedroom apartment that boasts amazing views, world-class luxury and a prime location that is second to none. 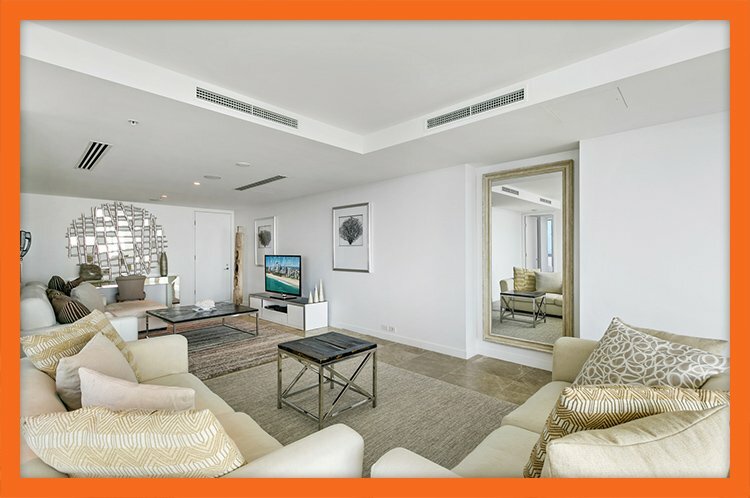 Expect nothing less than a lavish holiday experience when you choose to stay in Orchid Residences' Apartment 21602. Apartment Features Apartment 21602 really does have the lot! This well-appointed north facing hotel apartment offers spectacular views of the Pacific Ocean and boasts a modern open-plan design. It is specious and fully self-contained. Therefore, it is equipped with a gourmet kitchen and laundry facilities for a very convenient stay. Other features of the apartment include a separate living and dining area, a private balcony, a bathroom and ensuite bathroom. 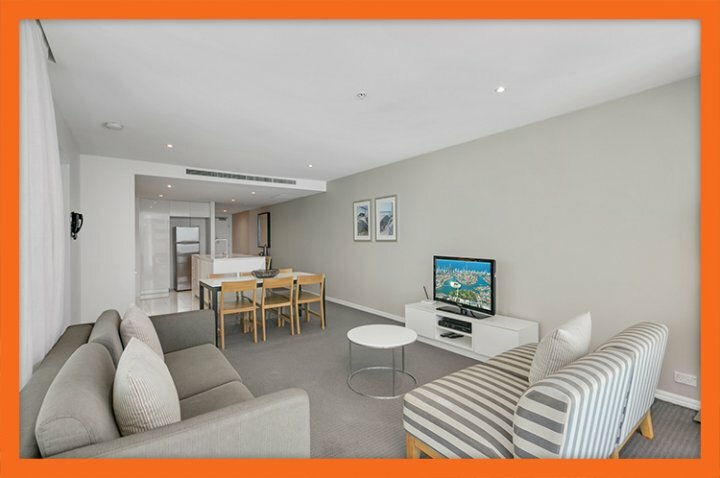 Moreover, Apartment 21602 is also equipped with Premium Foxtel and unlimited Wi-Fi connectivity throughout your stay at no extra cost! Bedding Configuration Apartment 21602 features two spacious bedrooms that each sleeps two guests. 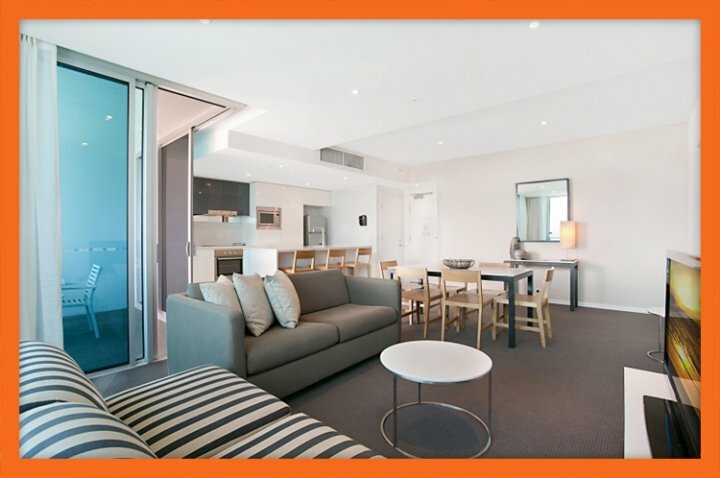 However, an additional two guests can be accommodated in the apartment for a small fee. The master bedroom contains a king bed and television. 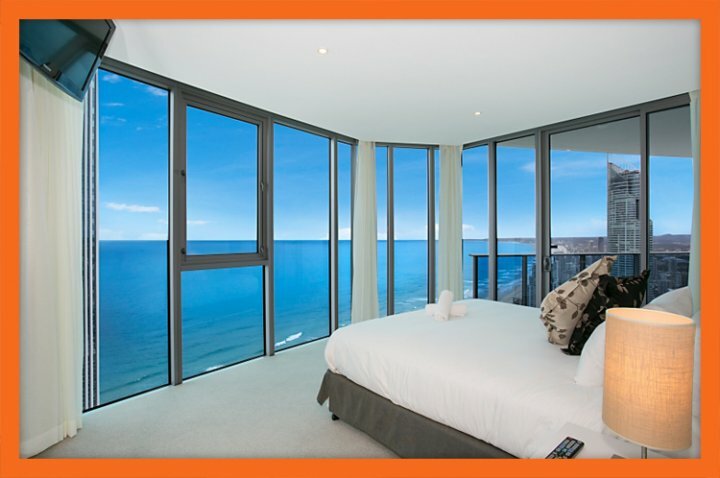 It also features floor to ceiling widows that emphasis the great ocean views, a walk-in robe and an ensuite bathroom. The second bedroom features two single beds, equally great views and a large built-in robe. Resort Facilities As a guest of GCHR.com.au, you also have complete access to the hotels 5 star facilities. This includes access to 4 swimming pools including a pool bar, a 24/7 fitness centre, a spa and sauna, along with the poolside BBQ area and much more. The hotel also features two great bars and a restaurant that is highly recommended. With your booking you also receive a free car parking space. 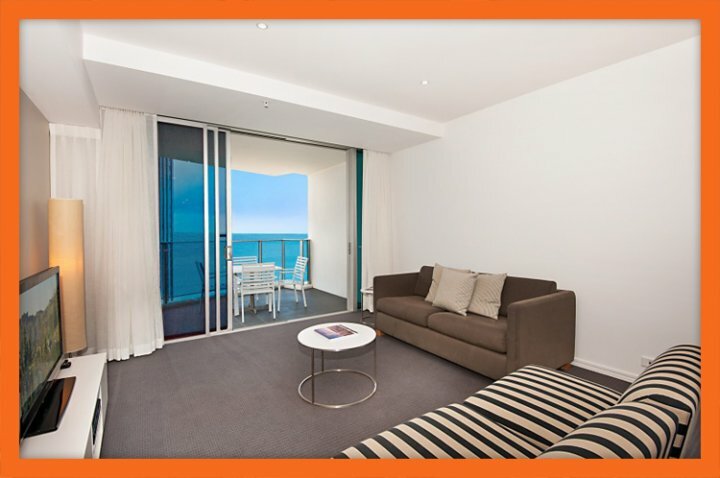 Apartment Overview Orchid Residences, Apartment 21801 is a 2 bedroom, 2 bathroom holiday apartment that sleeps 4-6 guests. 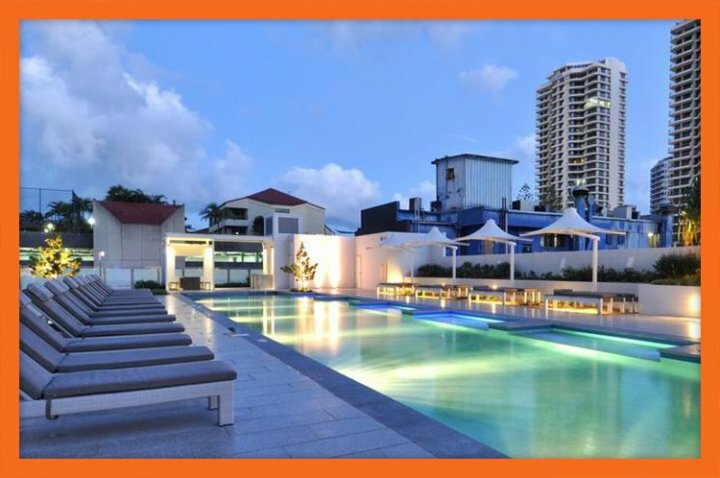 It is located on Orchid Avenue in the heart of Surfers Paradise, just 350 metres from Surfers Paradise Beach and 220 metres from Cavill Avenue. Apartment 21801 is located on the 18th floor and is north facing. 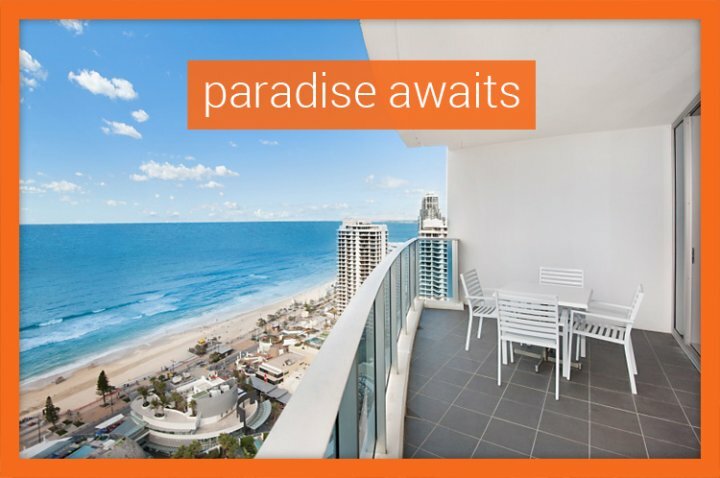 It offers spectacular views of the Pacific Ocean and Surfers Paradise Beach, which can be enjoyed from a large private balcony. 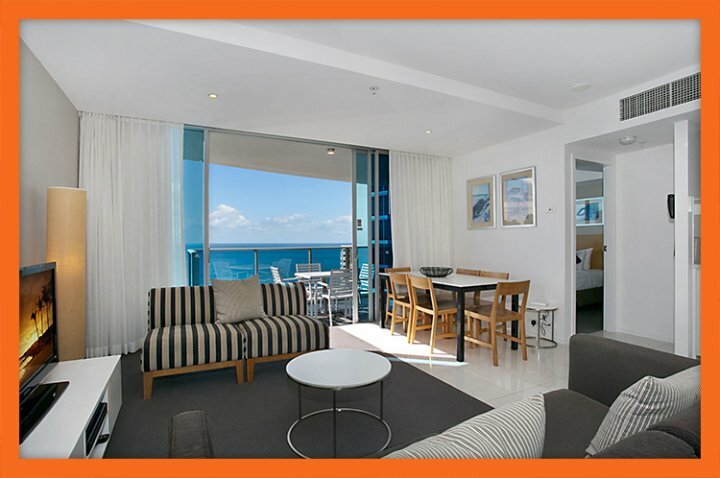 Apartment Features Apartment 21801 is a luxurious 2 bedroom holiday apartment that offers self-contained accommodation. It features a fully-equipped gourmet kitchen, separate dining and living areas and a laundry. 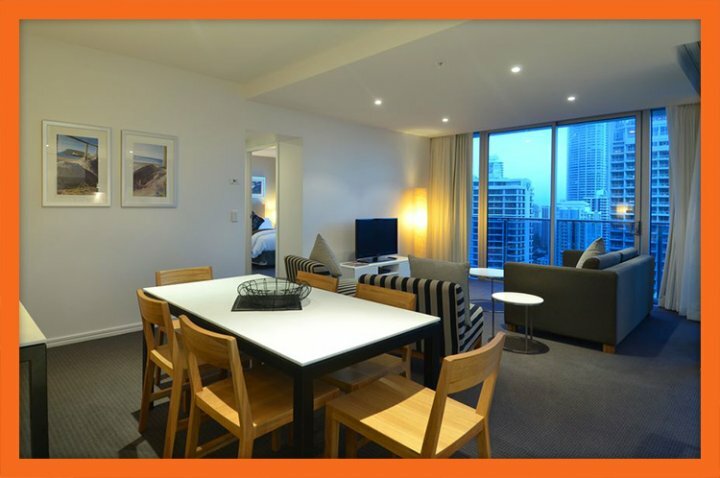 The apartment is fully air-conditioned and features flat panel TV, Foxtel Premium, DVD player, entertainment system and free Wi-Fi throughout the apartment. A free parking space is also provided with each booking. Bedding Configuration Apartment 21801 features 2 bedrooms. The master features a king size bed, built-in robe and an ensuite bathroom, while the second bedroom features a double bed and built-in robe. 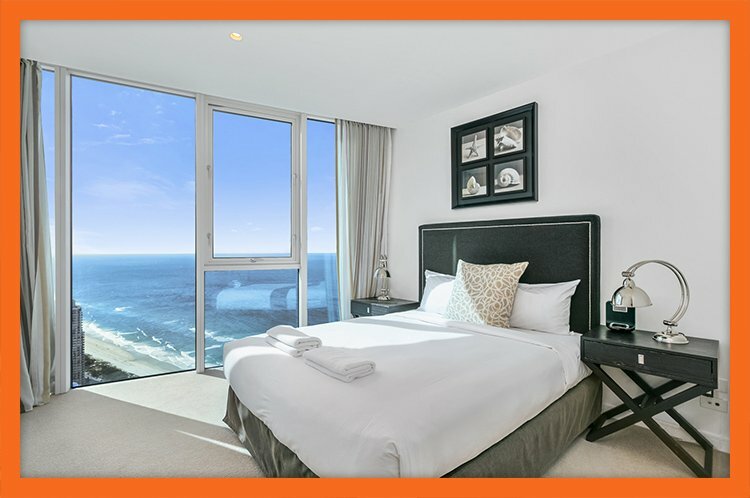 The master bedroom provides balcony access and great views of the ocean and beach, while the second bedroom offers great views across the city. The apartment sleeps 4-6 guests 4 in the tariff and an additional 2 on roll-away beds. Simply make a request at the time of your booking (surcharge applies). Resort Facilities Apartment 21801 is co-located in a 5 star hotel resort. As such, guests have access to facilities of the resort. This includes four pools, two 24/7 gymnasiums, a spa and sauna, an onsite day spa and award-winning restaurant plus much more. With so much to offer, choose Orchid Residences, Apartment 21801 for your holiday accommodation today. 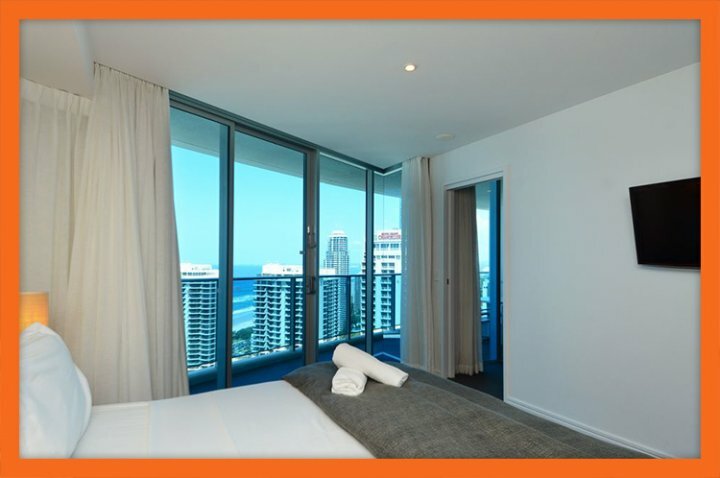 Apartment Overview Orchid Residences' Apartment 21803 is a 2 bedroom apartment that is located on Orchid Avenue in the heart of Surfers Paradise. This lavish apartment is located within one of the finest 5 star hotels therefore expect to have a unique holiday experience that you'll find hard to match. Apartment Features Apartment 21803 is lavish to say the least. 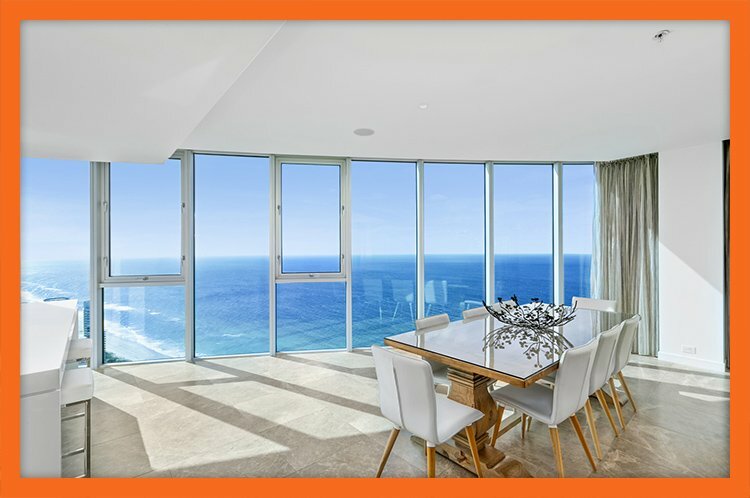 It features modern interiors, an open plan design and breath-taking ocean views across the Pacific Ocean and Surfers Paradise. The separate dining and lounge areas provide all the spaciousness of being in your very own home. The lounge is fully equipped with the finest entertainment solutions including a large flat screen TV equipped with premium Foxtel, a DVD player and free WiFi is also provided. The gourmet kitchen will have you feeling right at home. It is equipped with all utensils and appliances need to create a snack or a 5 course meal. 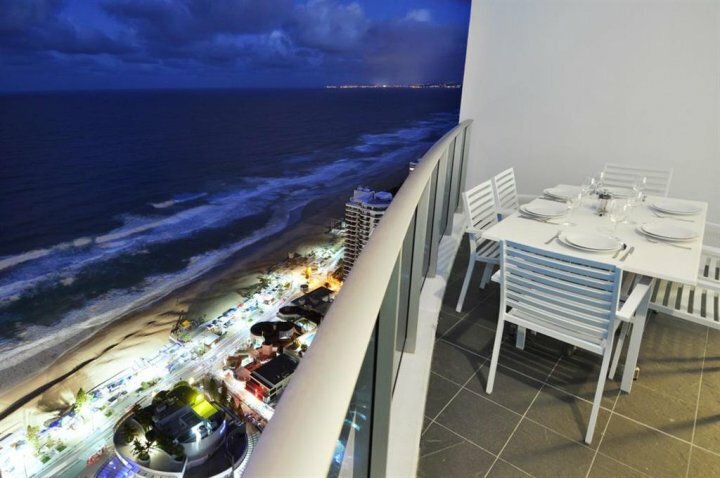 Should you choose to dine in your apartment, take advantage of the balcony and enjoy spectacular views as the sun sets. The apartment also features two bathrooms, full laundry facilities and a free undercover parking space. Bedding Configuration Apartment 21803 features two bedrooms which sleep 4 guests in the tariff and up to 6 (two additional rollaway beds are available for a small fee at the time of your booking. The master bedroom contains a king bed, a walk-in robe and an ensute bathroom. It also boasts superb ocean views. The second bedroom contains a double bed and a built-in robe. 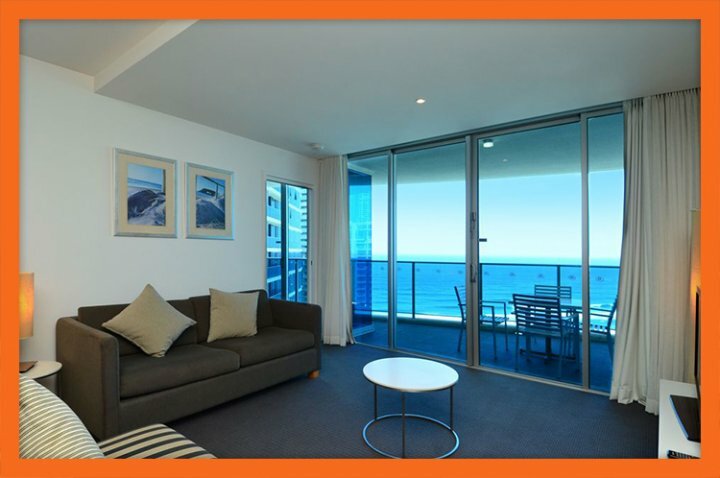 Resort Facilities Apartment 21803 is located within a very well know Surfers Paradise hotel that boasts first-class facilities for your avail. Such facilities include 2 swimming pools, 2 gyms, a spa and sauna, barbeque facilities amongst others. 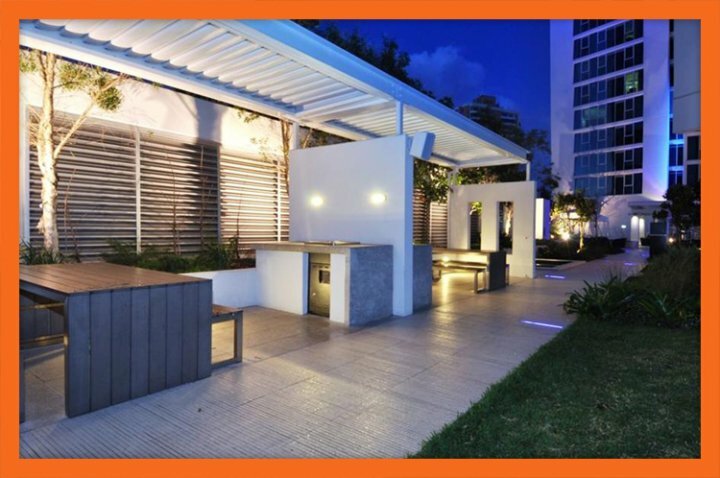 Don't miss out on the unique holiday experience offered by Orchid Residences' Apartment 21803. 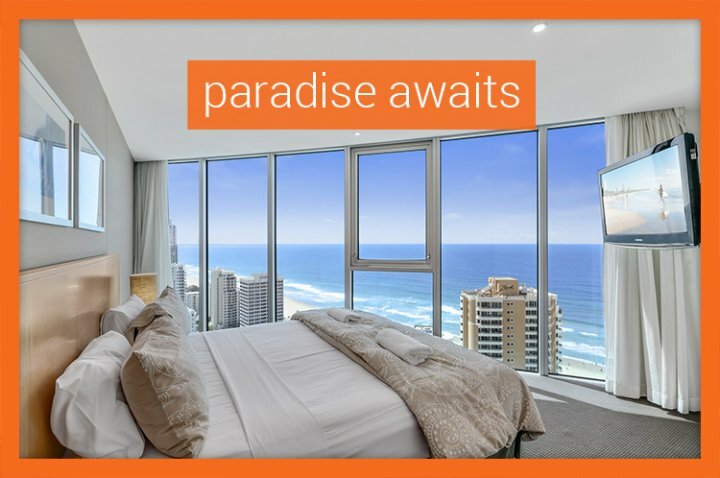 Book today with GCHR.com.au! 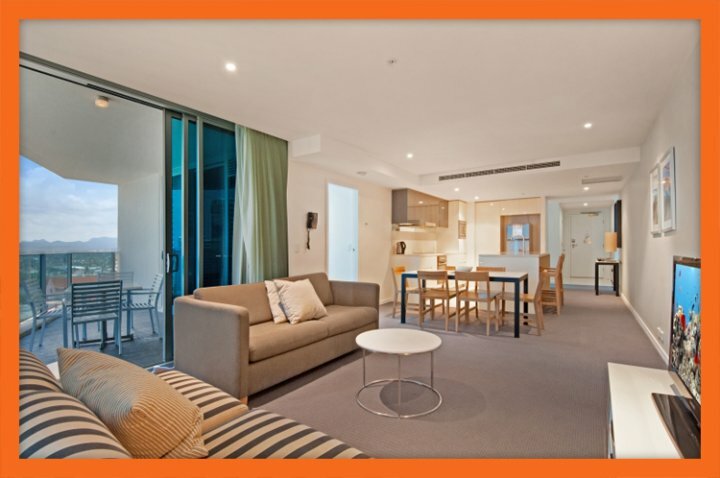 Apartment Overview Orchid Residences, Apartment 21901 is a 2 bedroom, 2 bathroom holiday apartment that sleeps 4-6 guests. 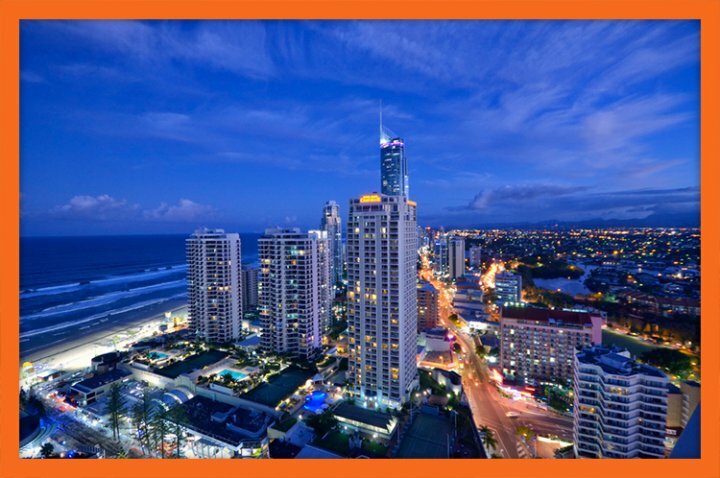 It is located on Orchid Avenue in the heart of Surfers Paradise, just 350 metres from Surfers Paradise Beach and 220 metres from Cavill Avenue. 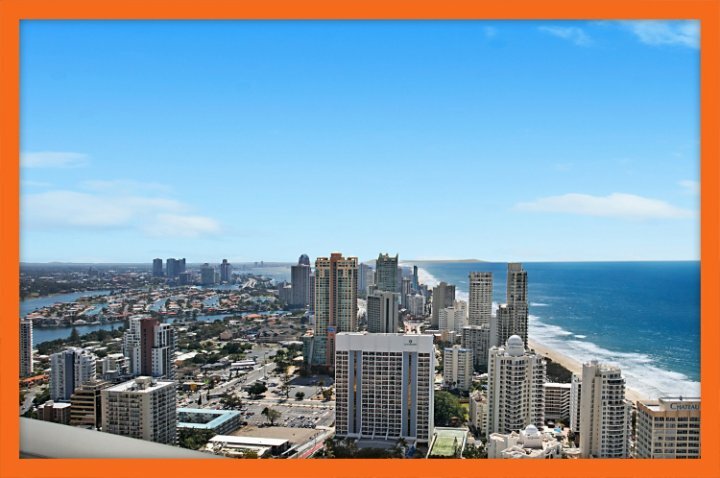 Apartment 21901 is located on the 19th floor of Orchid Residences' Highrise tower and offers spectacular views of the ocean, beach and Gold Coast City. 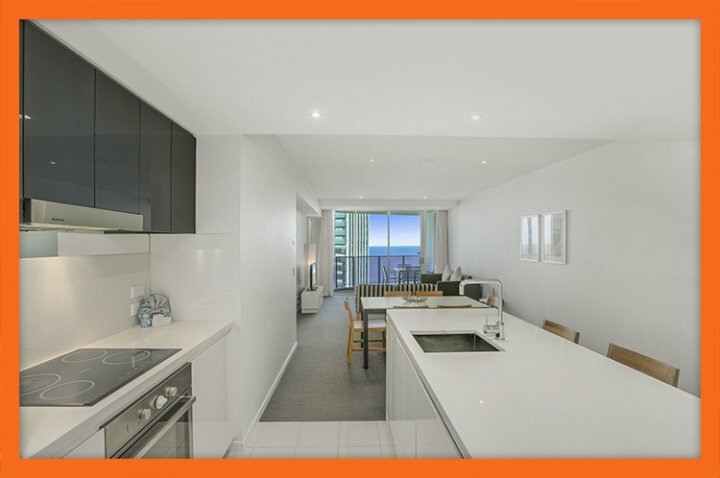 Whether you want to spend time at the beach, go shopping, pamper yourself or enjoy time with the family, this apartment will allow you to do just that. 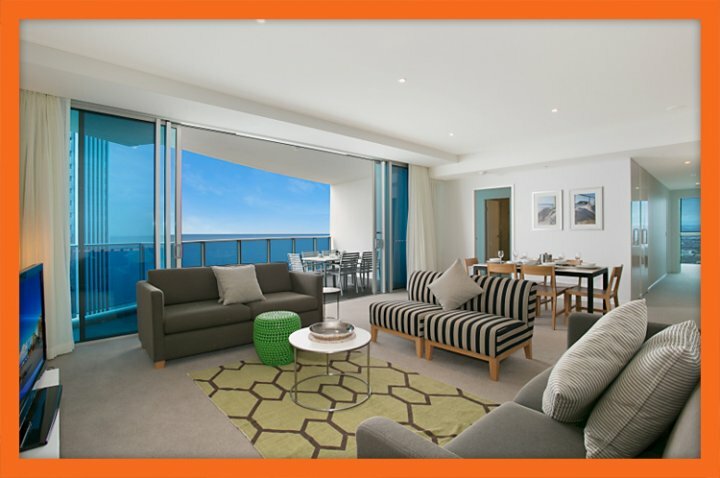 Apartment Features Apartment 21901 is a lavish holiday apartment that offers spacious accommodation for holidaymakers. In addition to 2 bedrooms and 2 bathrooms, it features a fully-equipped kitchen, a separate dining and living area, a large balcony and a laundry. 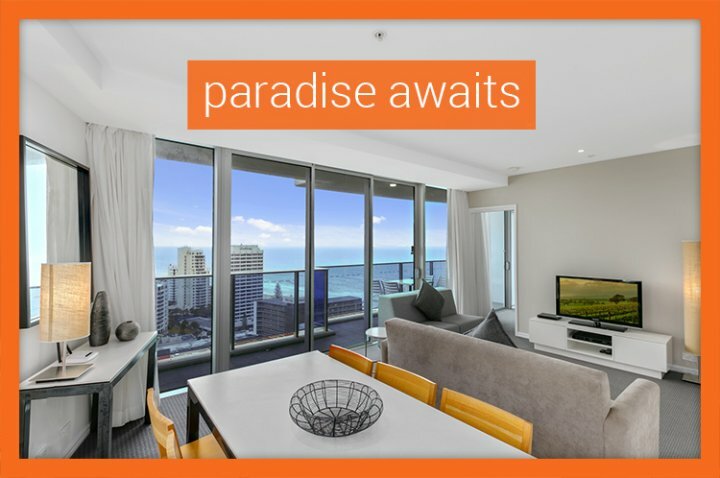 The apartment's best features include the entertainment options provided in the living area flat panel TV, Foxtel Premium, DVD player and entertainment system, along with the spectacular views and the free unlimited Wi-Fi. A free parking space is also provided with each booking. Bedding Configuration Apartment 21901 features 2 roomy bedrooms. The master features a king bed, walk-in robe and an ensuite bathroom, while the second bedroom features a double bed and built-in robe. 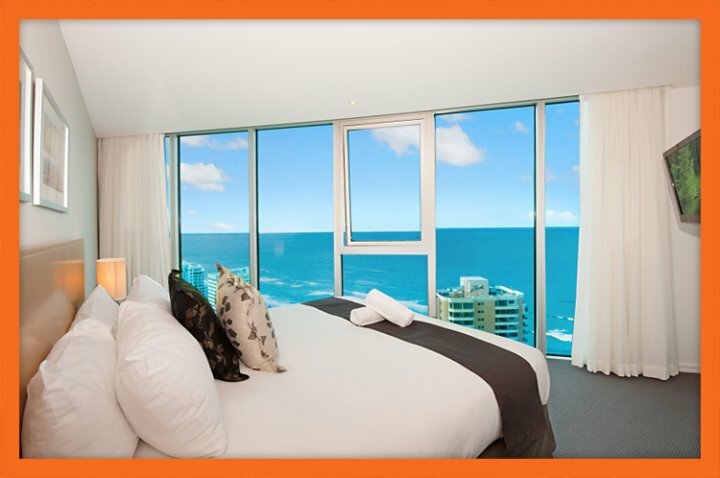 Each bedroom provides balcony access and great views of the ocean, beach and Gold Coast city. The apartment sleeps 4 guests comfortably in the tariff however, it can sleep as many as 8 guests for a small additional fee. Simply place your request for a rollway bed(s) during the booking process. 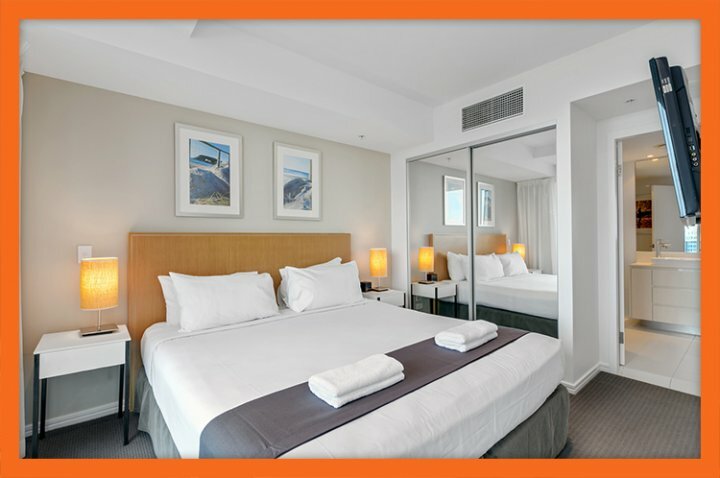 Resort Facilities Apartment 21901 is co-located in one of the Gold Coast's most prestigious hotels, which holds a 5 star rating. As such, you have complete access to the hotel's wonderful facilities. Take a dip on one of the hotel's four pools, work out in one of the two 24 hour gymnasiums, relax in the spa or sauna, get pampered at the hotel's onsite day spa, wine and dine at the hotel's restaurant and bar and catch a movie in the private theatre. 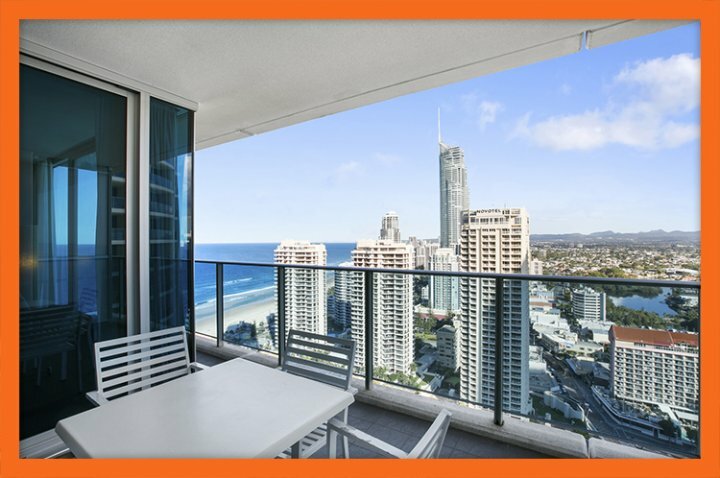 With so much to offer, it's clear to see why Apartment 21901 is such a popular choice with holidaymakers to the Gold Coast. 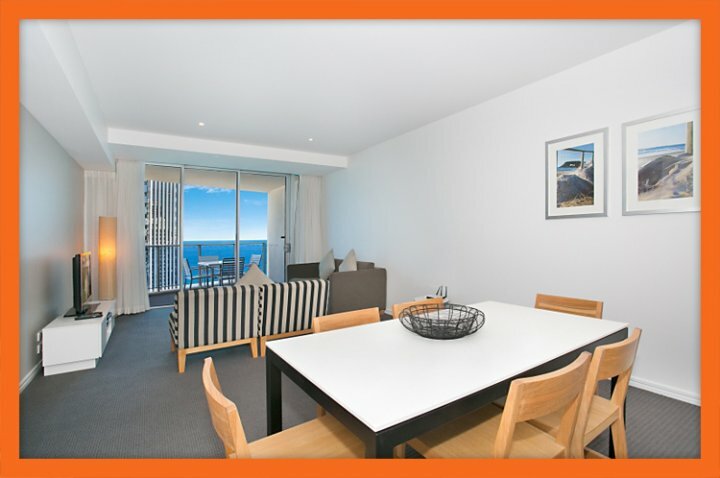 Place yourself in the heart of Surfers Paradise by reserving this holiday apartment today. 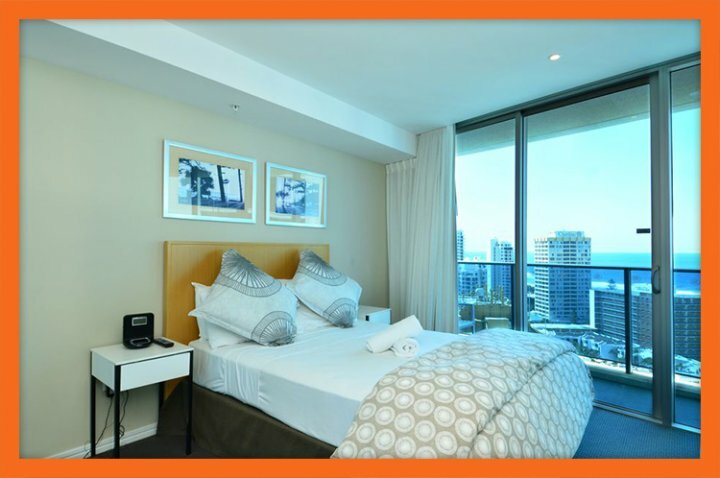 Apartment Overview Apartment 22303 at the Orchid Residences certainly offers you the best in Surfers Paradise accommodation. 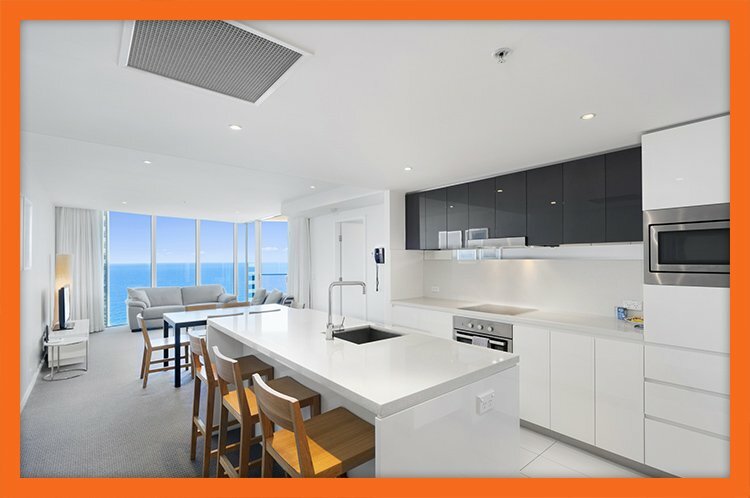 Co-located in a 5 star Surfers Paradise hotel, this luxurious apartment will meet the taste of even the most discerning customers. 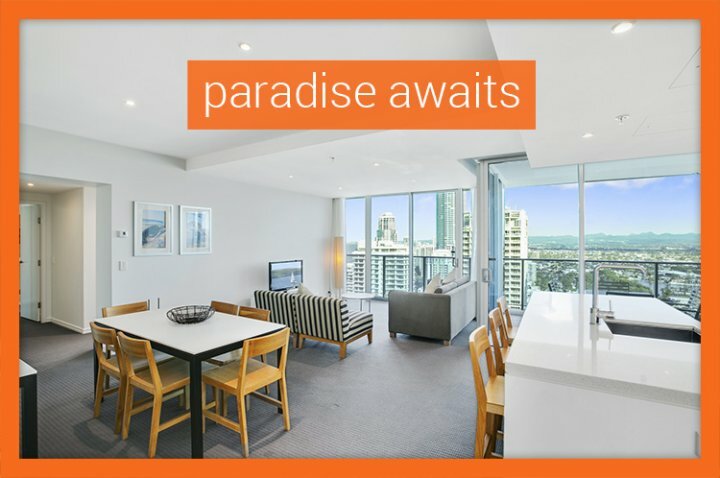 Apartment 22303 boasts 2 bedrooms and 2 bathrooms and is positioned high above Surfers Paradise on the 23rd level of the hotel's Orchid Tower. 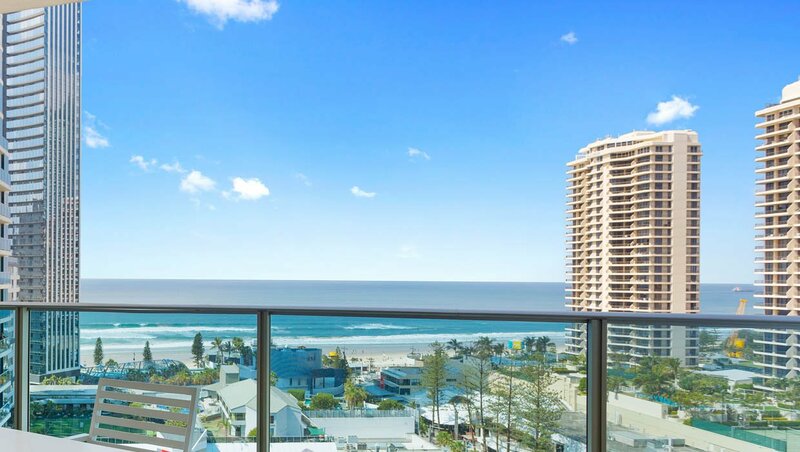 Featuring magnificent views of the beaches, this apartment is ideal for a couple or a small family looking for luxurious, yet affordable Surfers Paradise accommodation. 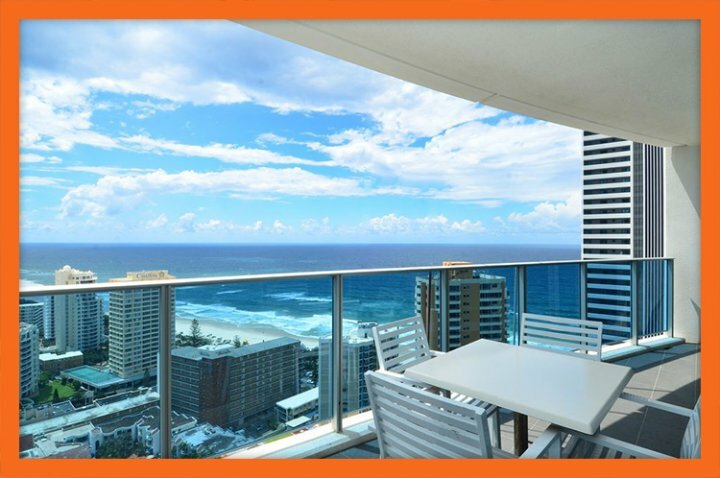 Apartment Features Being located in a 5 star Surfers Paradise hotel, Apartment 22303 boasts of world class features and facilities that you are sure to love! The Apartment includes a sprawling living area, complete with a fabulous and fully equipped kitchen as well as a separate area for dining. 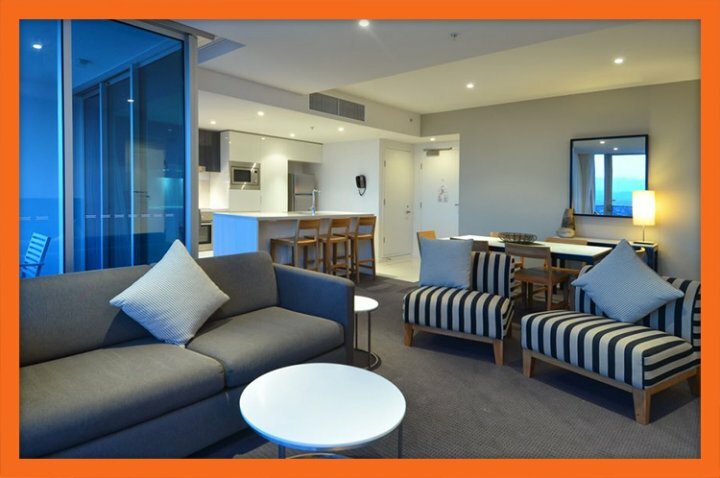 The lounge area features comfortable sofas and chairs and is the perfect spot to relax after a day out in Surfers Paradise. 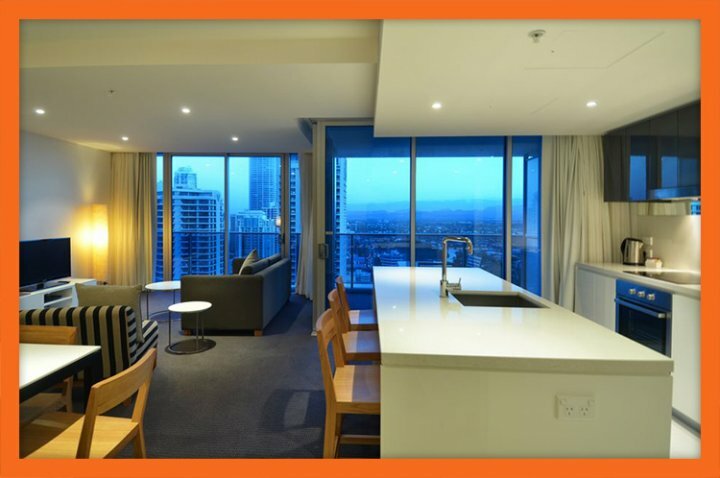 With entertainment options, Wi-Fi and Foxtel Premium offered at no additional charge, you are sure to enjoy your stay in Apartment 22303. A large balcony connects to the living area, which is also equipped with an outdoor table and chairs for you to enjoy an alfresco dining experience, while admiring majestic views of the ocean. Free secure parking for your vehicle is another highlight of Apartment 22303. Bedding Configuration The bedrooms of Apartment 22303 are beautifully designed and inviting to say the least. Both bedrooms offer grand views of the ocean and pristine interiors. The main bedroom contains a king bed, a TV and also has its very own private ensuite bathroom. The second bedroom includes a double bed and has access to the main bathroom. While the standard tariff for Apartment 22303 includes up to 4 guests, it is spacious enough to accommodate 2 additional guests, provided you place a request at the time of booking the apartment. 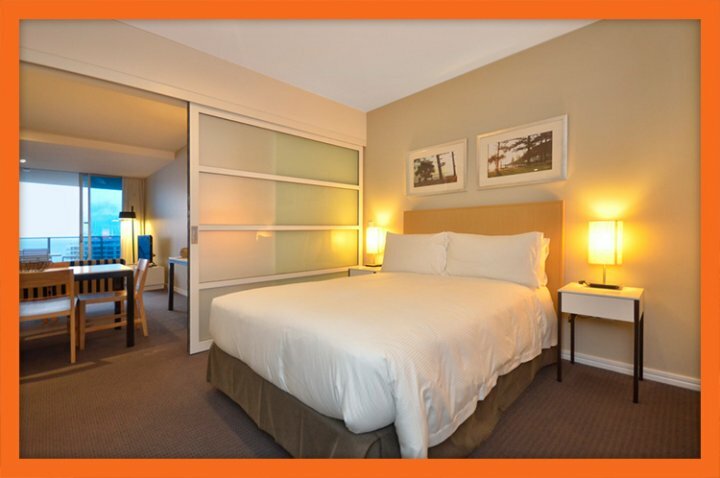 We provide additional foldaway beds at a small surcharge fee. 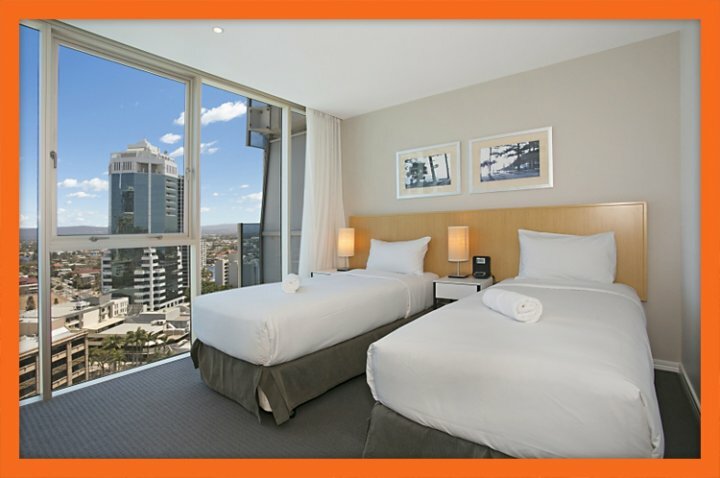 Resort Facilities Apartment 22303 is co-located within an internationally acclaimed Surfers Paradise hotel, so you can expect 5 star facilities should you choose to stay here. Kids will love playing around in the splash pool while adults can enjoy a drink at the bar, or lounge in the plunge pool. The resort includes a gymnasium and a fitness centre for health enthusiasts and also features a spa and a sauna. A private theatre and restaurants are some of the other highlights of the resort facilities. 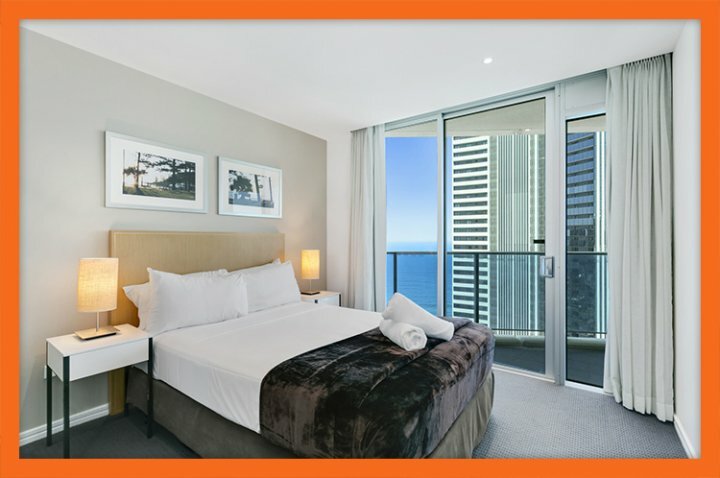 For luxury accommodation at prices you can afford, choose Orchid Residences' Apartment 22303 as your Surfers Paradise holiday accommodation. 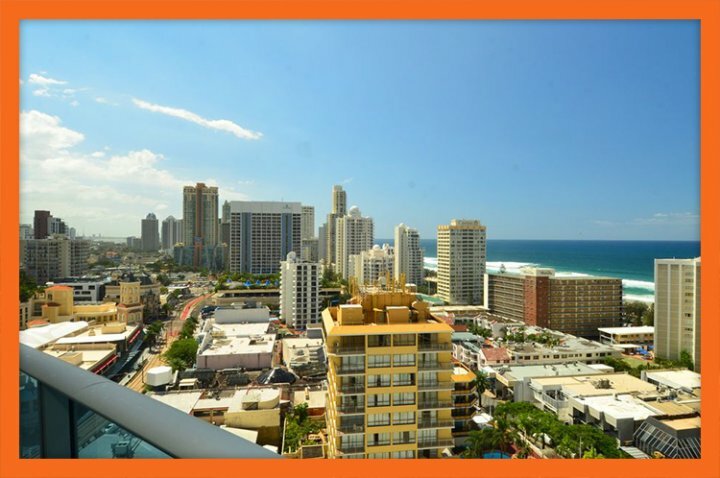 Apartment Overview Apartment 22305 is co-located within a well-known 5 star hotel and is located metres from Surfers Paradise beach. 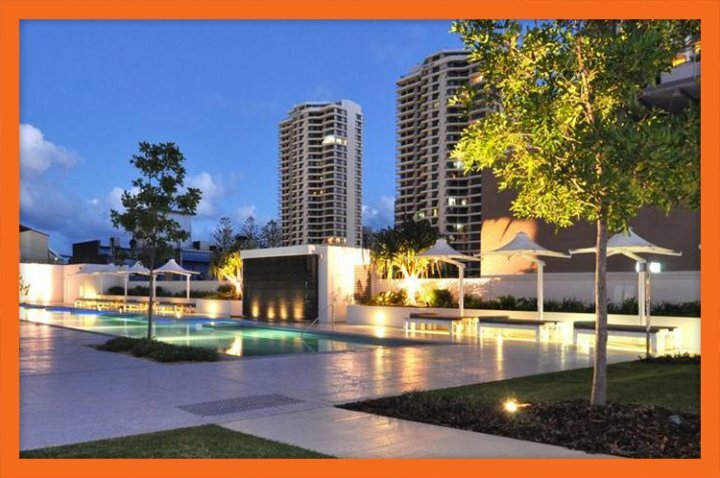 This classy 2 bedroom, 2 bathroom apartment is set on the 23rd level of Orchid Residences and boasts of world-class facilities and surreal views of the Gold Coast beaches. 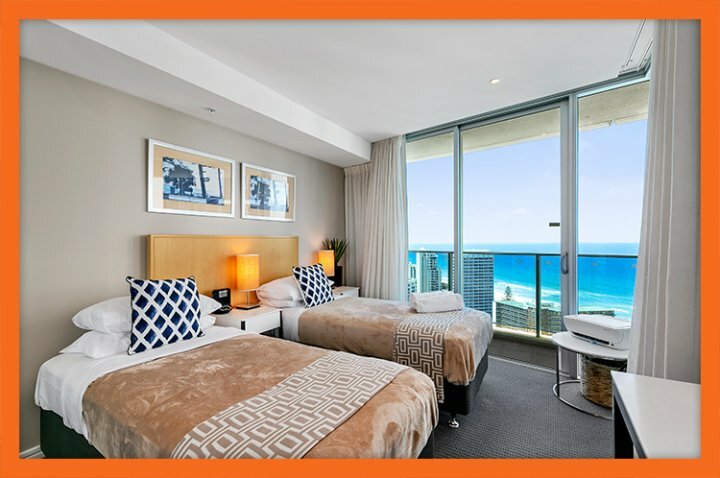 Apartment Features Should you choose Apartment 22305 as your Surfers Paradise accommodation, you can expect nothing but the best from your apartment, as it is co-located with an internationally acclaimed 5 star hotel. 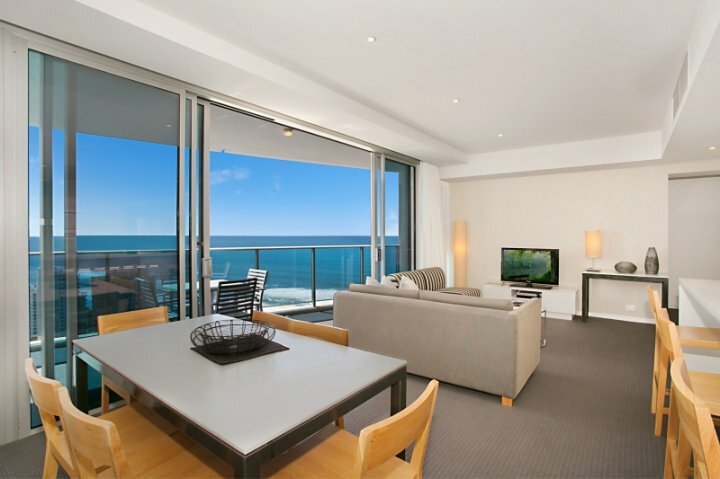 This apartment proves to be the perfect retreat when you're not out exploring Surfers Paradise. 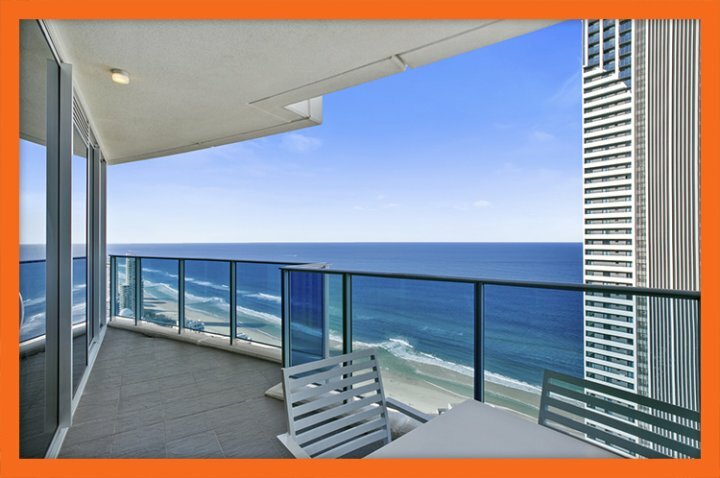 Enjoy a roomy living area, a fully equipped gourmet kitchen, an open plan dining area and a sprawling balcony, which offers great views of Surfers Paradise and the beaches. 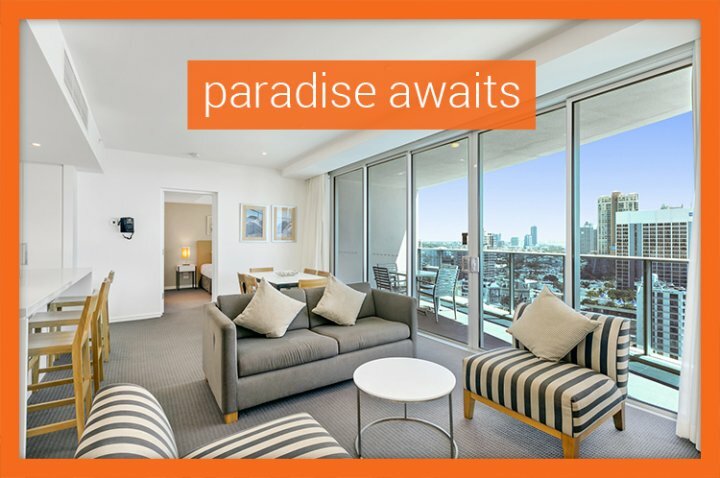 Other highlights of this apartment include free unlimited Wi-Fi, a secure undercover parking space and various entertainment options, complete with Foxtel Premium at no additional charge. 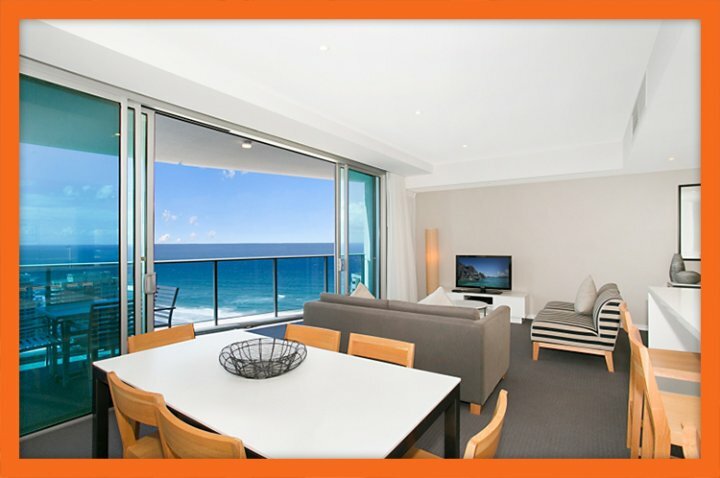 You certainly cannot wish more from accommodation in Surfers Paradise. While you get to enjoy a royal lifestyle in Apartment 22305, you'll also notice an opportunity to save a few bucks by cooking your own meals. Thanks to the gourmet kitchen, this is an easy task. 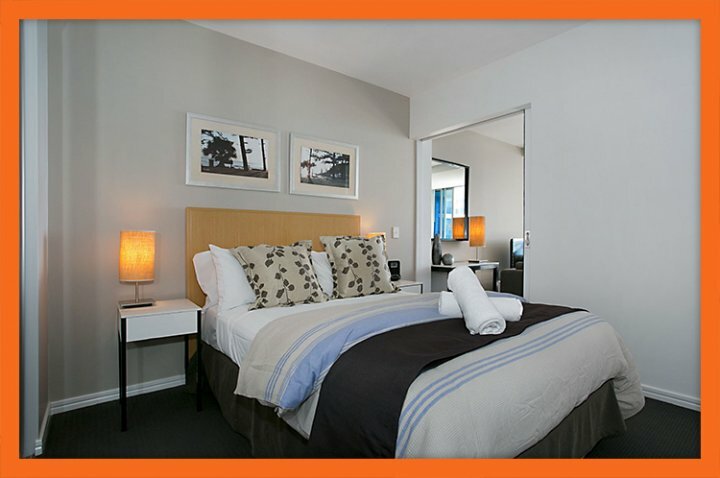 Laundry facilities, linen and towels are also provided. Bedding Configuration Both bedrooms of Apartment 22305 are exquisitely designed to make your holiday more relaxing and comfortable. The master bedroom includes a king bed and features an elegant private ensuite bathroom. This bedroom also opens out to the balcony, allowing you to wake up to stunning views of the sunrise. 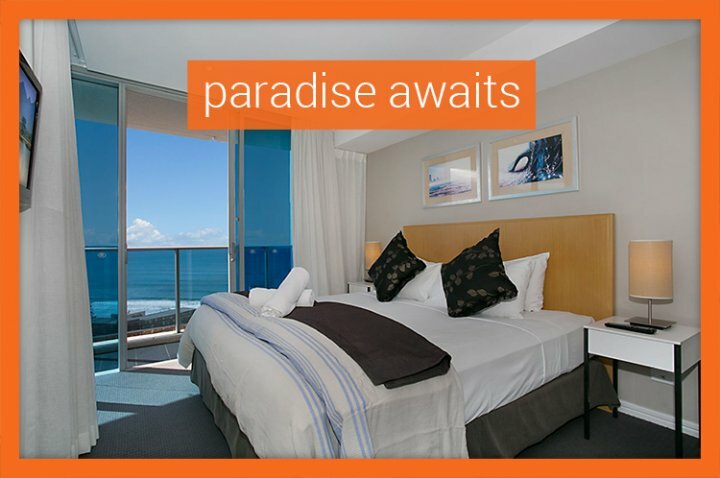 The second bedroom also overlooks the ocean and is equipped with a double bed. Four guests are including in the tariff however, for a small additional fee, you can accommodate two extra guests. 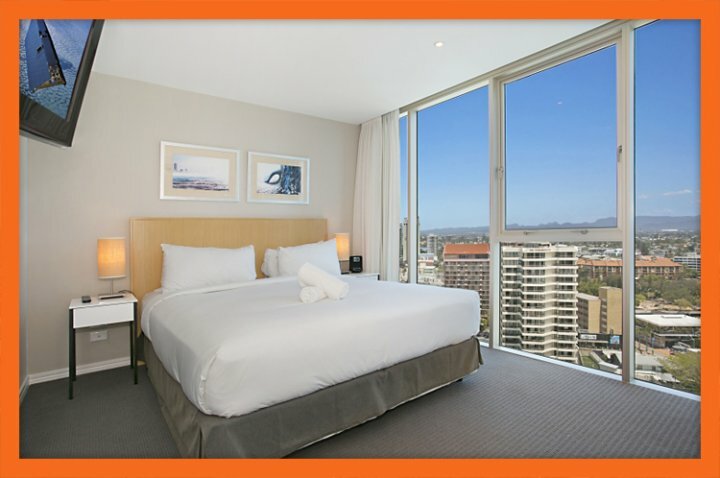 Simple place a request when booking the apartment and we will provide extra foldaway beds for your guests. Resort Facilities As Orchid Residences is co-located within a 5 star hotel, so you can expect world-class facilities when you stay here. If you're a family, your kids will definitely enjoy splashing around in the children's pool, while the adults can have a fun time in the plunge pool which also features a bar. Other highlights of the resort include an open entertainment area, a 24/7 fitness centre, a spa and a sauna, a number of swimming pools, a choice of restaurants and even a private theatre. You couldn't possibly wish for more from a holiday resort! 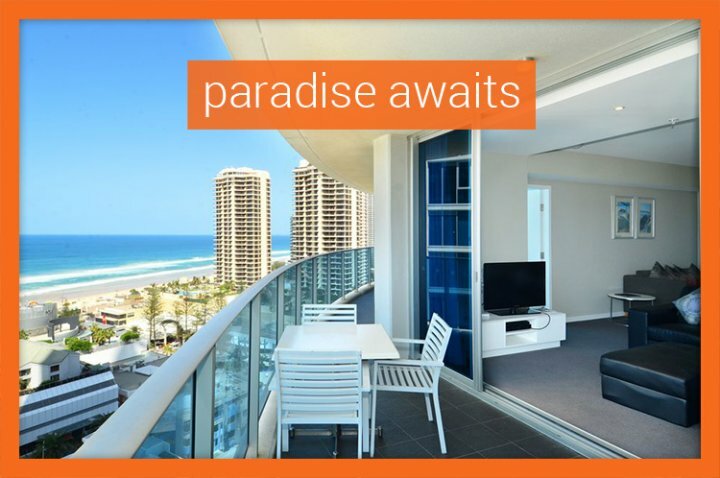 Enjoy quality and luxurious Surfers Paradise accommodation, close to all major tourist attractions - only at Apartment 22305 at the Orchid Residences. Apartment Overview Orchid Residences' Apartment 22306 redefines luxury. 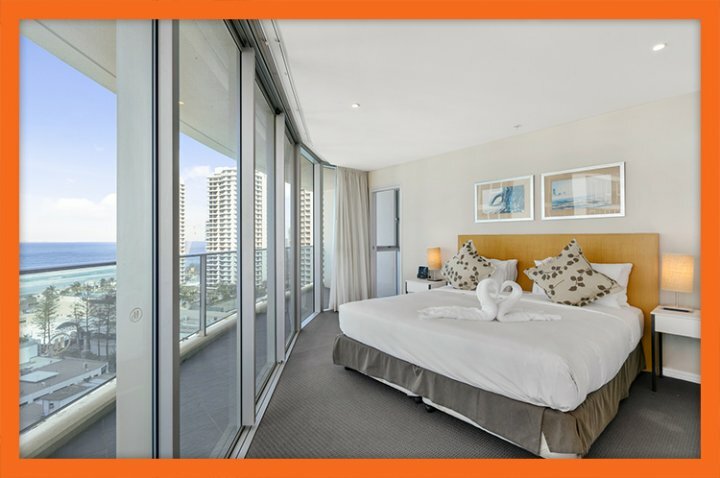 Boasting of world-class features and facilities along with being conveniently located in the heart of Surfers Paradise, Apartment 22306 should certainly be at the top your list when it comes to accommodation Surfers Paradise. 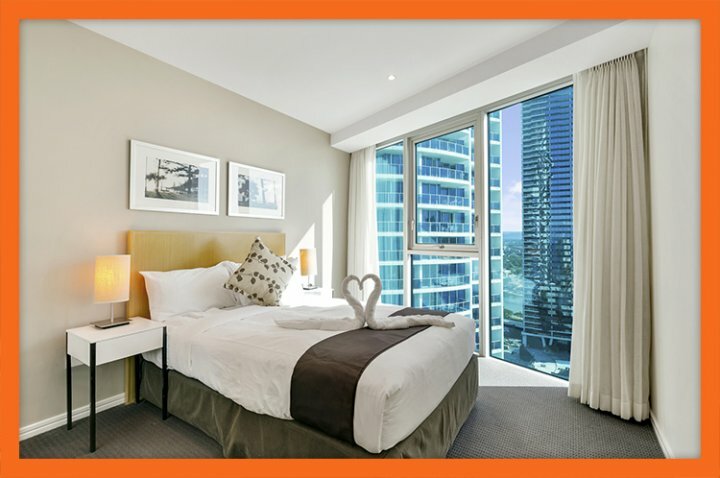 Apartment 22306 is a 2 bedroom/ 2 bathroom apartment, which is Located on the 23rd floor of one of Surfers Paradise's newest 5 star hotels. 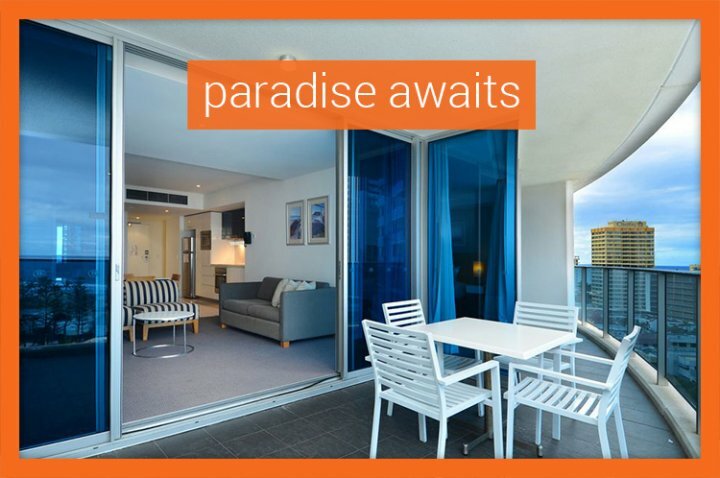 Close to Cavill Avenue, the beach and all Surfers Paradise attractions, Apartment 22306 is ideally located for you to enjoy your holiday on the Gold Coast. Apartment Features Some of the high points of this apartment include an open plan living area, which includes a furnished lounge, a gourmet kitchen and a dining area. The lounge is connected to a large balcony through floor to ceiling glass doors and offers grand views of the beaches and the ocean. 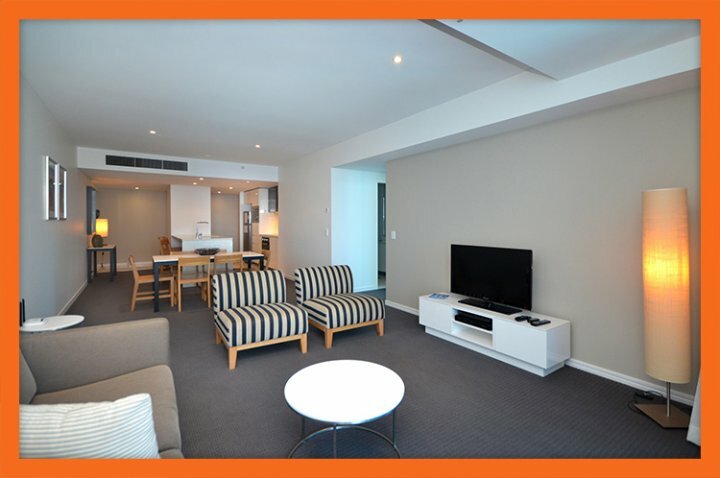 The lounge contains comfortable sofas and includes various entertainment units, a flat panel TV and Foxtel Premium. Free Wi-Fi is also offered in this apartment, so you can always stay connected to the world even on your holiday. The gourmet kitchen allows you to cook your own meals which can be had in the dining area, or outdoors on the balcony as an alfresco dining experience. Complete laundry facilities are also provided in this apartment. You'll also be handed an undercover parking space for your vehicle should you choose to stay in this apartment. Bedding Configuration The bedrooms of Apartment 22306 feature splendid interiors and they will definitely make your holiday experience richer. 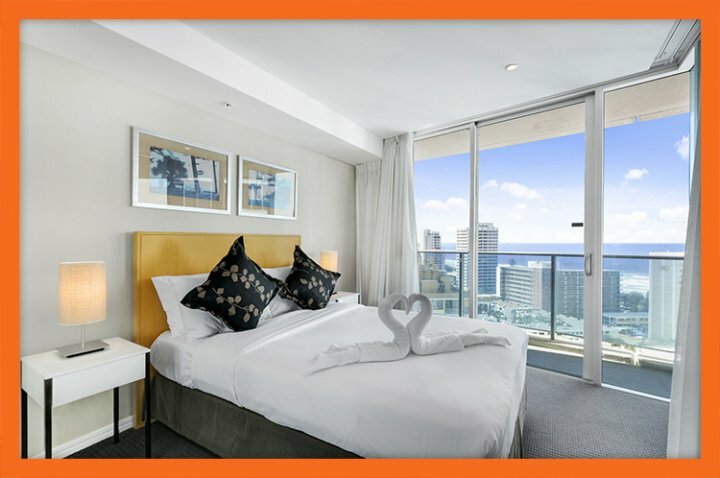 The master bedroom suite features an elegant king bed, is equipped with a TV and Foxtel Premium, has its own private ensuite bathroom and also opens out to the grand balcony. The second bedroom contains a double bed and also offers superb views of the hinterland and the beaches. Apartment 22306 includes up to 4 guests in the standard tariff, but you can sleep 2 extra guests by placing a request when you book the apartment. For a small surcharge fee, you will be provided extra rollaway beds. 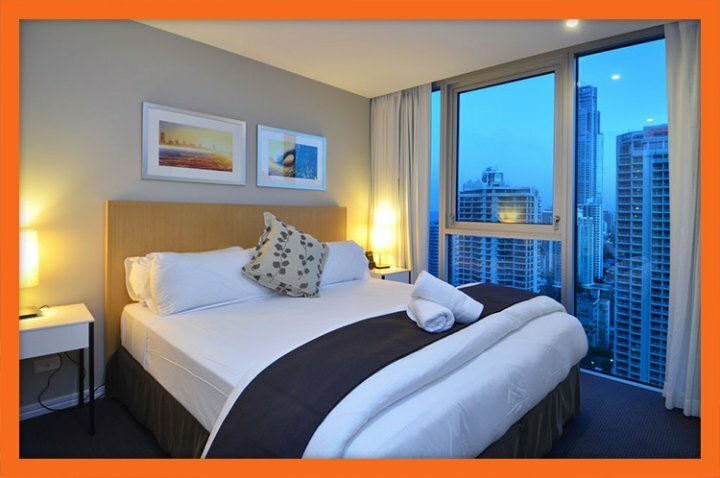 Resort Facilities Apart from the luxury accommodation offerings, by booking Apartment 22306, you get to enjoy all the 5 star facilities of this famous hotel. Such facilities include outdoor and indoor swimming pools, gardens and open entertainment areas, a gymnasium, a sauna and a spa, a private theatre and a choice of restaurants and bars. Truly world class facilities, these offered by Orchid Residences. 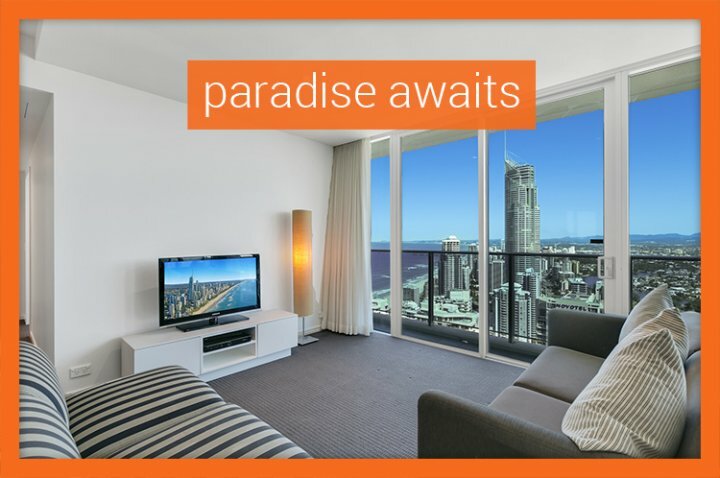 Come enjoy a holiday experience in Surfers Paradise like no other at Orchid Residences' Apartment 22306. 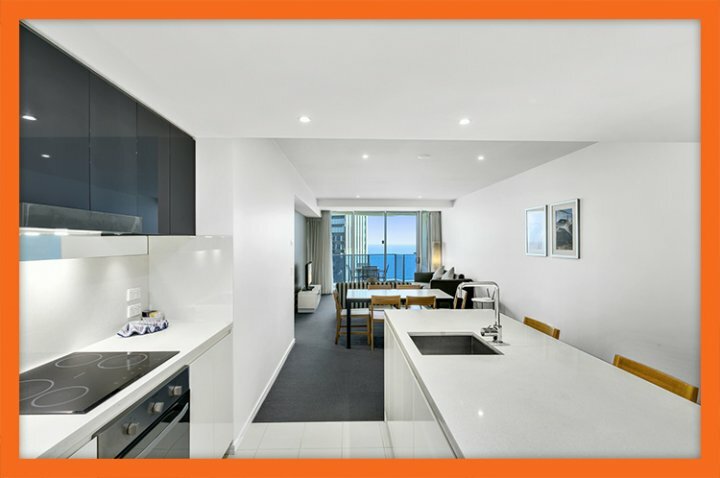 Apartment Overview Apartment 22402 at Orchid Residences (and co-located within one of the most famous 5 star hotels in Surfers Paradise) lies close to the beaches, the cosmopolitan Cavill Avenue and Surfers Paradise Esplanade. 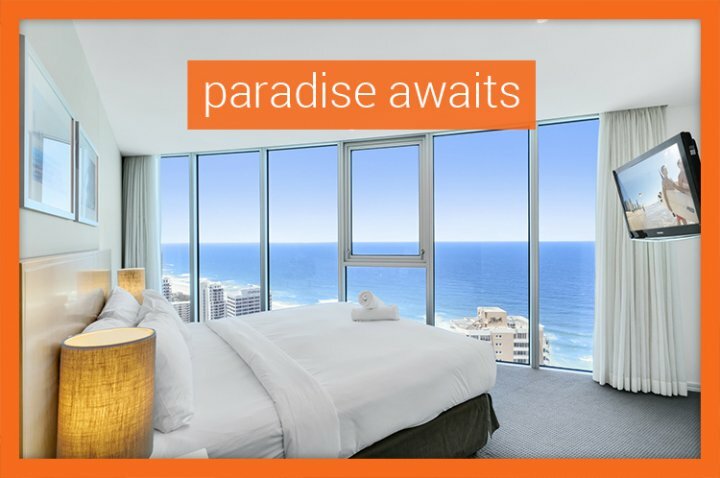 Located on the 24th level of the hotel's Orchid Tower, expect great views of Surfers Paradise, the beaches and the ocean. This 2 bedroom apartment with 2 bathrooms boasts first-class features and facilities and promises to make your holiday a more enjoyable experience. 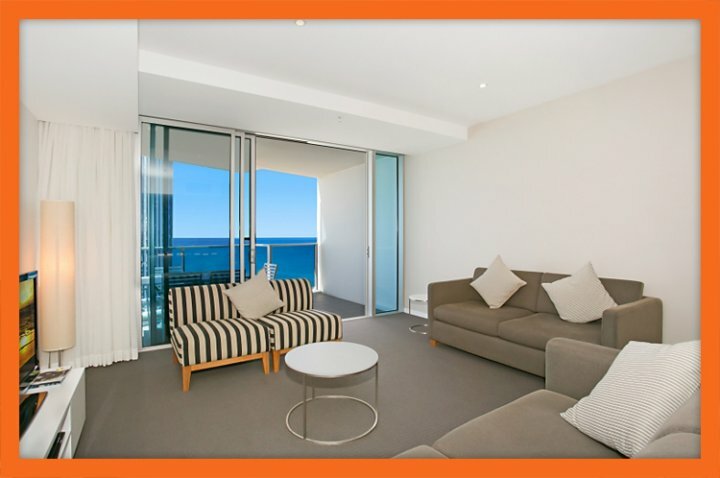 Apartment Features Apartment 22402 is a self-contained apartment with superior features. 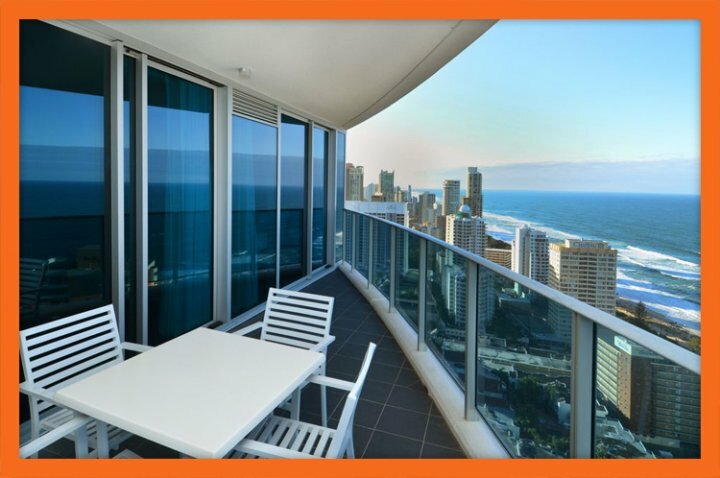 Themed to reflect luxury and elegance, this apartment offers first-class Surfers Paradise accommodation in terms of both comfort and convenience. 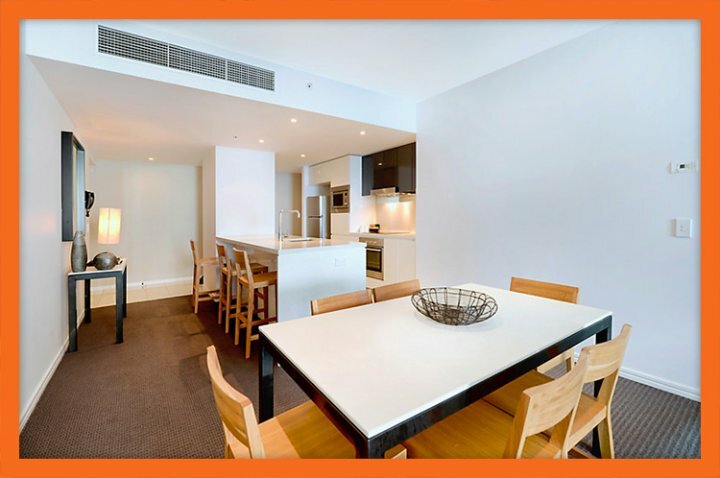 A fully furnished apartment, Apartment 22402 is spacious and features an open plan design. The living area of this apartment includes a gourmet kitchen, a separate dining area and a lounge which opens out to a sprawling balcony. 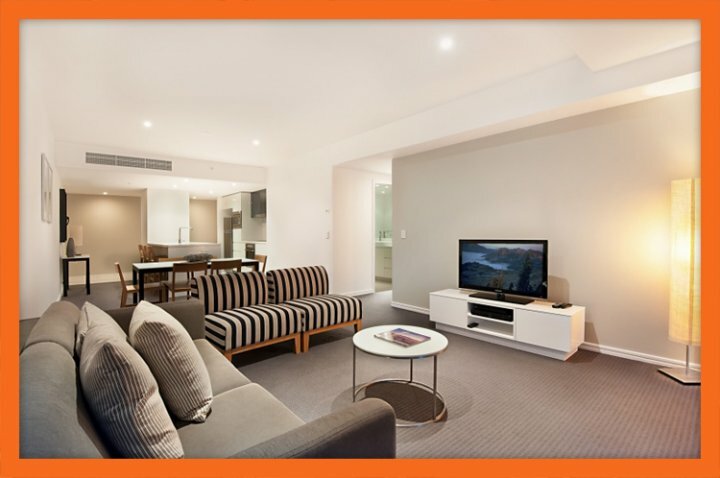 The lounge includes a flat panel TV with Foxtel Premium for your entertainment. Another highlight of the apartment is unlimited Wi-Fi facility, which is offered completely free of charge. 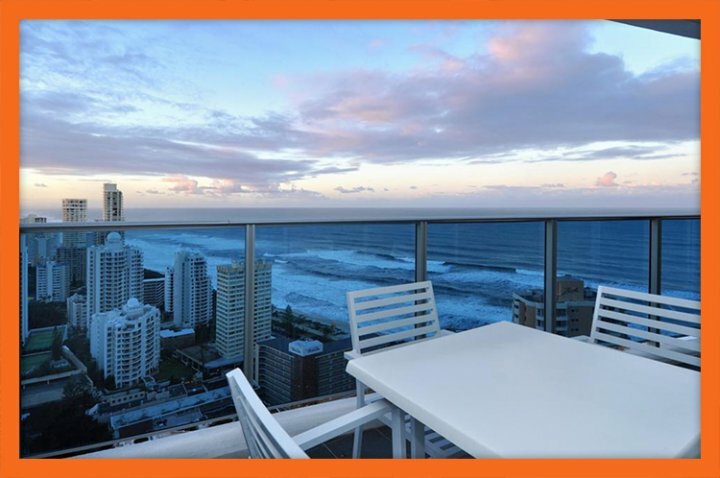 While the balcony of this apartment offers stunning views of Surfers Paradise, it also includes a dining setting for you to enjoy an alfresco dining experience. Should you stay at Apartment 22402, you will also be offered a free undercover parking spot for your vehicle, which is completely secure. 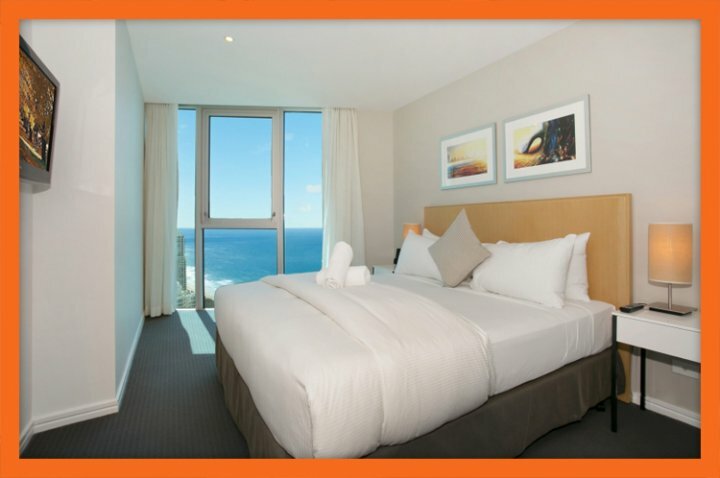 Bedding Configuration Both bedrooms of Apartment 22402 feature luxurious interiors and offer endless views of the ocean. The master bedroom suite is equipped with a king bed and also includes a private ensuite bathroom. This bedroom has direct access to the main balcony, allowing you to enjoy waking up to the sunrise. The second bedroom includes a double bed and has access to the main bathroom. Apartment 22402 sleep up to 4 people, but for a small surcharge, can accommodate up to 6 people. Simply place a request upon booking the apartment and additional rollaway beds will be provided. 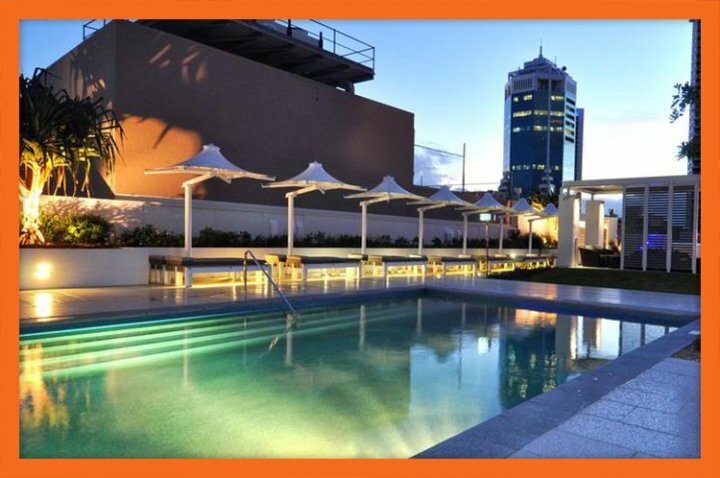 Resort Facilities Located within an internationally acclaimed 5 star hotel, by staying at Apartment 22402, you have complete access to the hotels first-class facilities. These facilities include multiple swimming pools for children and adults, a fitness centre for health enthusiasts, BBQ and open entertainment areas, a spa and a sauna, restaurants and bars and even a private theatre. You certainly cannot ask for more from your holiday resort. 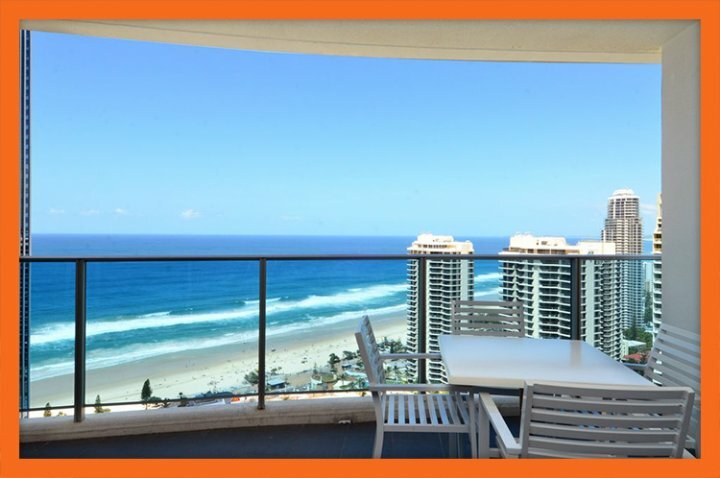 Choose Apartment 22402 at Orchid Residences as your Surfers Paradise accommodation and you will most definitely have a blast! 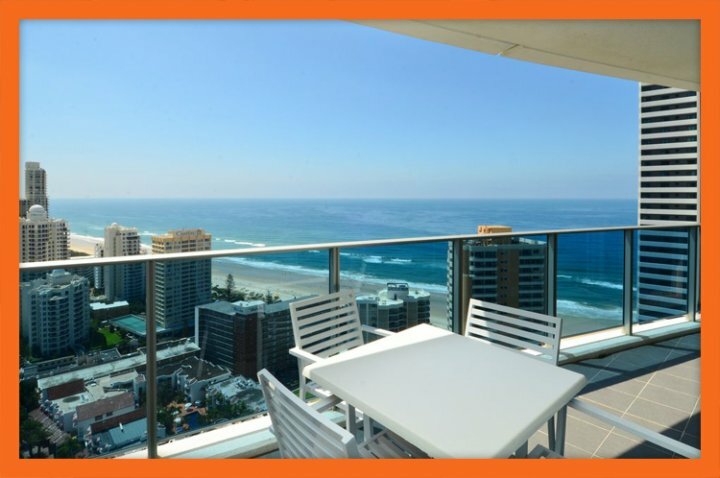 Apartment Overview Apartment 22405 at the Orchid Residences is one holiday apartment which you should definitely consider for your Surfers Paradise accommodation. 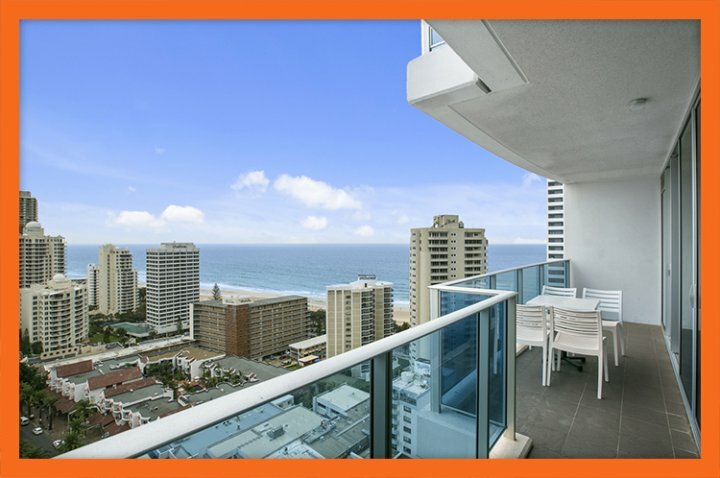 Close to the beaches, Cavill Avenue and Esplanade, this apartment is also co-located within a renowned Surfers Paradise 5 star hotel. The apartment is stylish and modern and is available at a price you can afford. 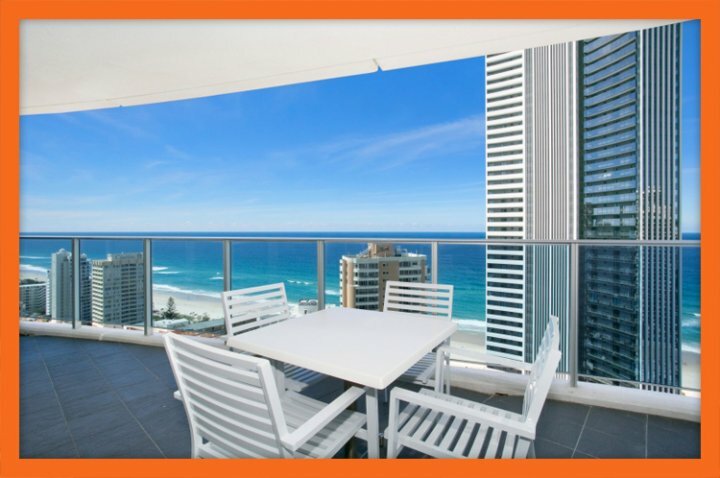 You needn't look elsewhere for Surfers Paradise accommodation. Comfortable, charming and luxurious, Apartment 22405 is a 2 bedroom, 2 bathroom apartment, which sits on the 24th level of Orchid Residences. 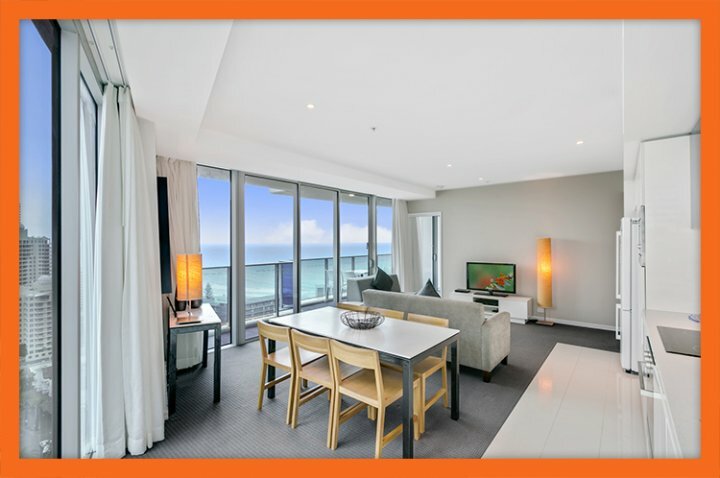 An ideal apartment for a couple or a small family on a Gold Coast holiday, this apartment offers the best in both functionality and style. Apartment Features Apartment 22405 offers you nothing less than 5 star luxury. This self-contained apartment boasts of elegant interiors and is fully furnished with modern amenities to make your holiday all the more enjoyable. Reflecting an open plan European design, Apartment 22405 features an immense living area, which includes a lounge, a dining space and a gourmet kitchen. The lounge is connected to a large balcony through floor to glass ceiling doors. 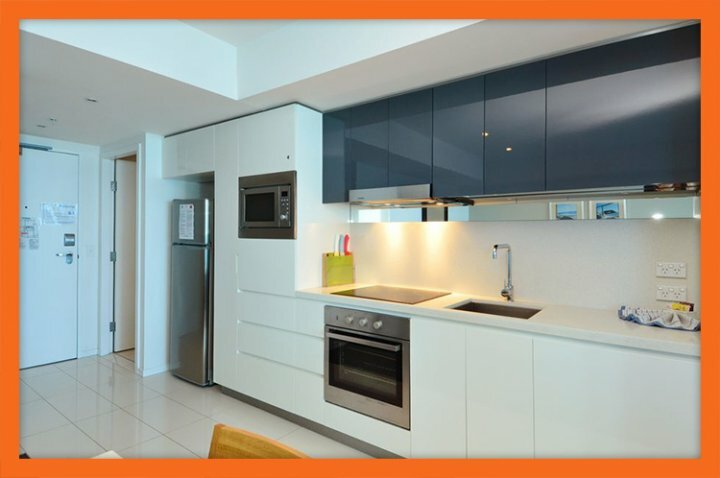 Enjoy cooking homemade meals whilst on holiday in the apartment's gourmet kitchen. Your dining experience will also be first-class, thanks to the immaculate dining area, or the alfresco dining experience as offered by the outdoor balcony. 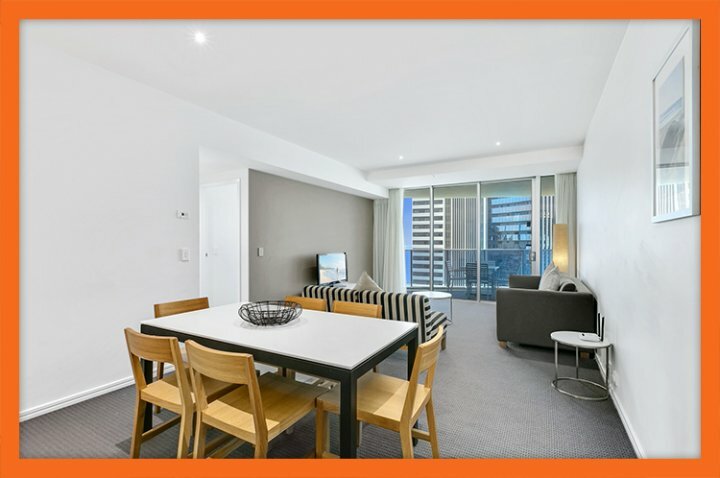 Some other highlights of this apartment include various entertainment options with Premium Foxtel, unlimited Wi-Fi facilities, full laundry facilities and a secure car parking space for your vehicle. 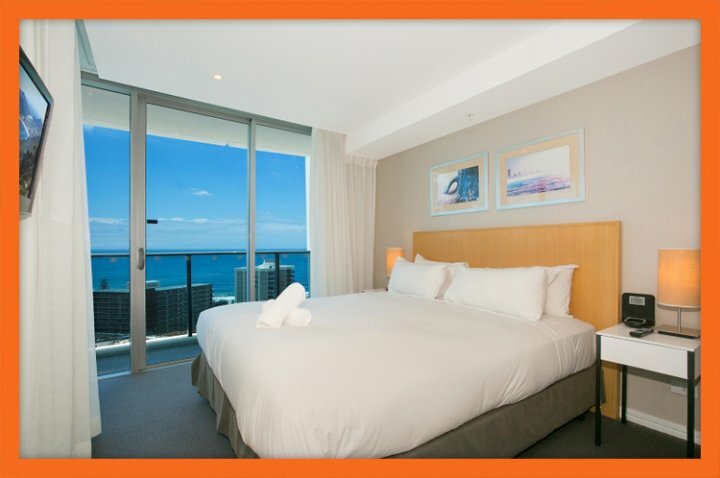 What more could you possibly want from your Surfers Paradise accommodation Bedding Configuration The bedrooms in Apartment 22405 are beautifully designed to offer you the best of comfort. The elegant master bedroom suite includes a king size bed, an ensuite bathroom and opens out to the main balcony. 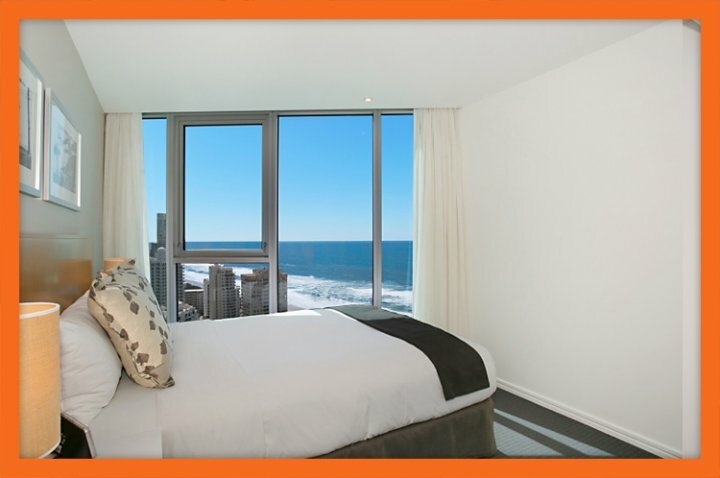 The second bedroom also offers great views of the ocean and is equipped with a double bed. While the tariffs for Apartment 22405 include up to 4 guests, if you make a request when booking the apartment, we will provide extra rollaway beds to accommodate 2 additional guests. This facility is offers at a small surcharge fee. Resort Facilities The best part about Apartment 22405 is that it lies within a 5 star hotel, thus, the resort facilities that you have access to are first-class. Some of standout facilities of this resort include separate swimming pools for children and adults, a 24/7 gymnasium and fitness centre, open entertainment areas and large gardens, spas and saunas, a range of restaurants and an internationally acclaimed bar. 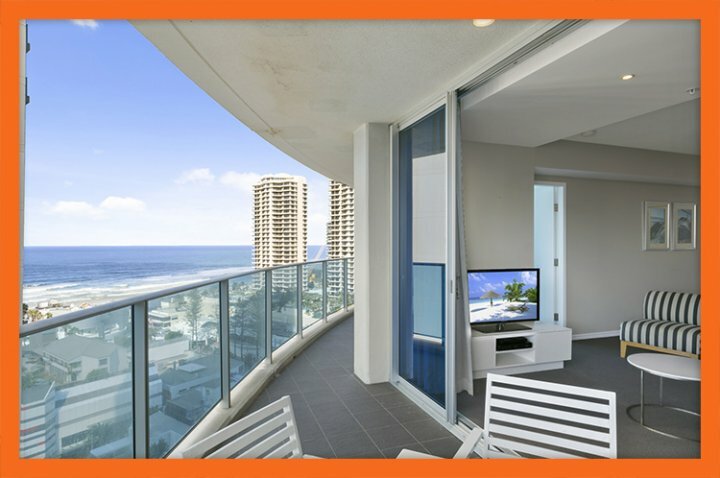 For a luxurious holiday experience like none other, choose Apartment 22405 at the Orchid Residences for your Surfers Paradise accommodation. 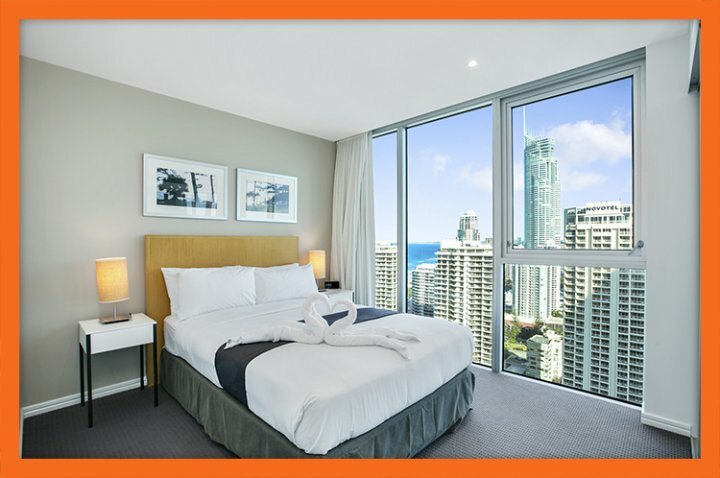 Apartment Overview Indulge in absolute luxury, staying in one of the most elegant apartments in Surfers Paradise Orchid Residences, Apartment 22502, a 2 bedroom 2 bathroom hotel style holiday apartment that offers outstanding ocean and city views. 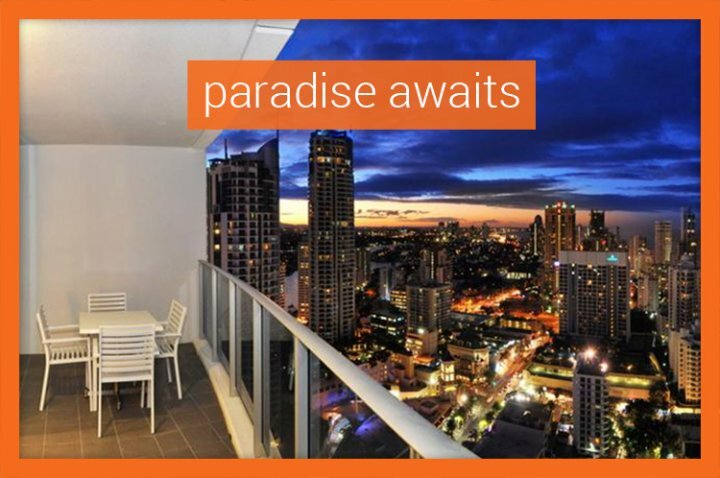 For the ultimate Gold Coast getaway, enjoy five star accommodation at Orchid Residences, Apartment 22502. Located high on the 25th floor of this famous resort hotel, relax and rejuvenate in style. Feel the wind blow through your hair and marvel at the sights offered by this luxurious holiday apartment. Apartment Features With modern fittings and fully air-conditioned throughout, Apartment 22502 offers a luxurious home base for your holiday. Complete with a separate dining and lounge area, you and your guests can relax in the comfort of your apartment after a long day of exploration, enjoyment and shopping. 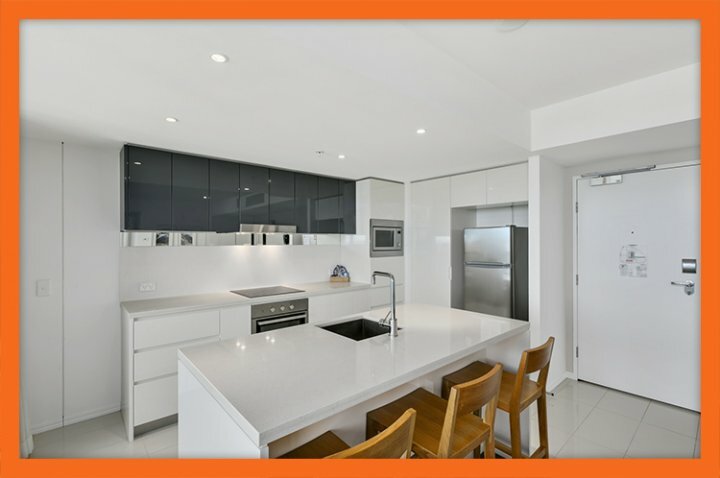 The fully equipped gourmet kitchen is ideal for preparing snacks through to cooking a full, three-course meal. The kitchen contains a stovetop, an oven, a microwave and a full size refrigerator to ensure you have all the comforts of home. This is very handy and budget-friendly if you're holidaying with kids. More so, the kitchen is open-plan and features an island bench with seating, so even if you do prepare a meal, you're still part of the group conversations. 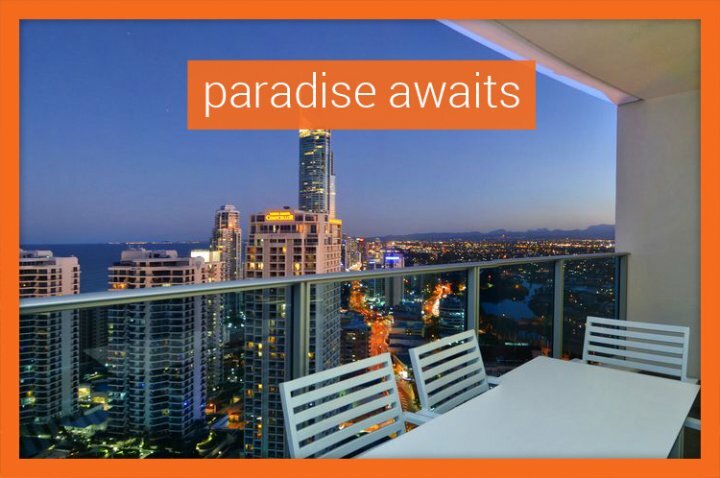 Enjoy your meal sitting together at the dining table or for an alfresco dining experience, head out to the finished balcony and gaze at the spectacular Gold Coast nightscape while you discuss activities for the day ahead. After dinner, unwind on the two lounges while you enjoy free premium Foxtel channels, a late night DVD or catch up on your Facebook or Instagram feeds thanks to the free unlimited Wi-Fi connection. 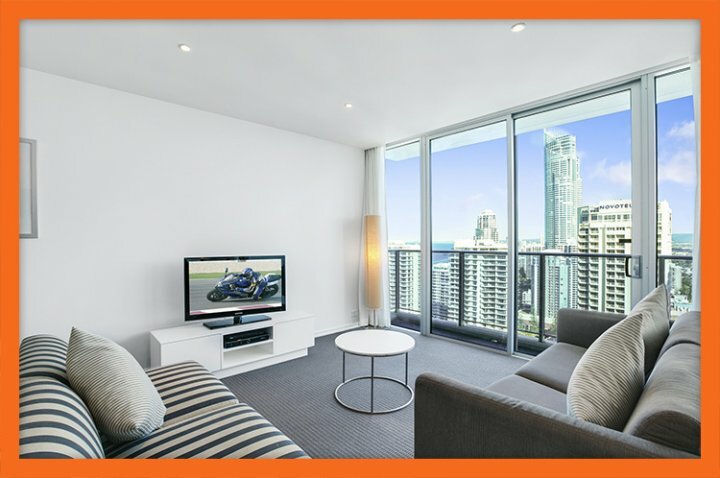 Speaking of freebies, you'll also receive a free car parking space when you choose to book Apartment 22502 for your Gold Coast getaway. Other features of this fantastic holiday apartment include an entertainment system, washing machine, dryer, iron and ironing board, hair dryer, secure undercover parking, a personal safe, linen, smoke detectors and sprinkler system. 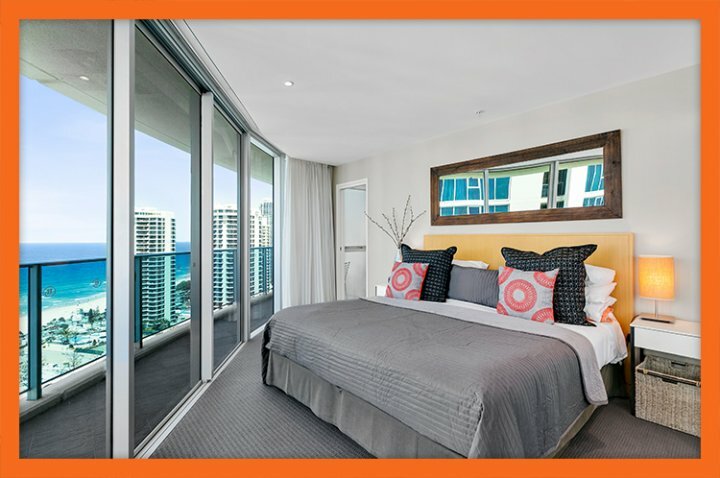 Bedding Configuration This spacious luxury holiday apartment, which can seep 4-6 guests, is perfect for families, two couples or friends looking to enjoy the best of the Gold Coast, including their choice of accommodation. After a long busy day, you can retreat to the privacy offered by the two separate bedrooms. The master bedroom features a king bed, walk-in-robe, flat-panel TV, fantastic northerly ocean views and its own ensuite, while the second bedroom contains a double bed, built-in-robe and equally impressive views. What more could you ask for For the ultimate Gold Coast getaway, indulge in absolute luxury staying at Orchid Residences, Apartment 22502. 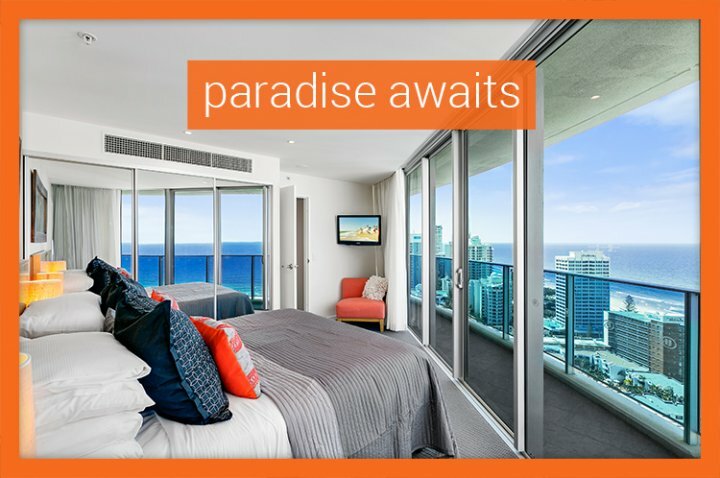 Wake Up In Paradise, Luxury Surfers Paradise Apt Apartment Overview If you're seeking a truly memorable Gold Coast holiday, you simply mustn't ignore Apartment 22503 at Orchid Residences in the heart of Surfers Paradise. 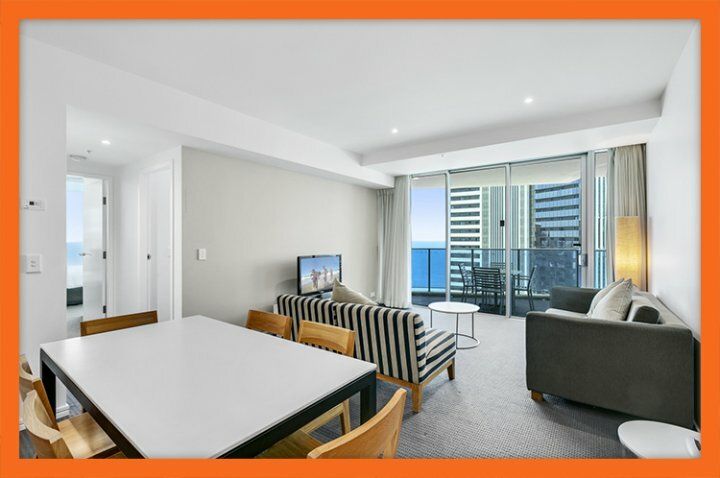 Conveniently located, this apartment lies within a strolling distance from Cavill Avenue, Surfers Paradise Esplanade and the beach is literally a stone's throw away. 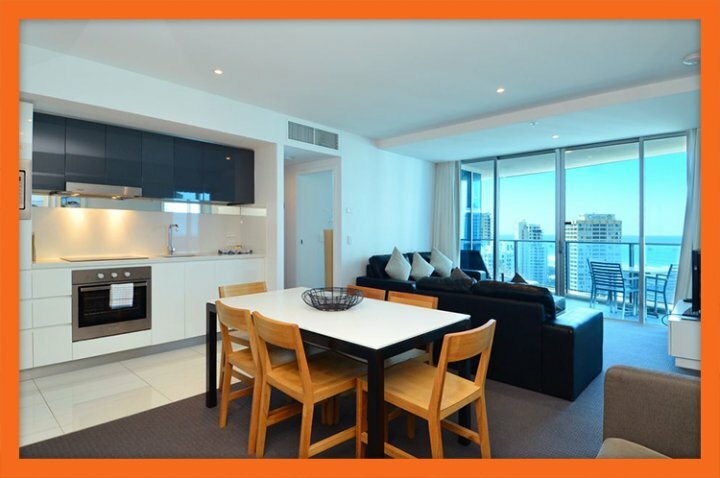 Moreover, this stylish apartment offers wonderful facilities thanks to it being co-located within one of Surfers Paradise's most sought after 5 star hotels. 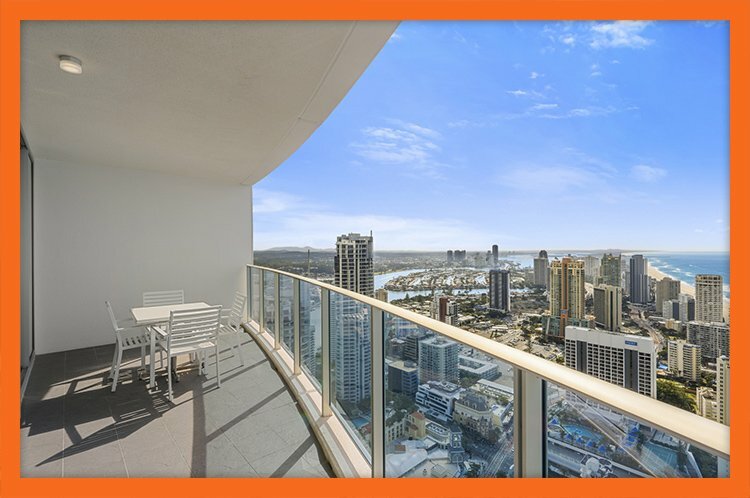 Apartment 22503 sits atop the 25th level of the hotel and presents stunning views of the cosmopolitan hub of Surfers Paradise and the beaches. 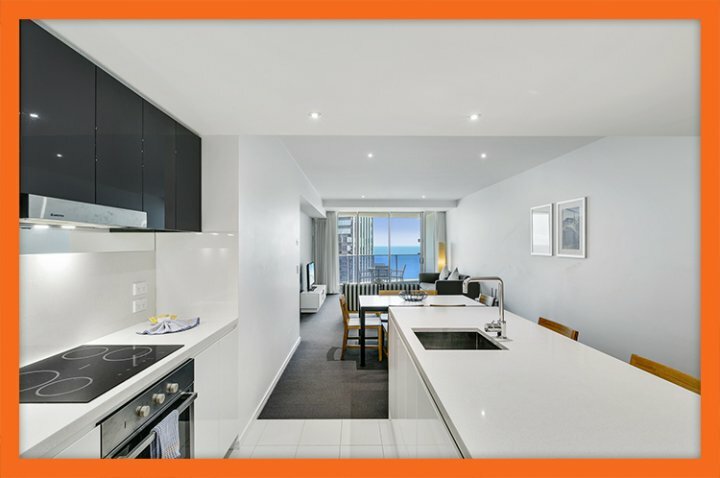 This 2 bedroom, 2 bathroom apartment features impeccable interiors and promises to make your Gold Coast holiday much more memorable. 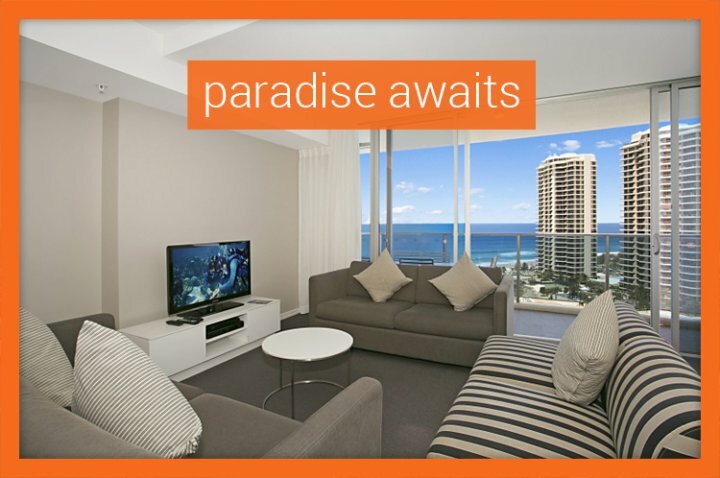 To enjoy the finest Surfers Paradise accommodation at affordable prices, choose Orchid Residences' Apartment 22503. 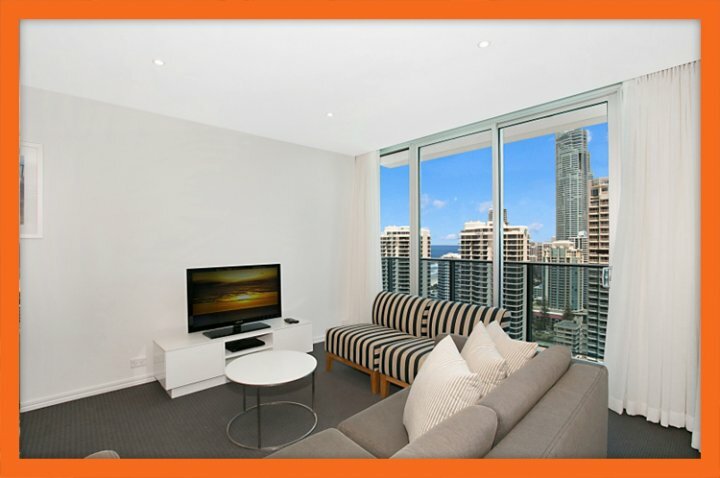 Apartment Features The lounge is equipped with modern entertainment systems, including Foxtel Premium at no additional cost. 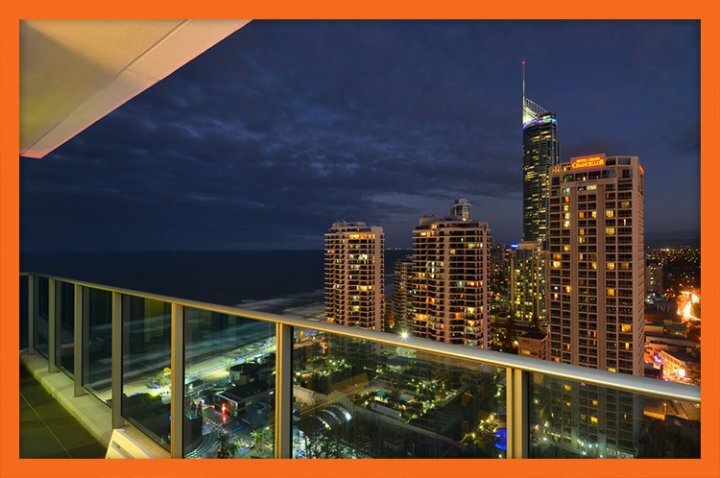 The lounge connects to a large balcony offering panoramic views of the skyline of Surfers Paradise. The gourmet kitchen makes it possible for you to cook any meal with ease. Your dining experience will be great, thanks to an open plan dining area adjacent to the kitchen. You can also choose to have your meals on the balcony to enjoy a wonderful alfresco dining experience, while admiring the splendid views on offer. Other highlights of Apartment 22503 include free Wi-Fi facilities, complete laundry facilities, full air-conditioning and a complimentary car parking space for your vehicle. 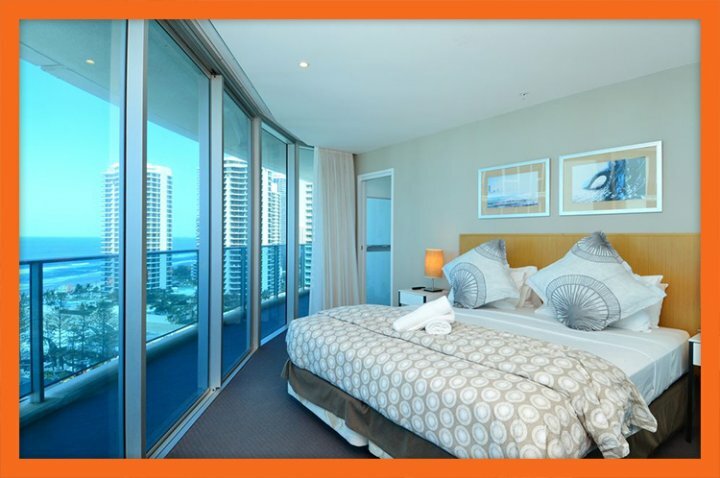 Bedding Configuration Both bedrooms of Apartment 22503 feature luxurious modern interiors, offer enticing views of the Surfers Paradise beaches and are extremely inviting. The main bedroom is a suite of its own and includes a king bed, a private ensuite bathroom and is also equipped with a TV set. The other bedroom contains a double bed and has access to the main bathroom. Apartment 22503 sleeps 4 people in the standard tariff. However, for a small surcharge fee, you can accommodate 2 extra guests. Resort Facilities By staying at Orchid Residences, you are also staying in a 5 star hotel therefore, you get to enjoy all of the world-class facilities on offer. If you're a family, you can let your kids play about in the splash pool, while the adults can enjoy the plunge pool and hit the bar. Fitness enthusiasts will appreciate the 24/7 gym, while you can also relax in the spa or the sauna after a day out in Surfers Paradise. A private theatre and restaurants are some other attractions of this resort. 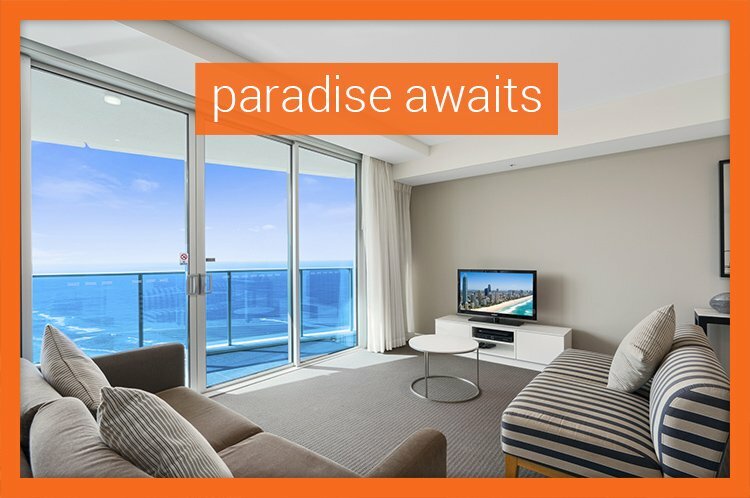 Choose Apartment 22503 for a Gold Coast holiday you won't soon forget. Apartment Overview The rumours are true! 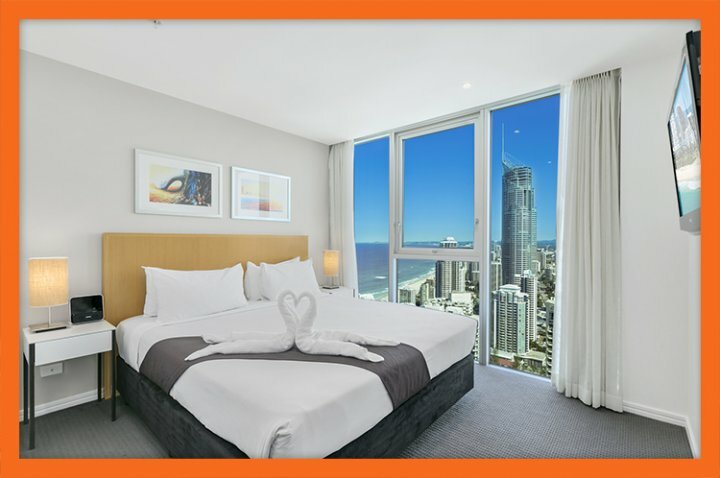 If you're looking for the luxurious Surfers Paradise hotel accommodation, you can do no better than to book your stay in the ultra-lavish, Apartment 22603 at Orchid Residences. 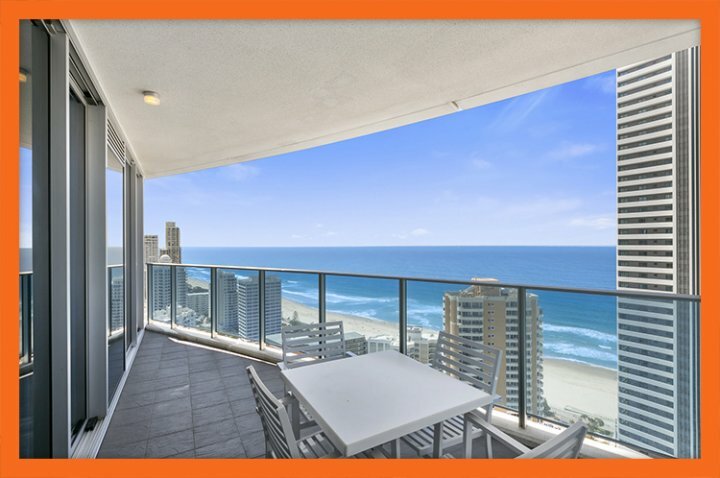 Apartment 22603 is not only co-located within on the most famous 5-star hotels in Surfers Paradise, but it is also located high on the 26th floor. Therefore, you can expect nothing short of breath-taking views over the golden sandy beaches and pristine blue Pacific Ocean. This 2 bedroom apartment features 2 bathrooms and a smorgasbord of impressive features which you're sure to love. 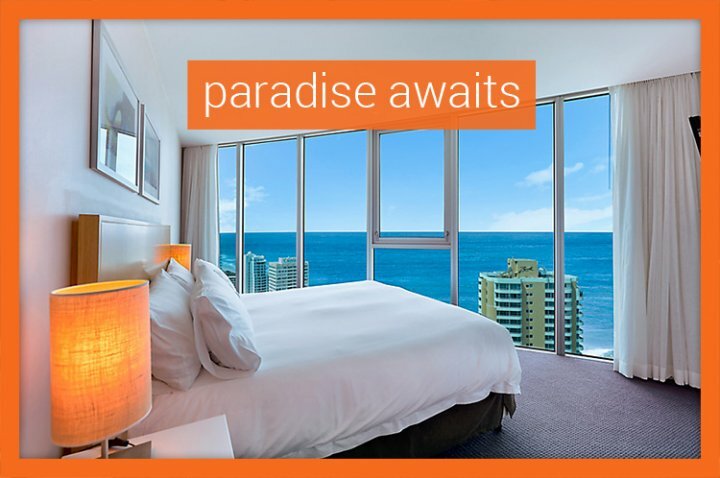 To experience Surfers Paradise hotel accommodation at its best, book Orchid Residences' Apartment 22603. Apartment Features Apartment 22603 exudes luxury from the second you step foot inside. Fitting with modern furnishings and fittings, this apartment features open plan design which will certainly impress. 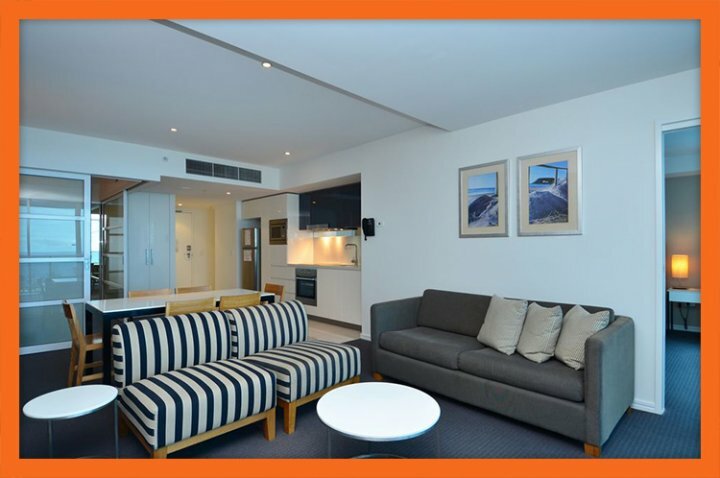 From luxury accommodation to 5-star features, Apartment 22603 has it all. 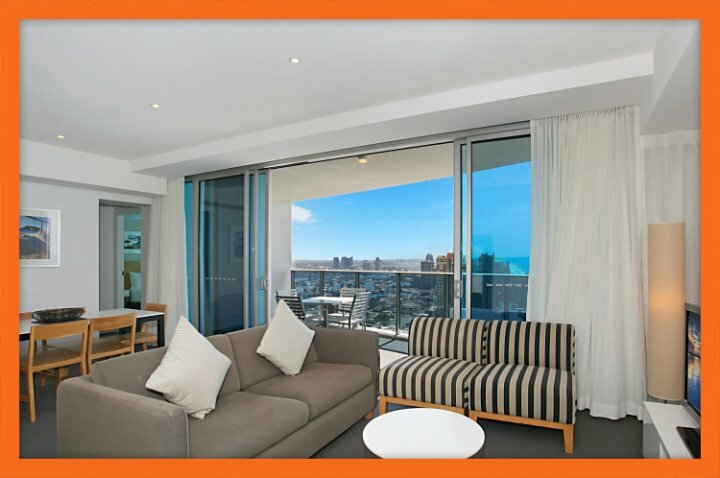 In addition to the luxury accommodation on offer, Apartment 22603 offers an array of impressive features. Such features include a gourmet kitchen that is fully-equipped with appliances and utensils, a separate dining and living area and even a laundry. If you're holidaying with your family, you will surly find the kitchen and laundry to come in handy. 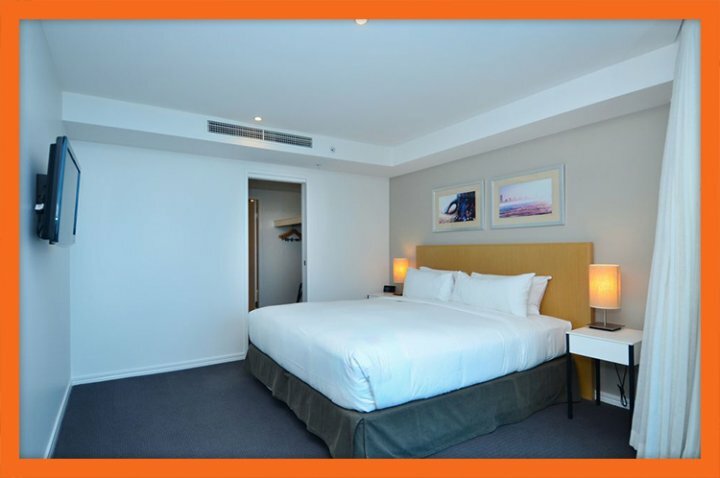 However perhaps best of all, is the free Premium Foxtel, free high-speed Wi-Fi internet and free car parking space that comes with each booking. Bedding Configuration The bedrooms of Apartment 22603 are luxurious to say the least. The master features a king bed, flat panel TV, walk-in-robe and an esuite bathroom. 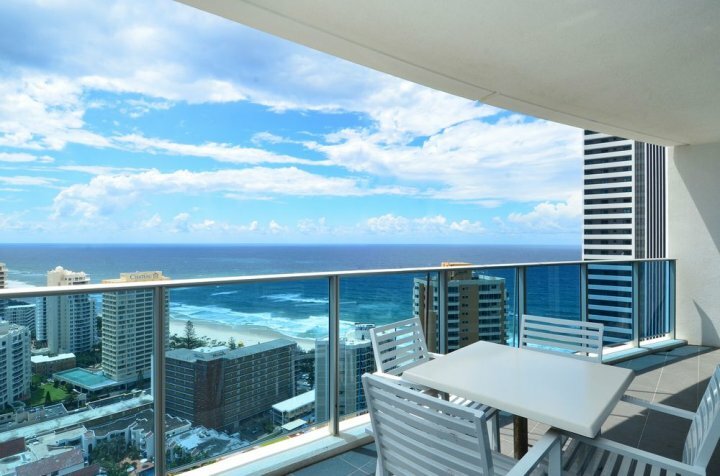 It also boasts some of the best views in Surfers Paradise from its floor to ceiling windows. The second bedroom offers direct access to the apartments large 15 square meter balcony that faces the ocean and contains a queen bed. Apartment 22503 sleeps 4 people in the standard tariff. 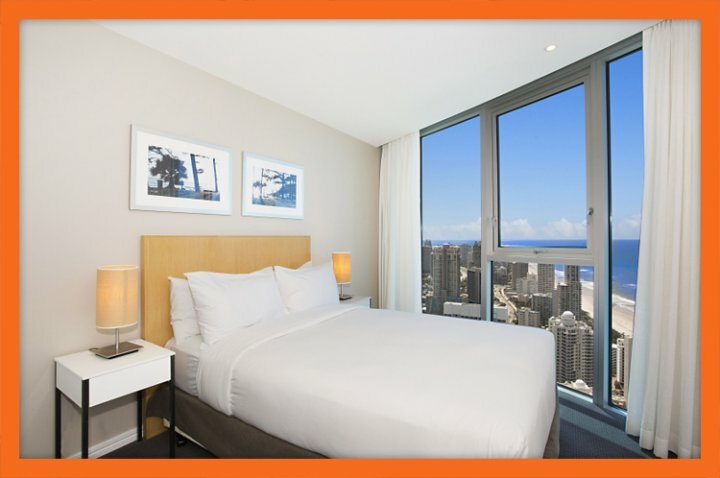 However, you can accommodate up to 6 for a small surcharge fee (2 extra guests can be accommodated on roll-away beds). Resort Facilities As Apartment 22503 is co-located within a famous 5-star hotel, you will have full access to all the fantastic facilities of the hotel. 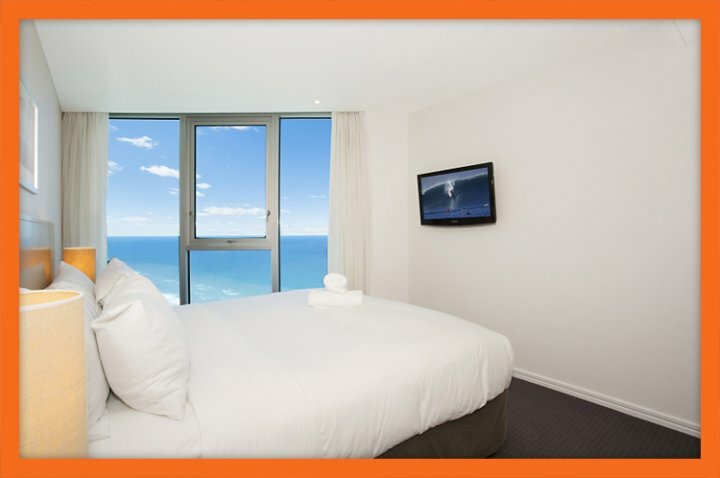 Such facilities include a spa and sauna, a heated indoor pool, a 40m outdoor pool, along with a children's splash pool and an adult plunge pool, a 24/7 gym, BBQ facilities and an award winning day spa For the most luxurious Surfers Paradise hotel accommodation, book your stay at Orchid Residences' Apartment 22603. 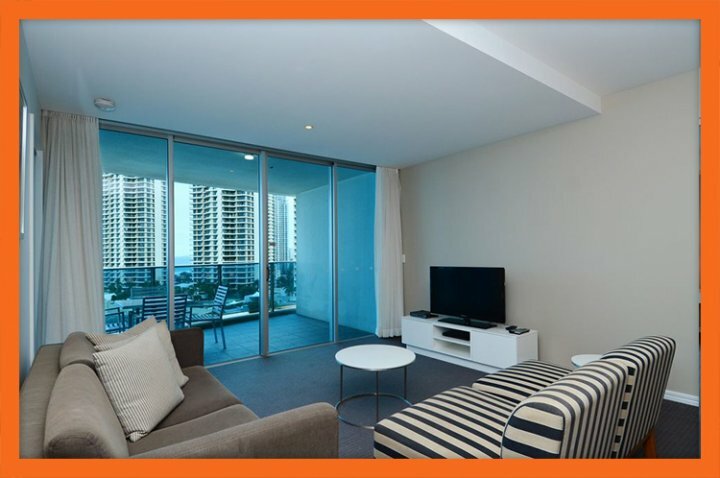 Apartment Overview Apartment 22803 - at Orchid Residences - is one holiday apartment which promises to enhance your Surfers Paradise holiday experience. 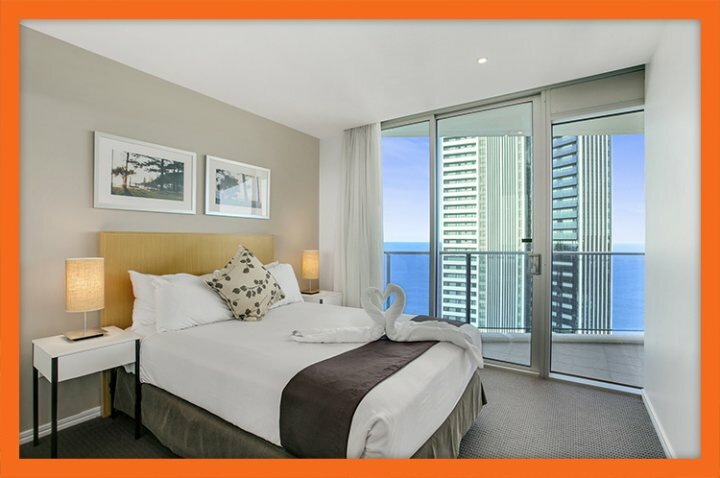 Strategically located close to Surfers Paradise Esplanade, Cavill Avenue and the beach, this luxury hotel apartment features immaculate interiors and is co-located with a 5 star hotel all this at an incredibly affordable price! 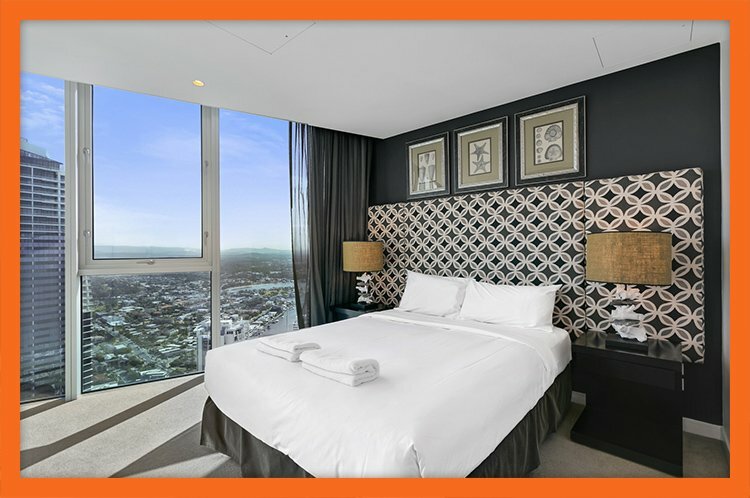 Situated high up on the 28th level of the hotel, Apartment 22803 redefines style and luxury. 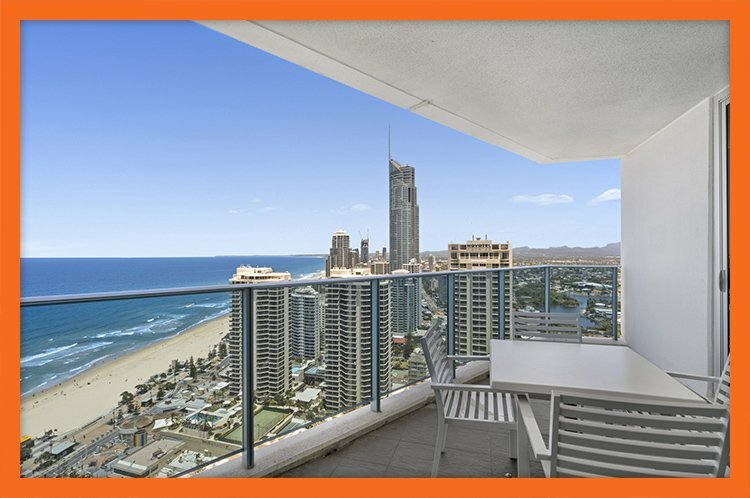 Offering grand views, this 2 bedroom apartment with 2 bathrooms is ideal for a couple or a small family looking to enjoy a Gold Coast holiday. 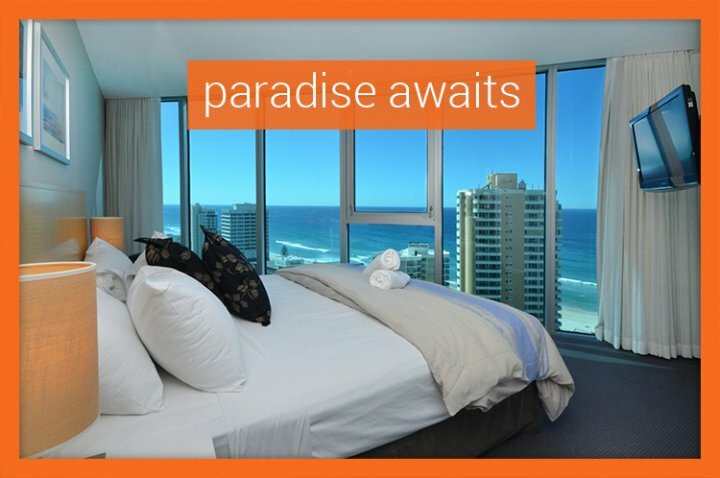 Delight in the very best that Surfers Paradise has to offer with 5 star accommodation at Apartment 22803. 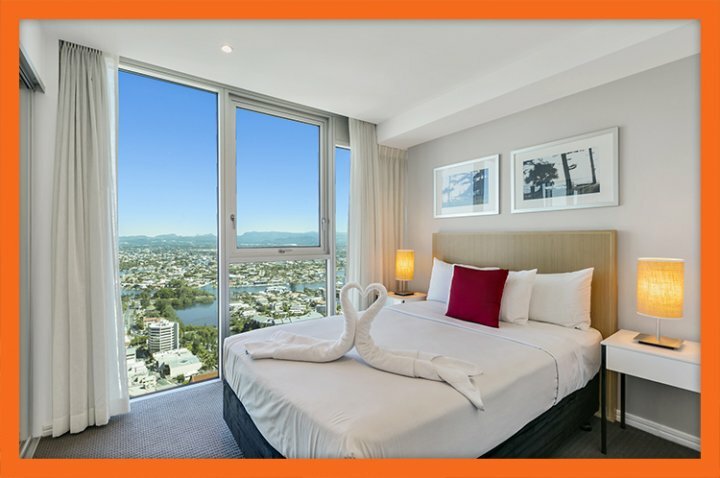 Apartment Features Apartment 22803 offers nothing but first-class accommodation and this is to be expected, given that it lies in an internationally acclaimed hotel. While this hotel apartment is elegantly styled and includes modern interiors, it also offers the best in convenience. The sprawling living area includes a spacious lounge, a fully equipped kitchen and a dining area. 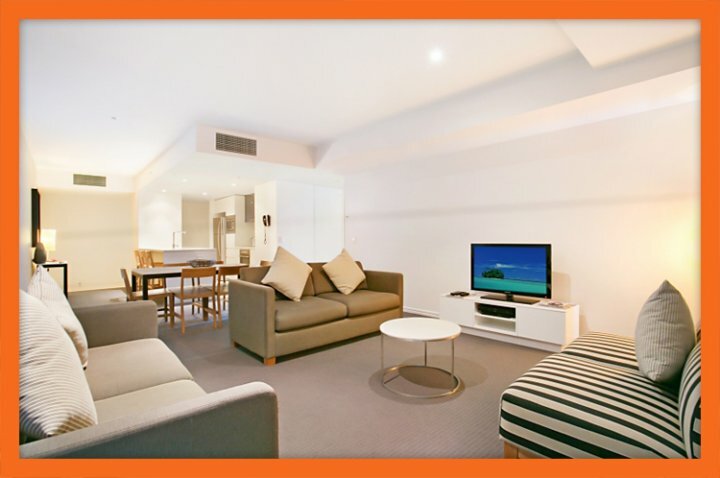 The lounge features sofas and has various entertainment systems, including Foxtel Premium for you to enjoy. A large balcony seamlessly connects to the living area, where you can enjoy endless views of the ocean. Cooking your own meals in the gourmet kitchen is both fun and can help you save on costs as well. You will also get a free car parking space with this apartment. Laundry facilities, linen and towels are also provided in Apartment 22803, so pack your thongs and togs and you're good to go! Bedding Configuration Apartment 22803 features elegant bedrooms with neat interiors, which are charming to say the least. The master bedroom suite includes a king bed, a personal safe, a TV set and has a private ensuite attached. The second bedroom contains a double bed and has access to the main bathroom. Both bedrooms have a northerly aspect and offer spectacular views of the Pacific Ocean. Tariffs for Apartment 22803 sleep up to 4 guests. 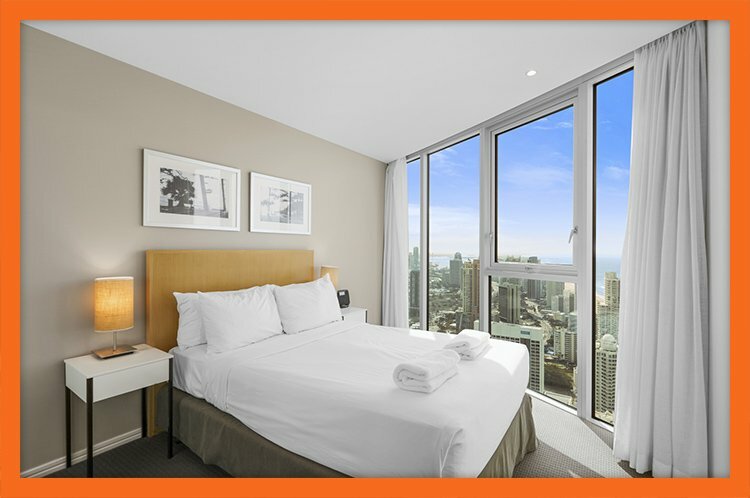 You can however accommodate 2 extra guests in the apartment by making a request for additional foldaway beds when you book the apartment, which will be provided at a surcharge fee. Resort Facilities Orchid Residences is co-located within a renowned hotel. 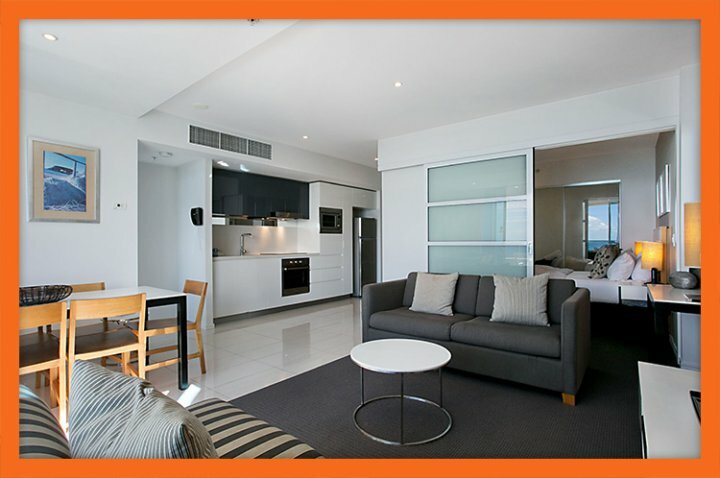 Should you choose to stay in Apartment 22803, you also get to enjoy the 5 star facilities of the hotel, some highlights of which include a spa and a sauna, indoor and outdoor swimming pools, a 24/7 fitness centre, BBQ and open entertainment areas, gardens, a private theatre and restaurants and bars. All facilities will definitely stack up to your expectations. 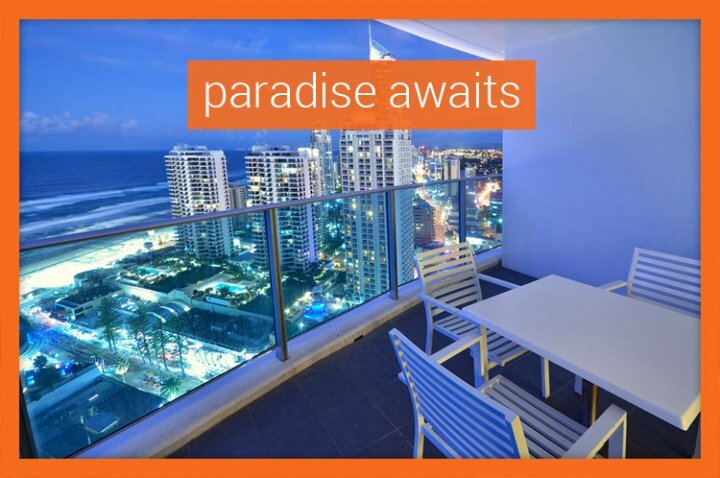 So why look elsewhere for holiday accommodation in Surfers Paradise Choose Apartment 22803 at Orchid Residences for your stay. 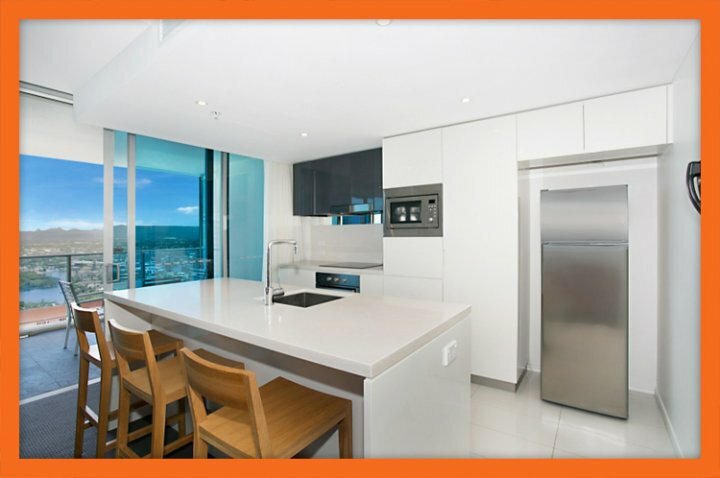 Apartment Overview For the ultimate Gold Coast holiday experience, consider Apartment 220902 at Orchid Residences in Surfers Paradise. 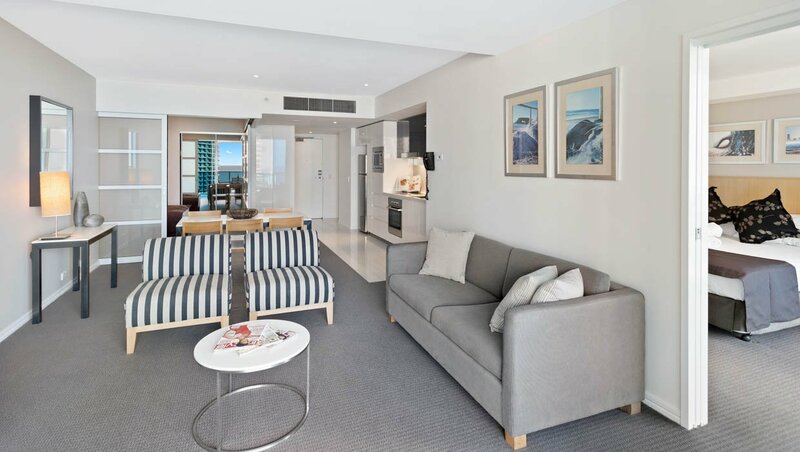 Co-located within a famously known 5 star hotel, this hotel apartment is just a stroll away from the beach, the Esplanade and Cavill Avenue. While it boasts of being centrally located, it is also brilliantly designed and packed with modern facilities and amenities, at a price you can afford! Nested on the 29th level of Orchid Residences, Apartment 22902 is a 2 bedroom apartment with 2 bathrooms, which is both stylish as well as functional. Perfectly suited for a small family or a couple, this hotel apartment is sure to please one and all. 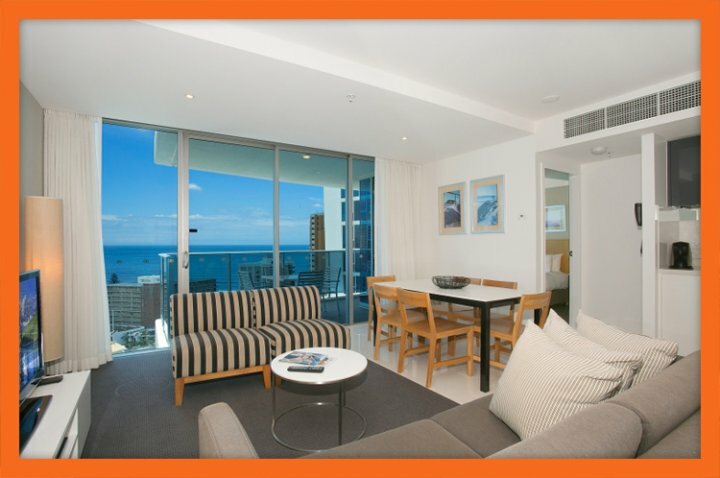 Enjoy luxury Surfers Paradise accommodation for your holiday at Apartment 22902. 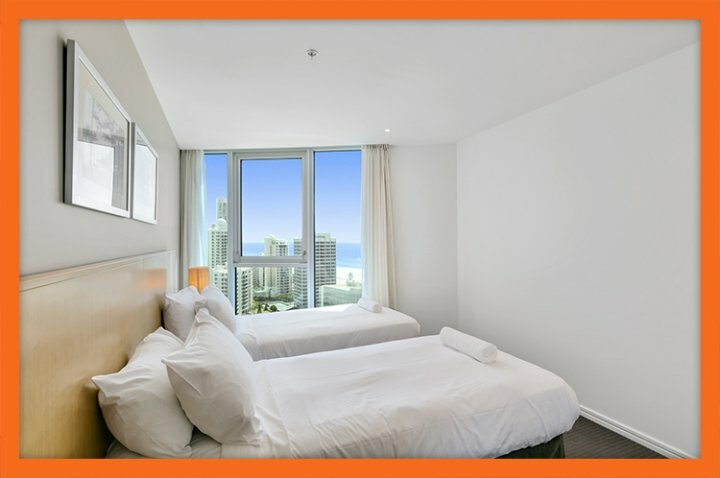 Apartment Features As expected from an apartment which is co-located with a 5 star hotel, Apartment 22902 offers superior Surfers Paradise accommodation, presenting everything that you may need from your holiday apartment. The perfect mix of comfort and convenience, Apartment 22902 is well designed and features a spacious, open plan living area. 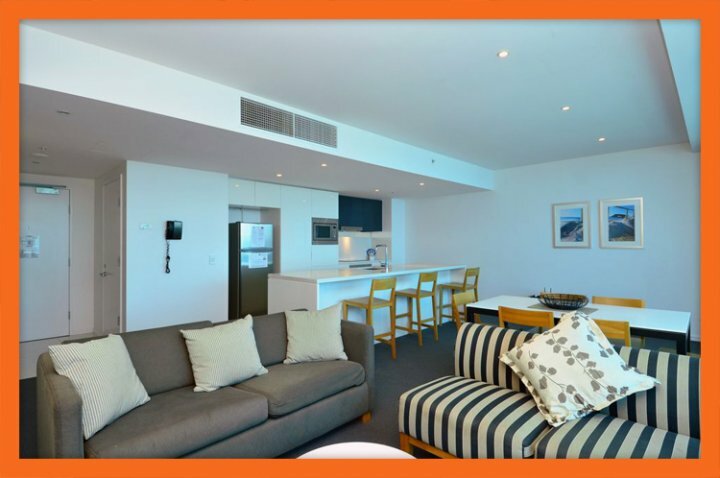 The lounge area is furnished for your entertainment, complete with sofas, a flat panel TV and Foxtel Premium and it also connects to a large private balcony. 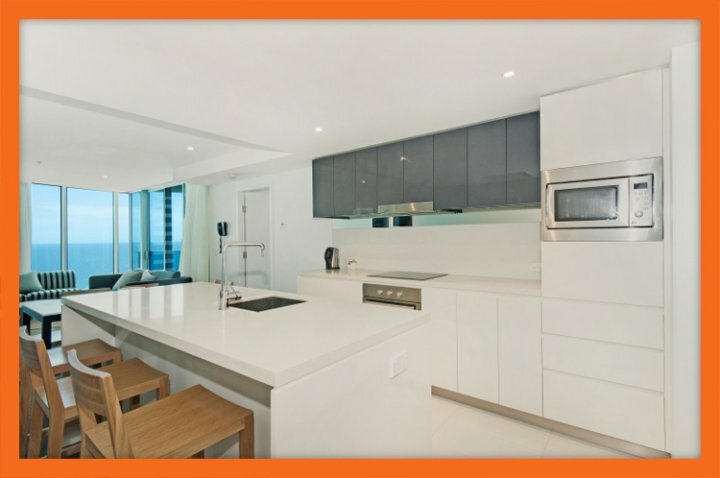 Another highlight of this apartment is the fully-equipped gourmet kitchen, where you can cook any meal, large or small. 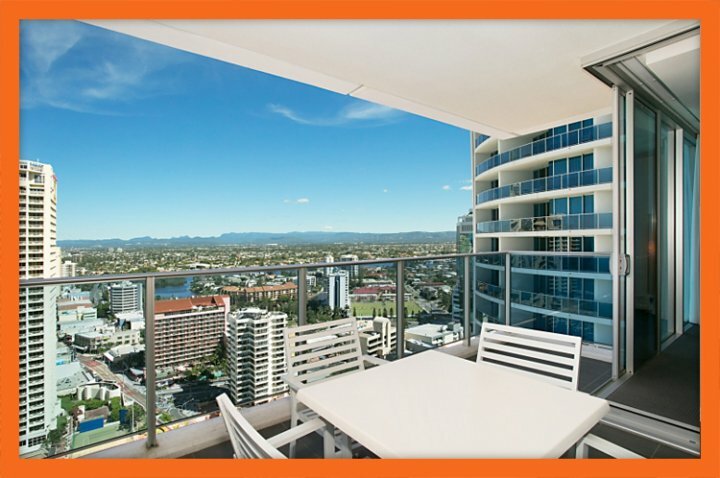 Meals can either be had in the dining area, or out on the balcony, which also includes outdoor dining setting. Free unlimited Wi-Fi, complete laundry facilities and a secure undercover parking space are some of the other attractions that Apartment 22902 has to offer. Bedding Configuration The graceful bedrooms of Apartment 22904 feature immaculate interiors and are extremely alluring. The master bedroom of this apartment features a king size bed, a TV set and also includes a private ensuite bathroom. The other bedroom features a double bed and has access to the main bathroom. Both these bedrooms face the north and offer grand views of the hinterland and the ocean. 4 people are included in the tariff. However, 2 extra guests can be accommodated at a small additional fee. 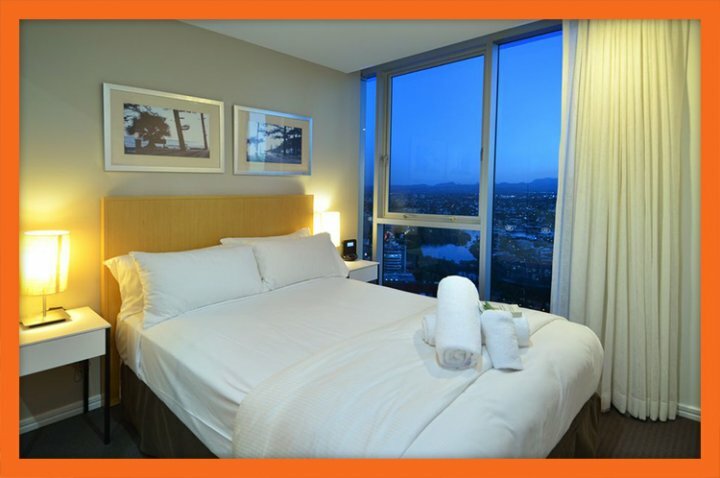 All you need to do is to place a request when booking the apartment and extra rollaway beds will be provided to you. Resort Facilities Orchid Residences offers access to all the 5 star facilities of the parent hotel, which include splash pools, lounge pools and lap pools, spas and saunas, a gymnasium, open entertainment areas, a bar and restaurants, a private theatre and much more! 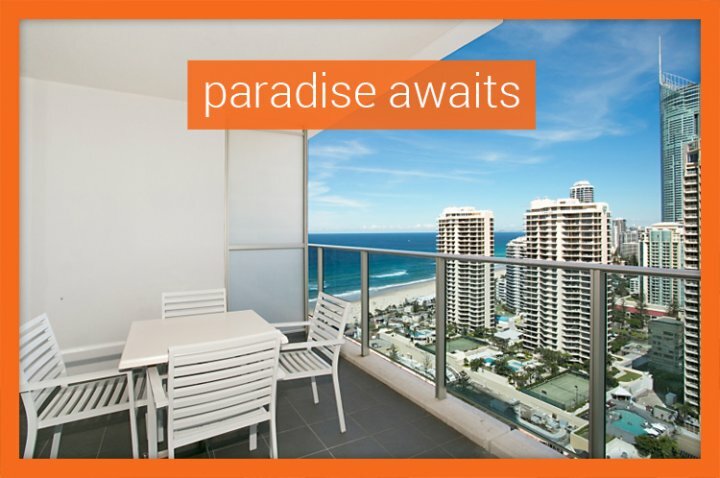 There's no need to look elsewhere for Surfers Paradise accommodation choose Apartment 22902 at Orchid Residences for your holiday. 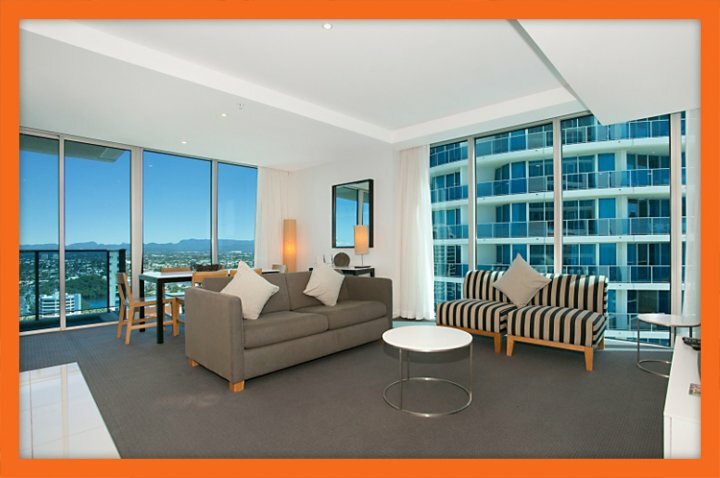 Apartment Overview Enjoy a luxury Gold Coast holiday from the 30th floor or Orchid Residences. 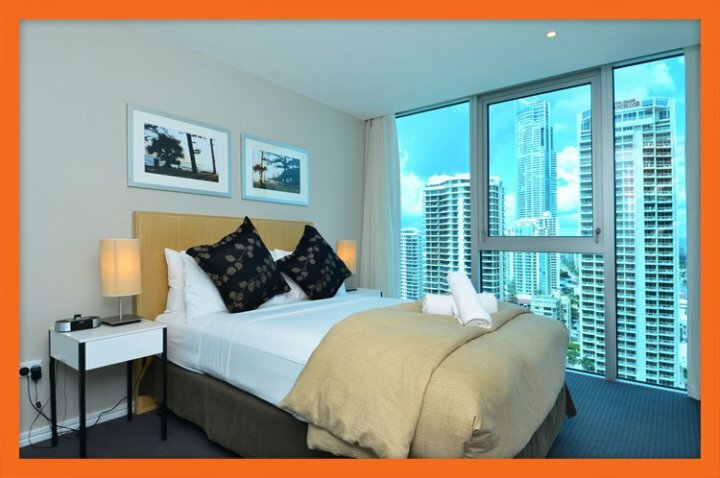 Located in the heart of Surfers Paradise and co-located within one of the Gold Coast's most luxurious hotels, Apartment 23003 is the epitome of luxury, comfort and style. 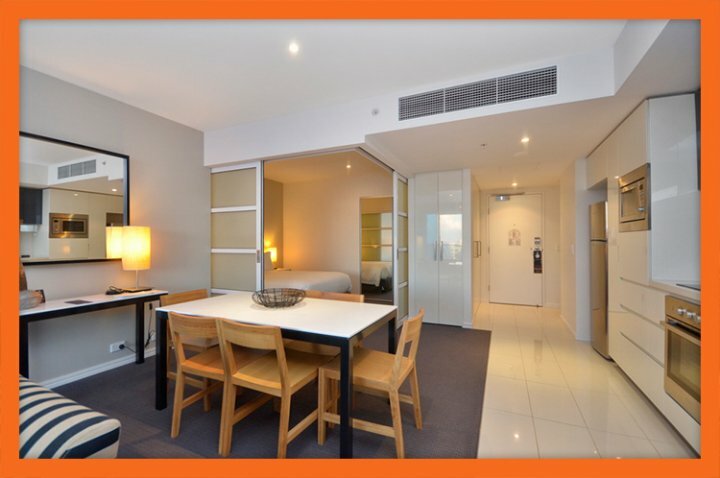 Apartment 23003 is a luxury 2 bedroom hotel apartment with 2 bathrooms. 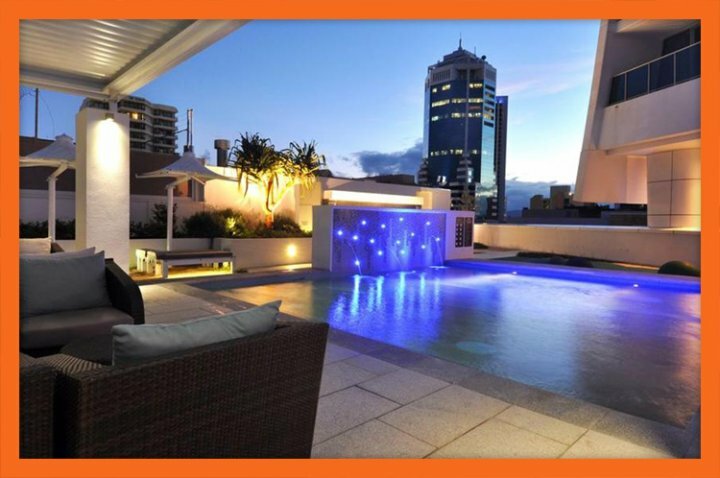 Sleeping 4-6 guests, it is the perfect holiday bub for families and friends to call home whist exploring all the Gold Coast has to offer - from one very central location. 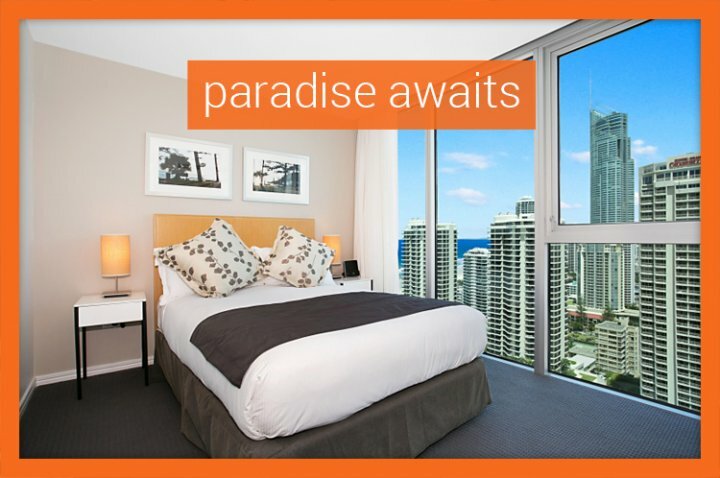 Enjoy luxury hotel accommodation just meters from Cavill Avenue, the Esplanade and Surfers Paradise Beach at Apartment 23003. 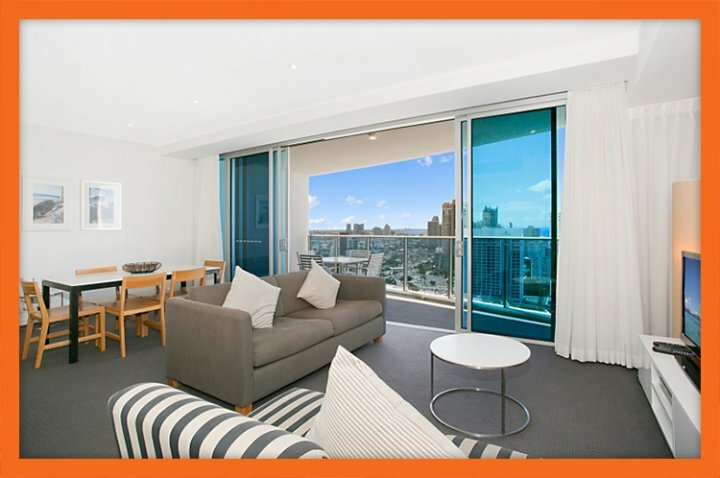 Apartment Features Apartment 23003 offers the convenience of a self-contained apartment, but with 5-star style. From a fully-equipped kitchen to a separate dining, lounge and laundry, Apartment 23003 has absolutely everything you need for a hassle-free private escape. The apartment is modern, fresh and full of luxury finishes. Guests can relax in style in the spacious lounge area that opens onto the balcony. Watch premium Foxtel on the flat panel TV or enjoy a DVD. 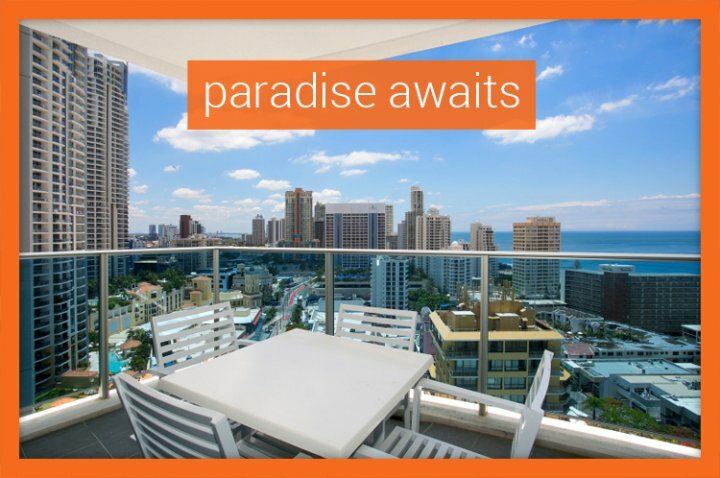 Take avail of the 30th floor positioning and step out to the balcony and enjoy fresh coastal breezes. Or, kill some time surfing the net on the free unlimited WiFi internet. Nothing has been overlooked in this luxurious apartment. Other highlights of the apartment include a free carpark in the hotels secure carpark and access to all amenities and facilities of the hotel. Bedding Configuration The bedrooms of Apartment 23003 feature modern interiors and offer the utmost comfort. The master bedroom contains a king bed, a flat panel TV and has a private ensuite bathroom. The second bedroom contains a double bed and offers guests access to balcony. 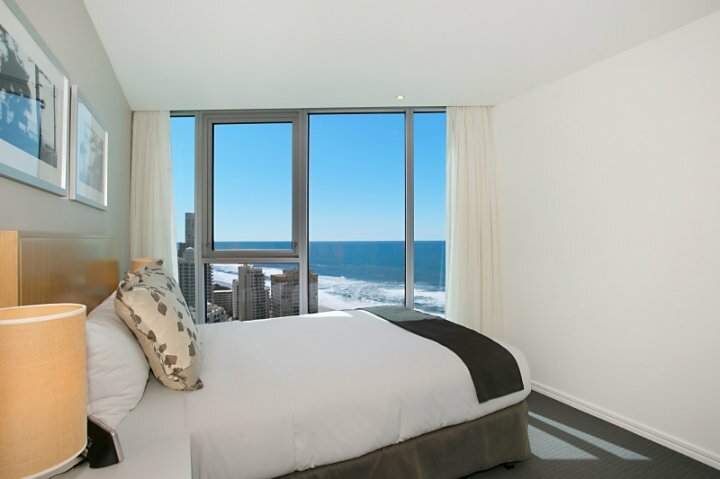 Both bedrooms offer northerly views over the Gold Coast and Pacific Ocean. 4 guests are included in the tariff. However, 2 additional guests can be accommodated for a small additional fee. 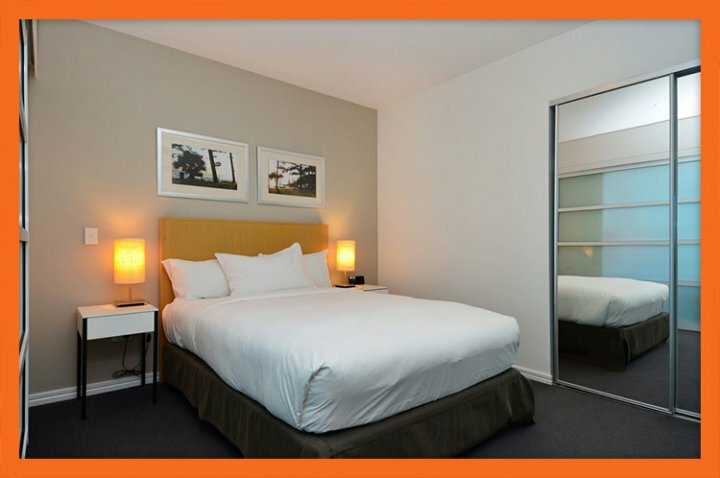 All you need to do is to place a request when booking the apartment and extra rollaway beds will be provided to you. Resort Facilities Orchid Residences grants guests' full access to all amenities and facilities of the parent hotel. Take a dip in one of the 4 pools, relax in the spa and sauna, keep fit in one of the two gymnasium, or simply enjoy the ground of the hotel, which offers pool terraces, barbecue areas and onsite bars and restaurants. 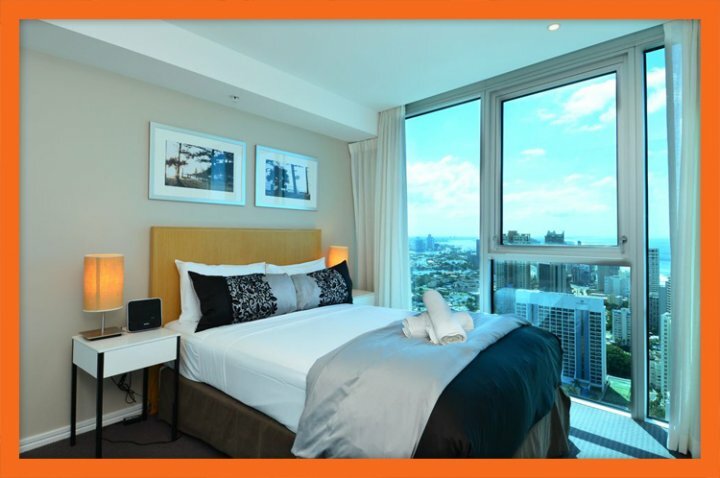 For a truly memorable holiday experience, book your Gold Coast holiday staying in Apartment 23003 at Orchid Residences. 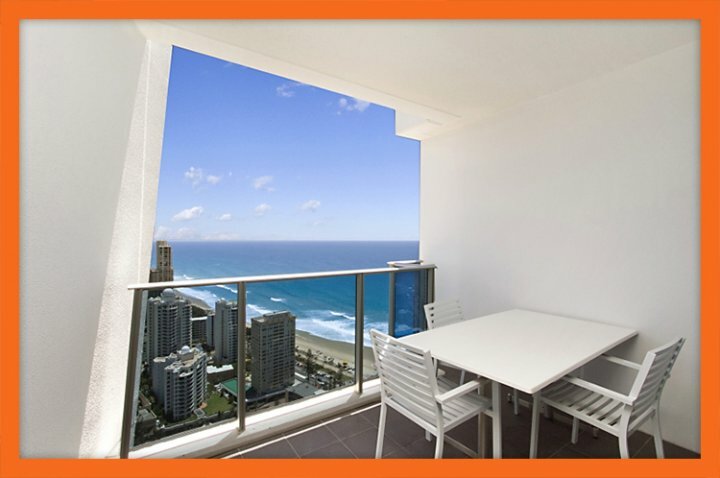 Apartment Overview Apartment 23104 is the ideal apartment for a Gold Coast holiday! 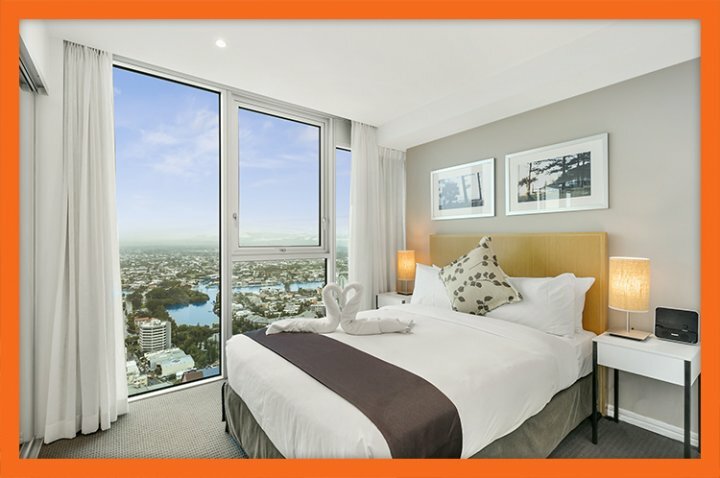 Boasting 2 spacious bedrooms and 2 bathrooms, a free car parking space, free Wi-Fi and Foxtel Premium, Apartment 23104 offers everything expected from a luxury hotel, but at a fraction of the cost. 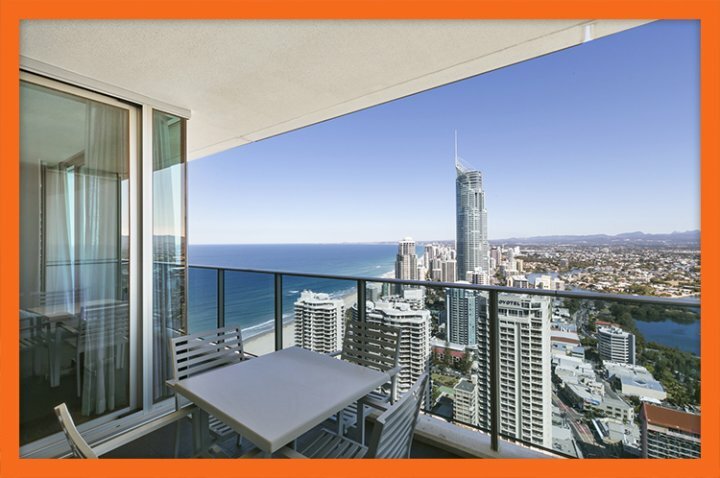 Apartment Features Apartment 23104 is located on the 31st floor of one of the most acclaimed 5-star hotels in Gold Coast's Surfers Paradise. 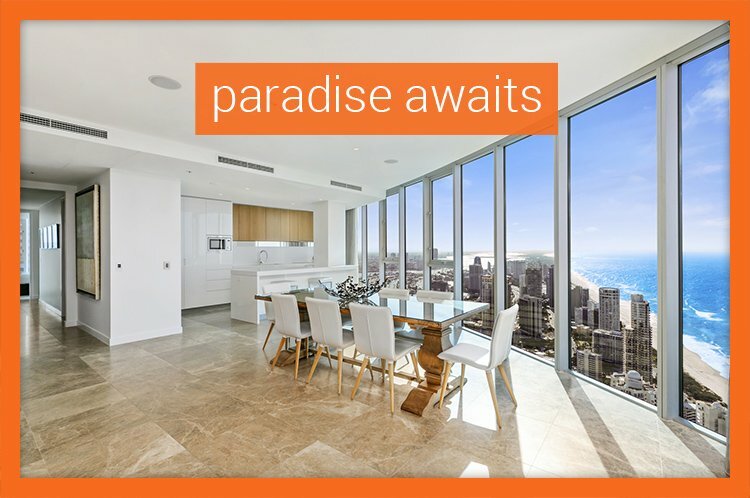 It features modern interiors and breath-taking views of the Pacific Ocean, Surfers Paradise, and greater Gold Coast area. It is spacious, fully-equipped, and offers all the comforts of home. The apartment consists of two bedrooms and two bathrooms. There are separate living and dining areas, and a fully equipped gourmet kitchen that enables guests to dine in. 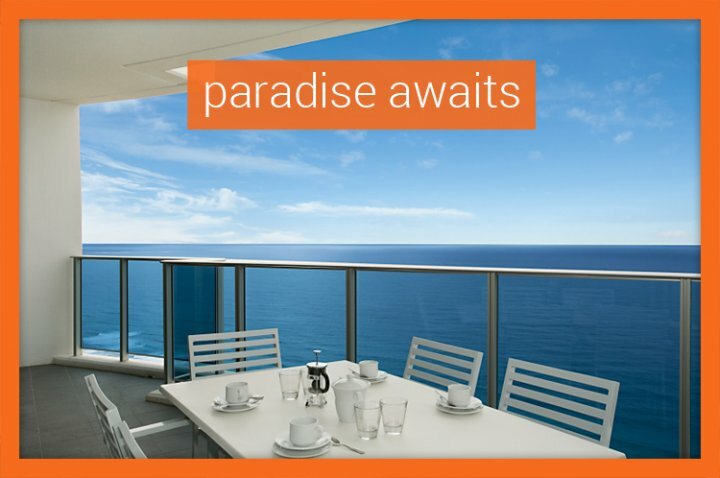 Enjoy home-cooked meals on the large balcony and take in spectacular views. The apartment also features a separate laundry room that is equipped with a washing machine/dryer. Bedding Configuration Apartment 23104 features two spacious bedrooms. The master bedroom contains a king-size bed and features a walk-in robe and an ensuite bathroom. The second bedroom contains a double bed and built in robe. The tariff for Apartment 23104 sleeps 4 guests however, two extra guests can be accommodated on roll-away beds (for a small additional fee). Simply, place a request when booking the apartment. Resort Facilities Guests have access to all facilities offered by the 5-star hotel in which Apartment 23104 is located in. These facilities include multiple swimming pools, two gymnasiums, a sauna and spa, a private theatre, BBQ area, and an on-site restaurant and bar, amongst others. 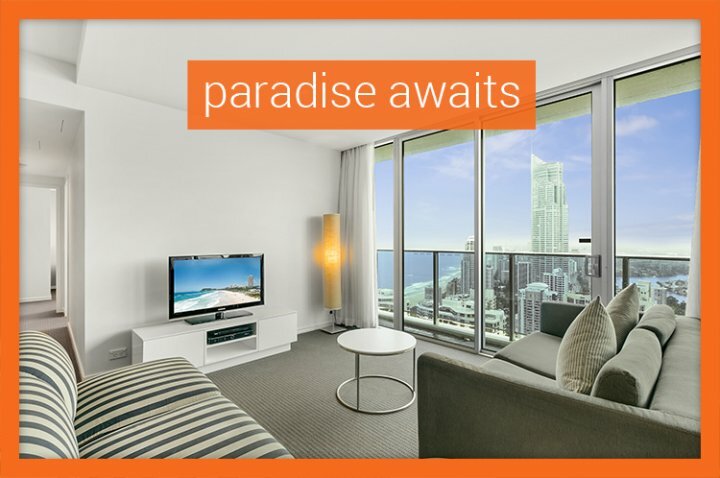 Choose Apartment 23104 at Orchid Residences for your upcoming Gold Coast holiday. You simply cannot go wrong! 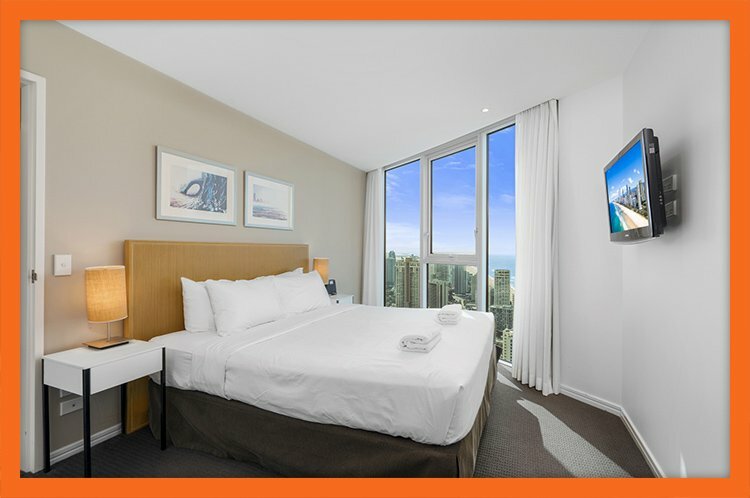 Apartment Overview Co-located within a 5 star hotel and conveniently located in the heart of Surfers Paradise, Apartment 23303 puts you within walking distance from the best of Surfers Paradise Cavill Avenue, the Esplanade, and the beach. Located on the 33rd floor, Apartment 23303 is a premium 3 bedroom apartment with 2 bathrooms and a powder room for guests. 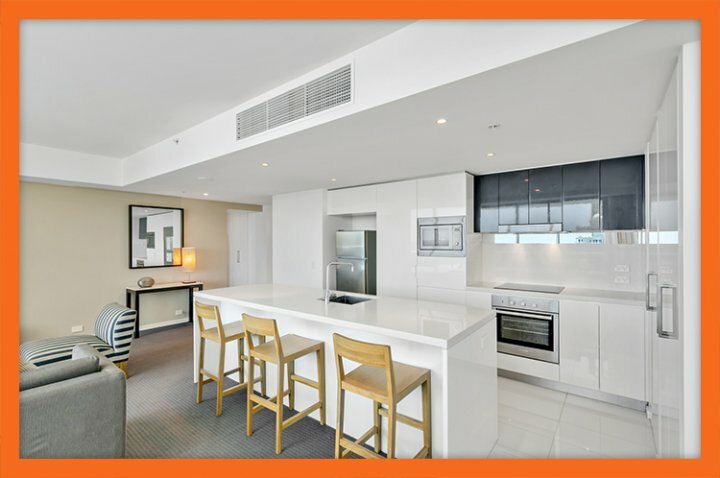 Stylish and sophisticated, this apartment is perfect for families or friends who want to experience nothing but the best in Surfers Paradise accommodation. Apartment Features Apartment 23303 offers first-class features and facilities, which should come as no surprise given the hotel it lies in. Perhaps the best feature of the apartment is its gallery kitchen, which is well complemented with an island breakfast bar. From snacks to dinner, you will enjoy preparing your meals in the apartment's gourmet kitchen. Adjacent to the kitchen is an immaculate dining area for six. 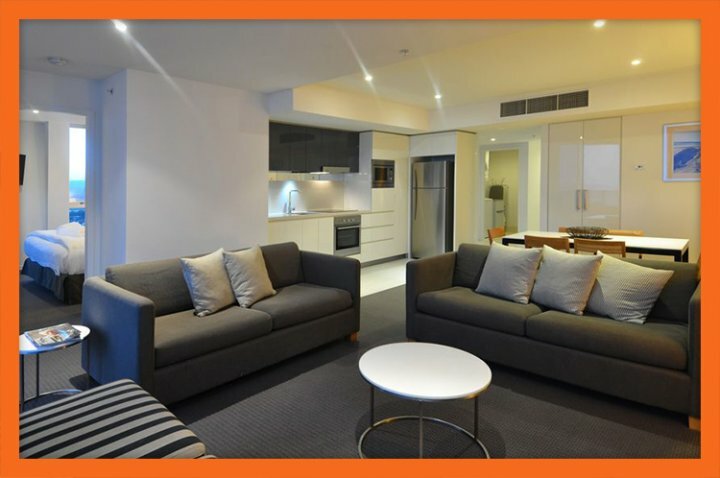 You can pamper yourself in the lounge of Apartment 23303, which is equipped with comfortable sofas, entertainment units and free Foxtel Premium. The lounge connects to a large spacious balcony, where you can enjoy sipping on some coffee, or have an alfresco dining experience. Other highlights of this apartment include free unlimited Wi-Fi, full laundry facilities and a secure undercover parking spot for your vehicle. 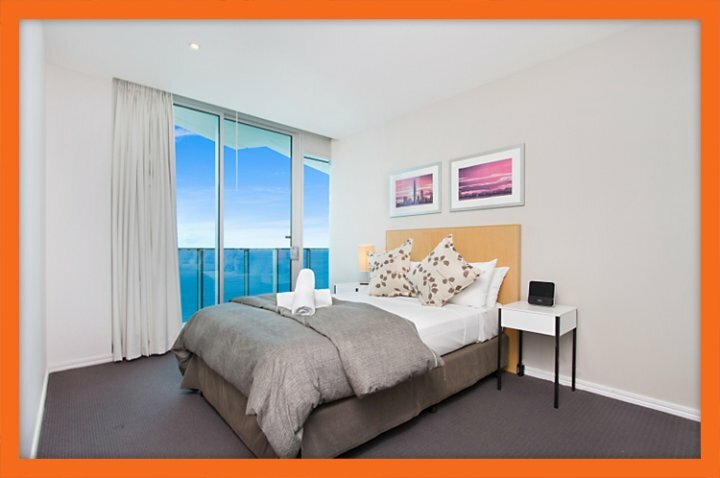 Bedding Configuration The bedrooms of Apartment 23303 are extremely inviting with splendid interiors - each offering magnificent views of the Pacific Ocean and the beach. The master bedroom has a suite of its own, which includes a king bed, a private ensuite bathroom and a TV set. Both the second and the third bedrooms include double beds and share the main bathroom. The third bedroom also opens out to the balcony. Apartment 23303 is spacious enough to sleep up to 8 guests, even though the standard tariff includes only up to 6 guests. Simply make a request when booking this apartment and extra rollaway beds will be provided at a small additional fee. Resort Facilities As mentioned, Orchid Residences is co-located within a 5 star hotel and as such, the facilities are top notch to say the least. 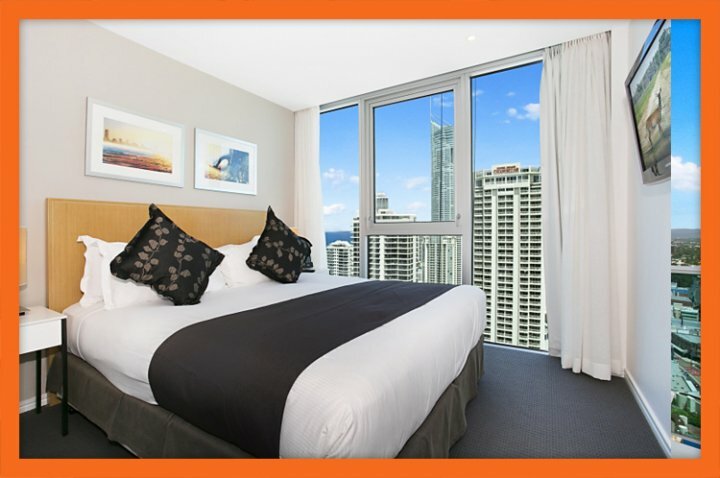 By booking Apartment 23303 as your Surfers Paradise accommodation, you will also get to enjoy all hotel facilities on offer. Kids will love the splash pool, while adults can lounge about in the plunge pools. A sauna, a spa and a 24/7 fitness centre will surely be appreciated by health enthusiasts. Pretty gardens, open entertainment zones, a private theatre, a bar and a restaurant are some of the other facilities offered by Orchid Residences. 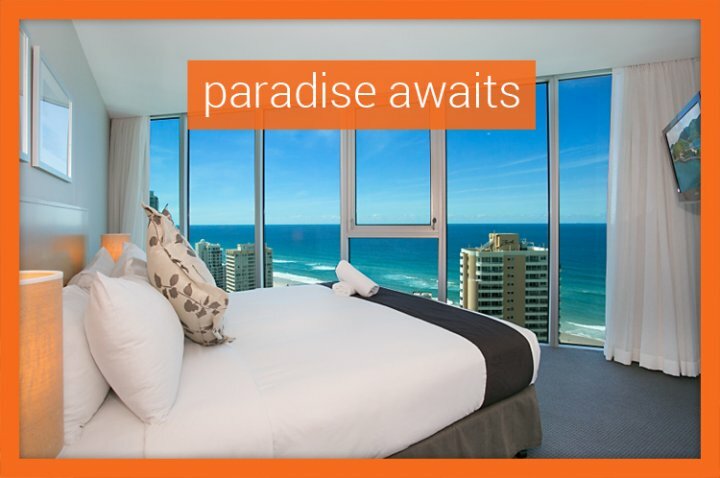 Stay in the finest Surfers Paradise accommodation by choosing Apartment 23303 at Orchid Residences. 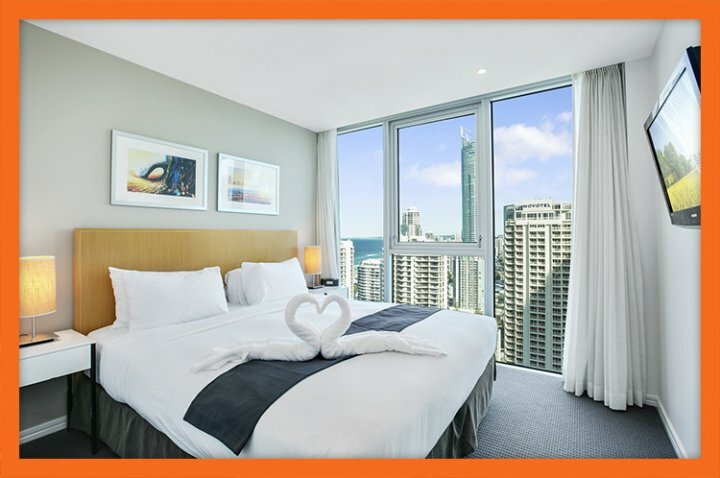 Apartment Overview When it comes to luxury Surfers Paradise accommodation, Apartment 23802 at the Orchid Residences is one holiday apartment which ranks right up with the best. 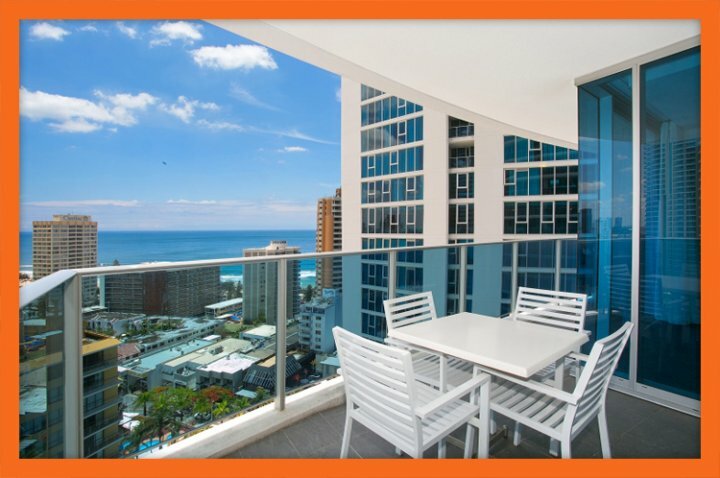 Strategically located close to the major tourist hubs of Surfers Paradise, this apartment is just minutes' walk from Cavill Avenue, the Esplanade, the beach and other tourist attractions. Furthermore, this stylish and modern apartment is co-located within a 5 star hotel, which makes it all the more attractive. 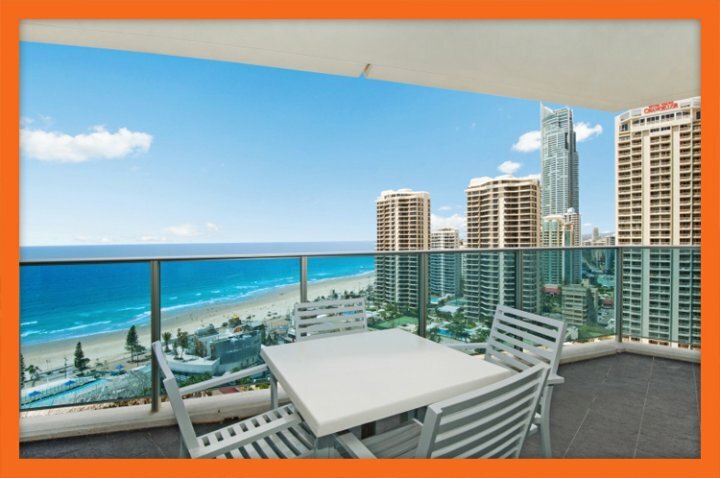 Located on the 38th level, Apartment 23802 sits high above the rest of Surfers Paradise and offers panoramic views of the ocean and the thriving skyline. Offering 2 bedroom / 2 bathroom accommodation, Apartment 23802 is perfect for couples or a small family looking for convenience and comfort on their holiday. Apartment Features Apartment 23802 offers premium facilities at a reasonable price. This apartment includes many features to look forward to and promises to offer you home like facilities on your holiday. The living area of this apartment is spacious to say the least and consists of a gourmet kitchen, a dining area and an immaculate lounge. The lounge contains several entertainment features and is equipped with comfortable sofas. You can enjoy Foxtel Premium at no extra charge. 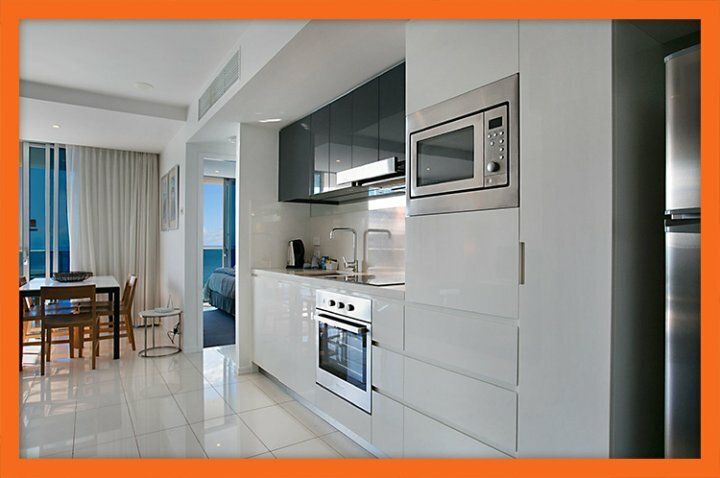 The gourmet kitchen allows you to cook your own meals on your holiday. 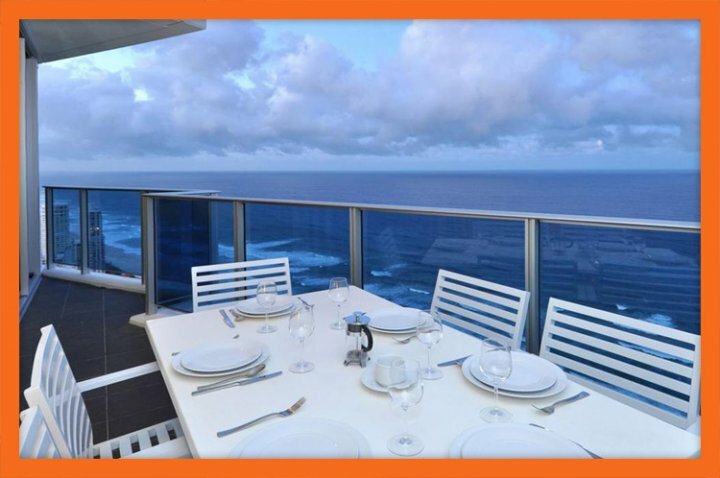 Meals can be had either in the dining area, or out on the balcony, which also contains tables and chairs. Other notable features of this apartment include full laundry facilities and free Wi-Fi. You also get 1 secure car park at no additional charges. 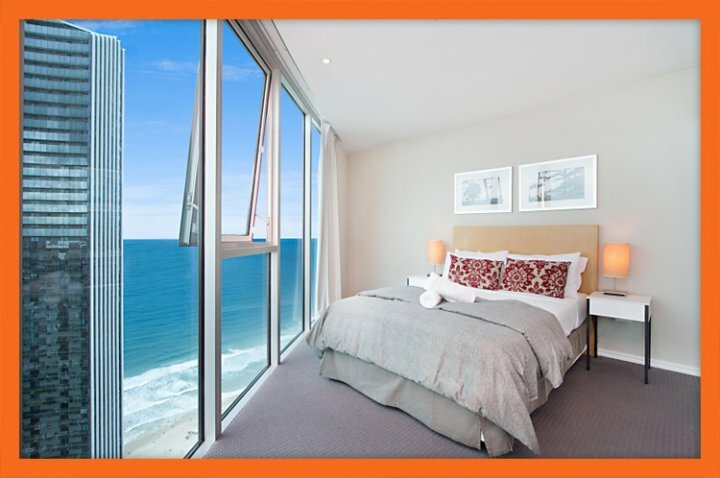 Bedding Configuration Both bedrooms of Apartment 23802 offer fantastic ocean views and feature stunning interiors. The master bedroom suite contains a king bed, a TV and has a private ensuite bathroom. The second bed contains a double bed and has access to the main bathroom. 4 guests are included in the nightly rate however you can accommodate 2 extra guests for a small surcharge. 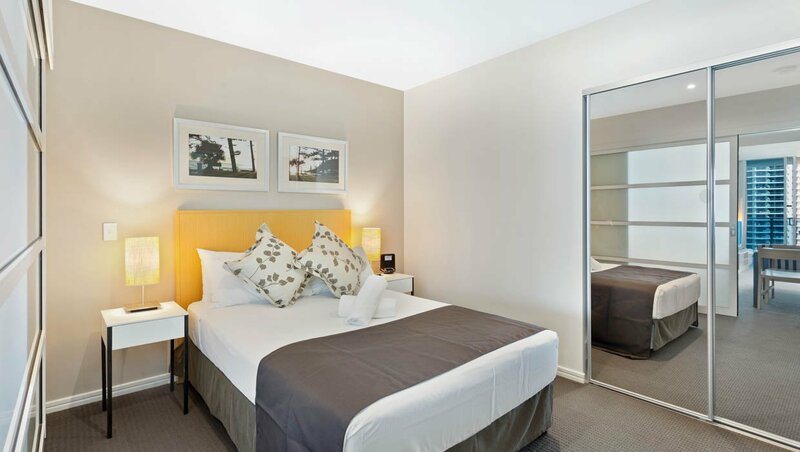 Simply make a request when you book this apartment and additional foldaway beds will be provided to you. Resort Facilities Should you choose to stay in Apartment 23802, you also get access to all the facilities offered by this 5 star hotel. If you have kids travelling with you, you can let them play about in the splash pool, while you and your partner can enjoy lounging about in the plunge pool. There is a 24/7 fitness centre, a spa and a sauna, which will definitely be enjoyed by health enthusiasts. A bar, restaurants and a private theatre are other facilities you can enjoy. 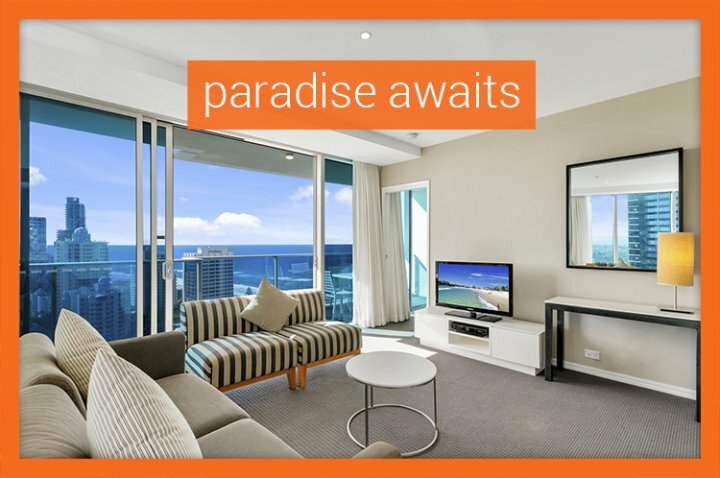 Enjoy the best of Surfers Paradise and choose Orchid Residences' Apartment 23802 for your holiday accommodation. 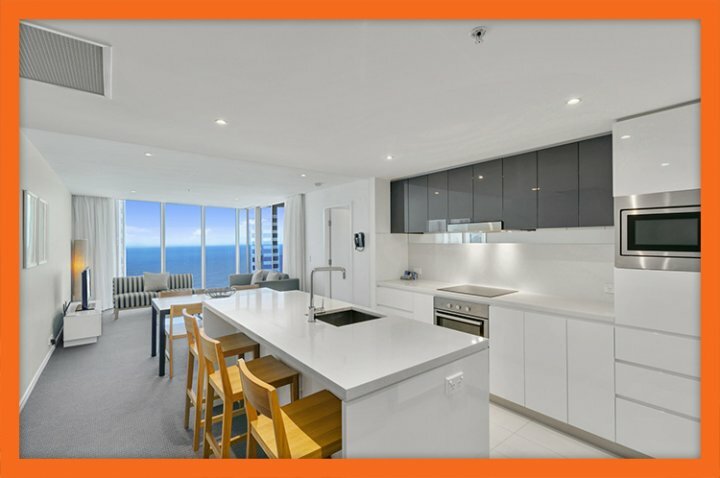 Apartment 24005 at Orchid Residences is located just 350 metres from Surfers Paradise Beach and 220 metres from Cavill Avenue in the heart of Surfers Paradise. It offers five star hotel apartment accommodation for 4-6 guests, a great location and an affordable price tag! 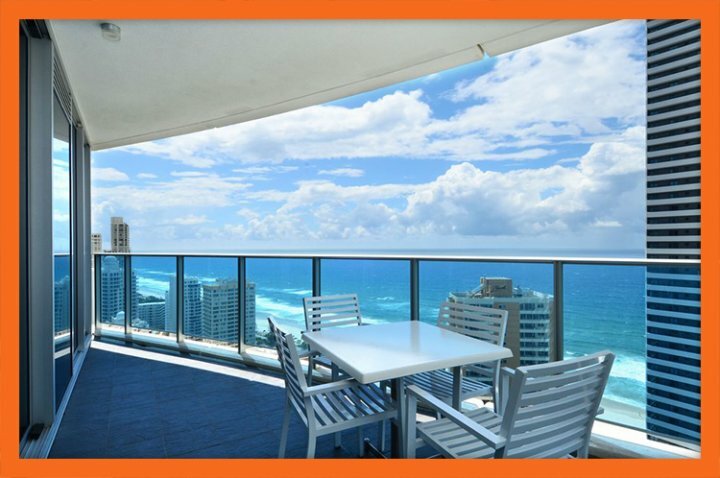 Located on the 40th level, Apartment 24105 offers fantastic ocean views. 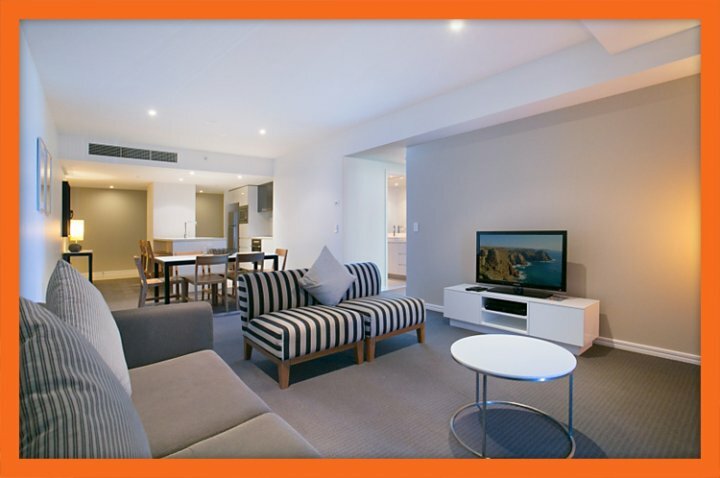 It features 2 bedrooms, 2 bathrooms, a free car parking space, free unlimited WiFi and complementary Foxtel Premium. Apartment Features Apartment 24005 offers spacious accommodation in 86 sq mts of living space. It is fully air-conditioned and fully self-contained. The apartment features all the comforts of home including a separate gourmet kitchen, dining area, lounge room and laundry nook. 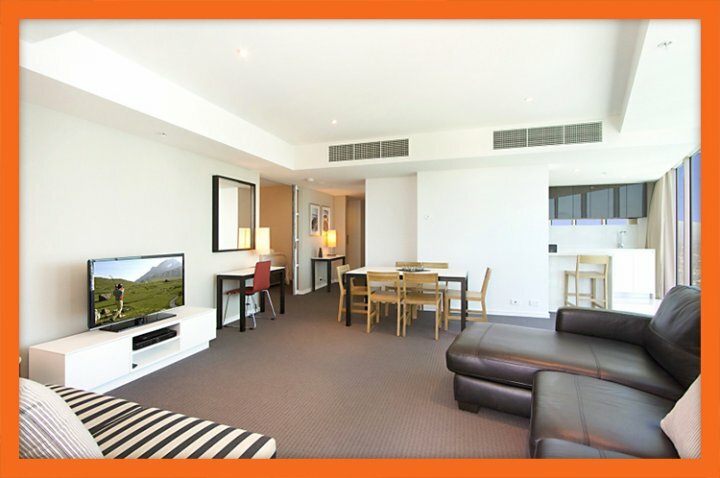 Features of the apartment include a free car parking space, free unlimited WiFi and complementary Foxtel Premium. The apartment also has a large private balcony and two bathrooms. The kitchen contains all home appliances and the lounge contains a flat-panel television and DVD player. Bedding Configuration The master bedroom contains a king bed, a walk-in robe, private ensuite bathroom and a television set. The second bedroom contains a double bed and built-in robe. Both bedrooms offer great views of the Pacific Ocean and the city. The tariff for Apartment 24005 sleeps 4 guests but the apartment can accommodate as many as 6 guests for a small surcharge. Simply place a request upon booking the apartment and additional rollaway beds will be provided. 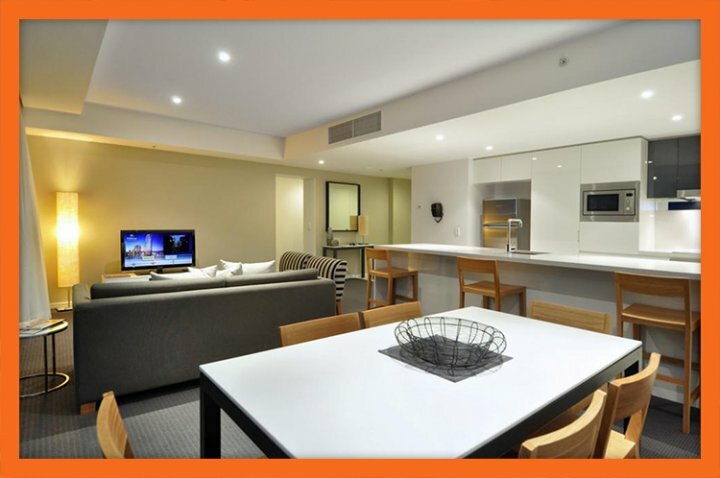 Resort Facilities Apartment 24005 is co-located within one of the Gold Coast's best hotels, which is packed with five star facilities. Guests have complete access to all the facilities which include four pools (including a pool bar), two 24 hour gyms, a spa and sauna, BBQ areas, an onsite restaurant and bar and many more. 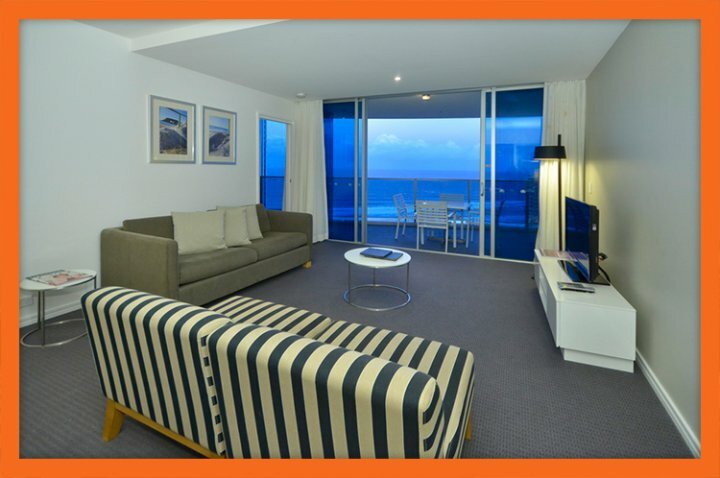 Apartment 24005 is the ideal choice for couples holidaying together. For luxury, location and an affordable price tag, look no further! Book Orchid Residences' Apartment 24005 for your holiday today. 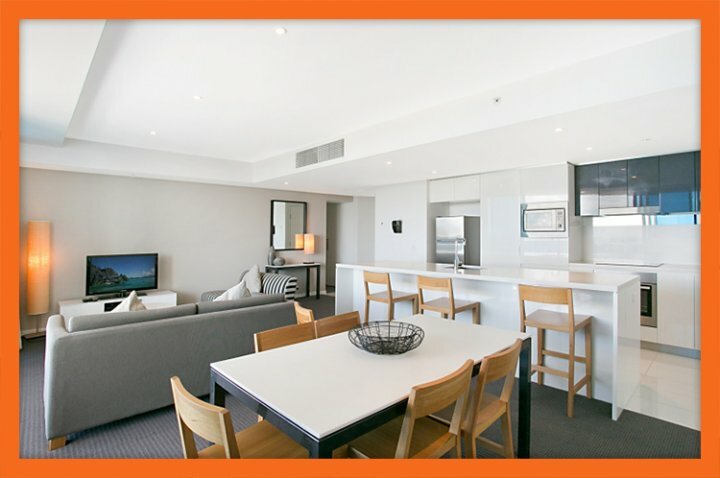 Apartment Overview To enhance your holiday experience, you need holiday accommodation that offers you supreme luxury. This is precisely what Orchid Residences' Apartment 24104 offers. 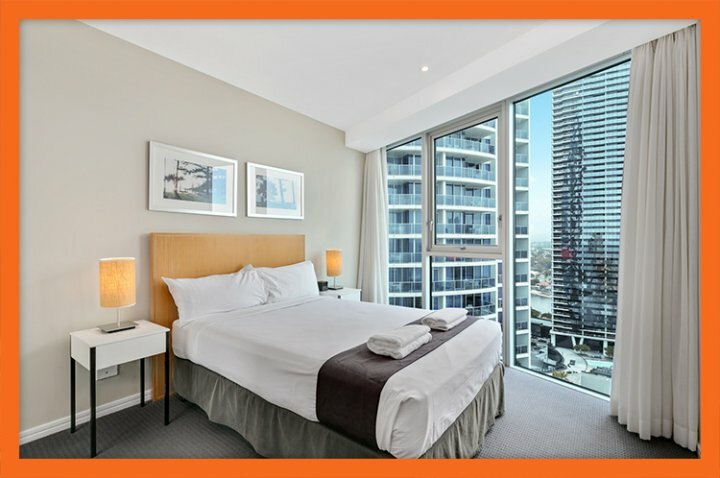 Strategically co-located in one of the most popular 5-star hotels, and right in the heart of the cosmopolitan hub of Surfers Paradise, Apartment 24104 offers you the best in comfort and convenience, all at an incredibly affordable price. Apartment 24104 is a 2 bedroom, 2 bathroom apartment, which is located high on the 41st level of Orchid Residences. 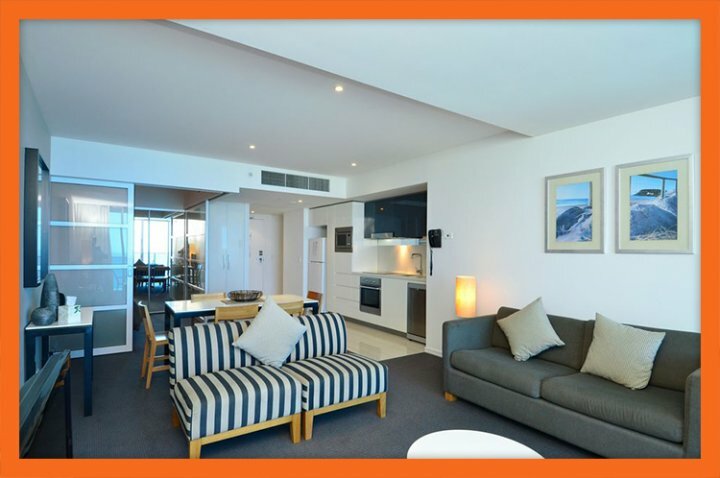 A contemporary apartment with world-class facilities and amenities, this apartment is ideal for a small family or two couples looking to share their holiday accommodation. Apartment Features A stunning apartment, Apartment 24104 offers best in class luxury and quality features. Look forward to a spacious living area, which includes a lounge, a gourmet kitchen and a dining area that opens out to a large balcony with grand ocean views. The lounge includes several entertainment options, including Foxtel Premium at no additional expense. Unlimited free Wi-Fi is also provided in this apartment. Cost savings are one of the biggest aspects of this apartment and this is helped by the fully-equipped gourmet kitchen, which allows you to enjoy home cooked meals whilst on holiday. You can enjoy your meals in the dining area, or out on the balcony, which offers a unique alfresco dining experience. Other great features of this apartment include 1 free car park and complete laundry facilities. 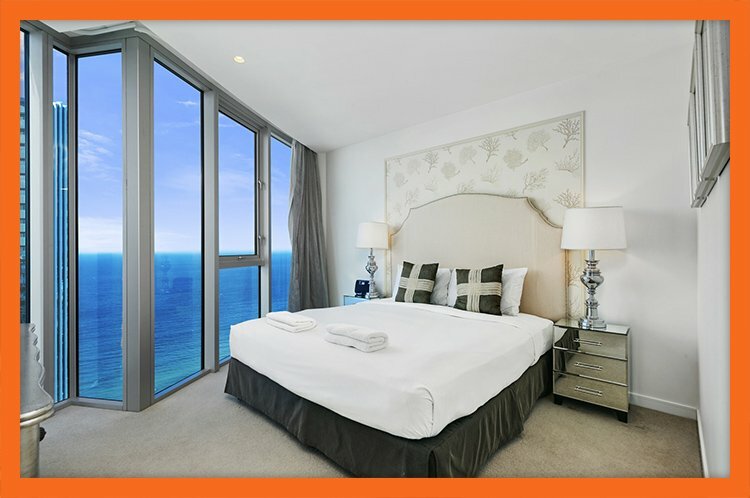 Bedding Configuration Both bedrooms offer a contemporary design and stunning ocean views. The main bedroom features a king bed and includes a private ensuite bathroom, while the second bedroom features a double bed and has direct access to the main bathroom. The tariff for Apartment 24104 sleeps 4 but can sleep up to 6 guests. In order to have 2 extra guests at the apartment, all you need to do is to place a request when you book the apartment and you will be provided 2 rollaway beds at a small surcharge fee. Resort Facilities Orchid Residences offers nothing but the best in terms of resort facilities. Given it lies within a 5-star hotel, you can enjoy all facilities on offer, which include indoor and outdoor swimming pools, children's pool, a gymnasium and a fitness centre, a spa and a sauna, outdoor entertainment areas, a bar and restaurants and much more! 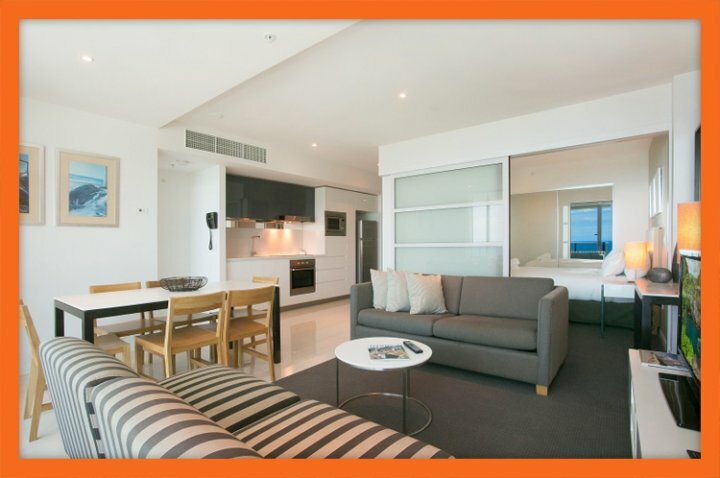 For a truly memorable holiday, choose Orchid Residences' Apartment 24104 for your holiday accommodation. 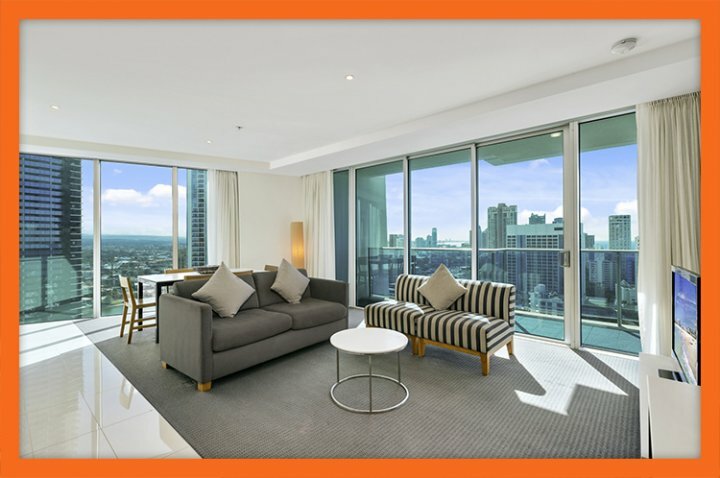 Apartment Overview Orchid Residences, Apartment 24105 is a premier holiday apartment that is located in one of the most famous 5 star hotels on the Gold Coast. It boasts of a great location, superior luxury and plenty of space for a family. 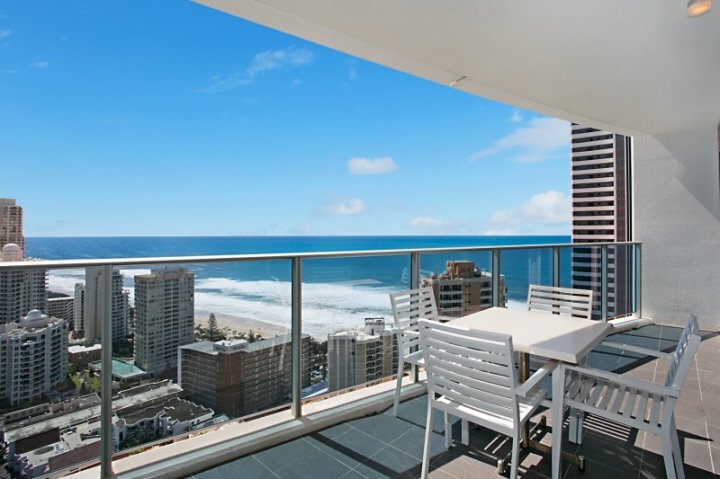 Located on the 41st level, Apartment 24105 offers majestic southerly ocean views of the city and Pacific Ocean. 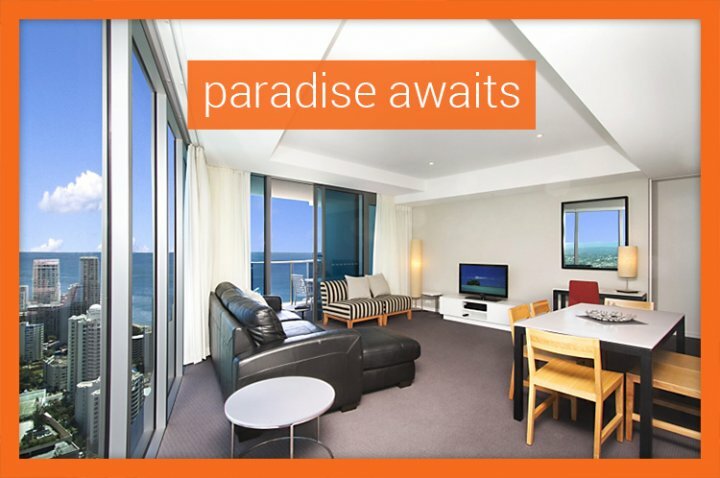 It features 2 bedrooms, 2 bathrooms, Free and unlimited WiFi, free parking and free Foxtel Premium. Apartment Features Apartment 24105 is fully self-contained and air-conditioned. It features two bathrooms, a full-sized and fully-equipped kitchen, a separate dining and living area, a separate laundry and a spacious balcony. 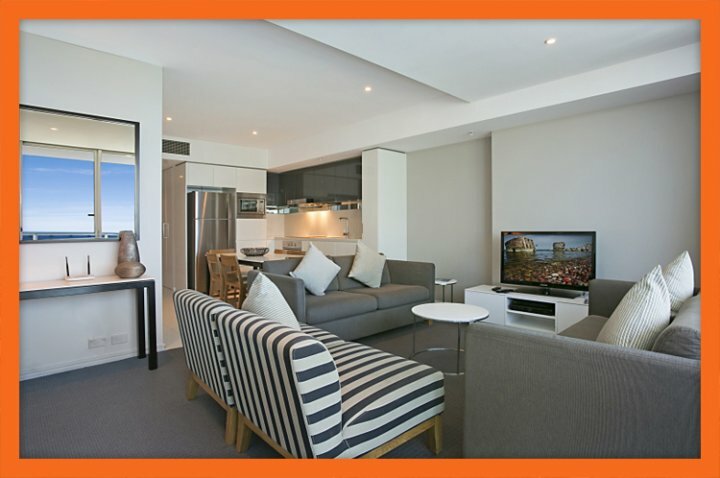 The living area features a flat panel TV (with complementary Foxtel Premium), a DVD player and seating for four guests. The main bathroom features a bath/shower, toilet and vanity, while the ensuite features a shower, toilet and vanity. There is a washing machine / dryer and sink in the laundry. Bedding Configuration The master bedroom contains a king bed, walk-through robe and television. The second bedroom contains a double bed and built-in robe. 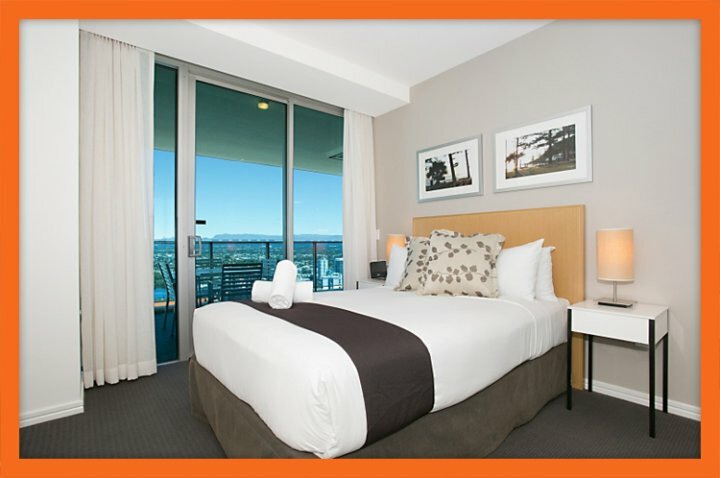 Both bedrooms offer great southerly views across the city and of the Pacific Ocean. Apartment 24105 sleeps up to 4 people. However, it can accommodate up to 6 people for a small surcharge. Simply place a request upon booking the apartment and additional rollaway beds will be provided. Resort Facilities Apartment 24105 is located within a 5 star resort that offers guests a range of great facilities. Such facilities include four pools (including a pool bar), a spa and sauna, two 24 hour gyms, BBQ areas, an onsite restaurant and bar plus much more. Apartment 24105 has it all location, luxury and space for the family! Book your stay in Orchid Residences' Apartment 24105 today. 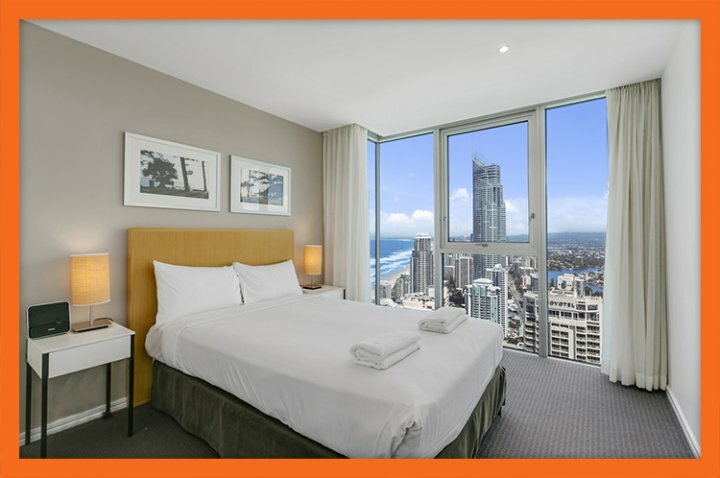 Apartment Overview Orchid Residences, Apartment 24402 is a superior hotel-style holiday apartment that offers unbeatable accommodation in the heart of Surfers Paradise. 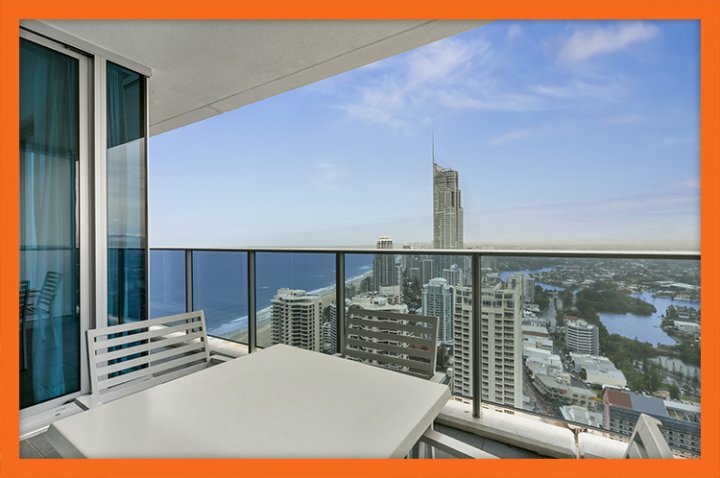 Perched high on the 44th floor of this renowned hotel, Apartment 24402 offers breathtaking views of the Gold Coast, Surfers Paradise Beach and Pacific Ocean. If you're ideal holiday is to relax in absolute luxury, then Apartment 24402 is for you. 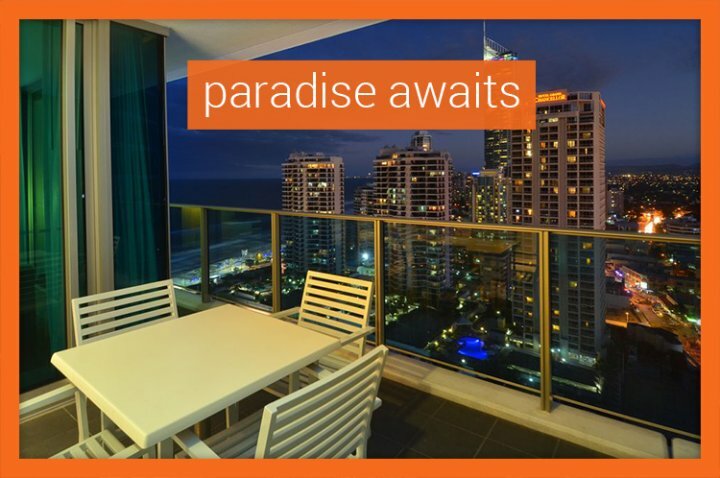 The 2 bedroom 2 bathroom apartment, which is privately managed by GCHR, offers spacious hotel-style apartment living in the heart of Surfers Paradise. 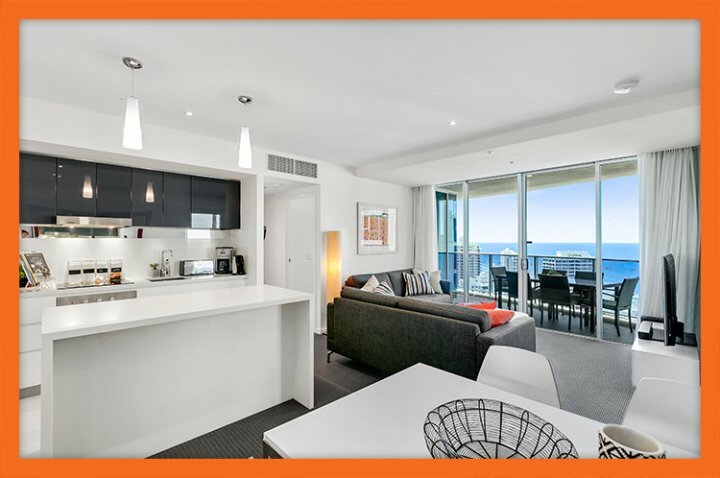 Capable of sleeping 6 guests (4 included in the tariff, 2 extra for a small fee), Apartment 24402 is the ideal home-base for small families, friends or two couples looking to live lavishly on their Gold Coast holiday - without the lavish price tag! Apartment Features The apartment offers ample room for guests with a separate dining and lounge area, gourmet kitchen, full laundry facilities and a remarkable balcony, where you can sit and take in the amazing views on offer. The fully-equipped kitchen means you're able to cook up a storm and entertain guests as you enjoy a night in dining at the dinner table or alfresco out on the large finished balcony. The kitchen contains everything you'd find in your very own kitchen full cooking utensils, full-size fridge/freezer, a stove-top, an oven and even a microwave. Best of all, it is open-plan - so you'll never feel like you're missing out on any of the evening's conversations or interactions. The highlights of the apartment don't stop there. 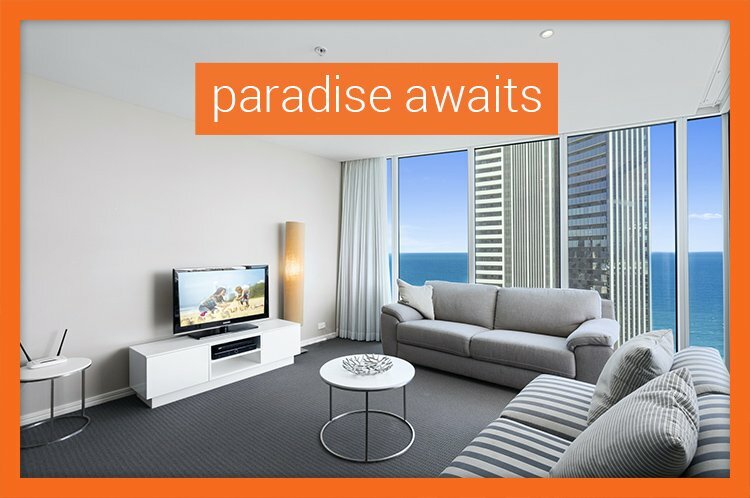 If you choose Apartment 24402 of Orchid Residences for your Gold Coast holiday accommodation, you also receive a complementary car park, free unlimited Wi-Fi and free Foxtel Premium channels! Furthermore, Apartment 24402 contains a DVD player and stereo, personal safe, flat-panel TV in the lounge (and master bedroom), a washing machine and dryer and is fully air-conditioned. At Apartment 24402, everything has been considered! Bedding Configuration The bedrooms are equally as considerate. The master bedroom offers guests a king bed, flat-panel TV, private ensuite, a walk-in-robe and great northern views wake up to unforgettable sun-rises each day. The second bedroom features a double bed, built-in-robe, great views and shares the apartment's main bathroom. 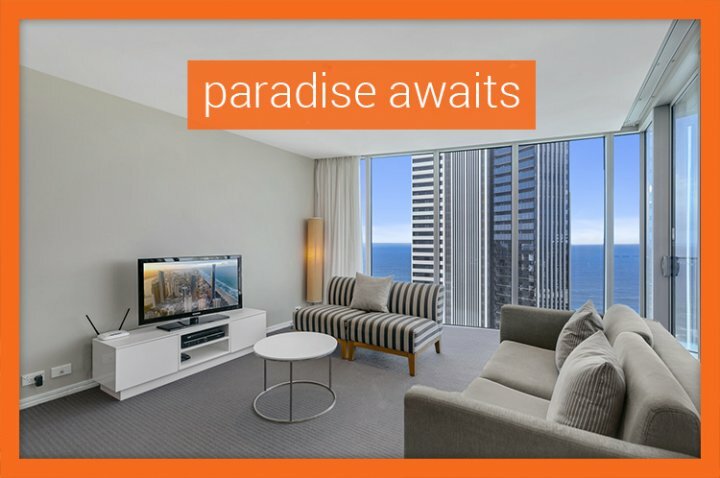 For unbeatable accommodation in the heart of Surfers Paradise, you simply cannot beat the value for money offered by Orchid Residences, Apartment 24402. Apartment Overview Orchid Residences' Apartment 24502 offers a refreshing holiday experience for small groups of four to six guests. 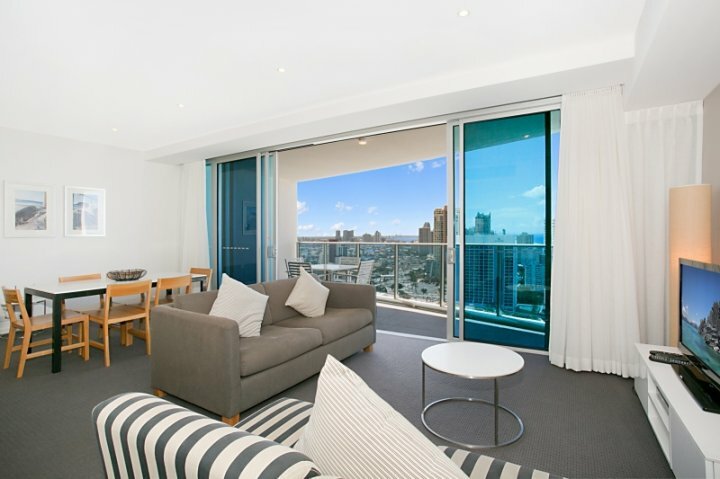 Located within one of the Gold Coast's most prestigious five-star hotels, this well-equipped apartment features two bedrooms and two bathrooms, and it is located just meters from the heart of Surfers Paradise. 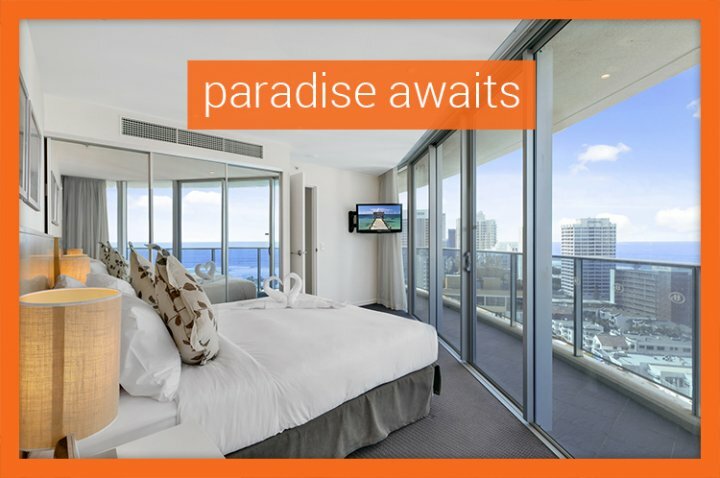 Guests will enjoy free car parking space, free Wi-Fi and spectacular ocean views from 45 floors above sea-level. 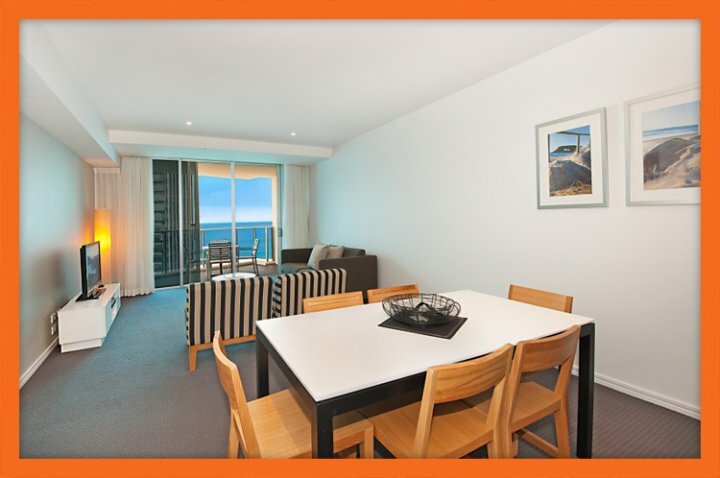 Apartment Features Apartment 24502 is a very modern and well-equipped self-contained holiday apartment. Therefore, it contains everything needed for a spectacular holiday experience. It features two bedrooms and has two bathrooms, one being an ensuite bathroom off the main bedroom. The spacious living area features a widescreen TV and a DVD player. 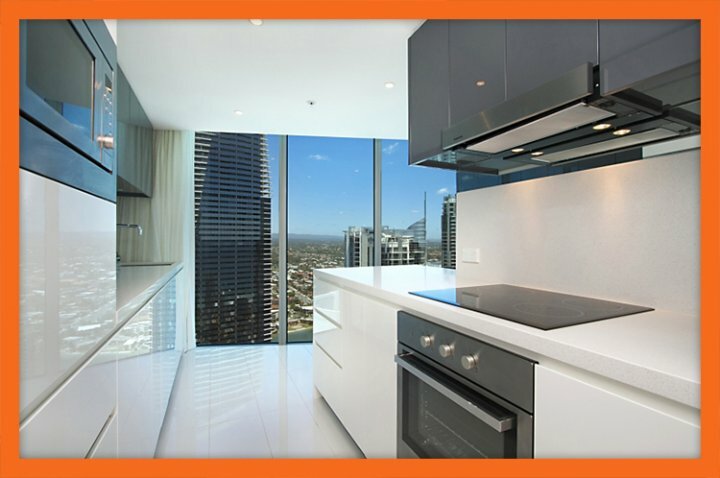 The full kitchen features high-end appliances and all kitchen essentials. 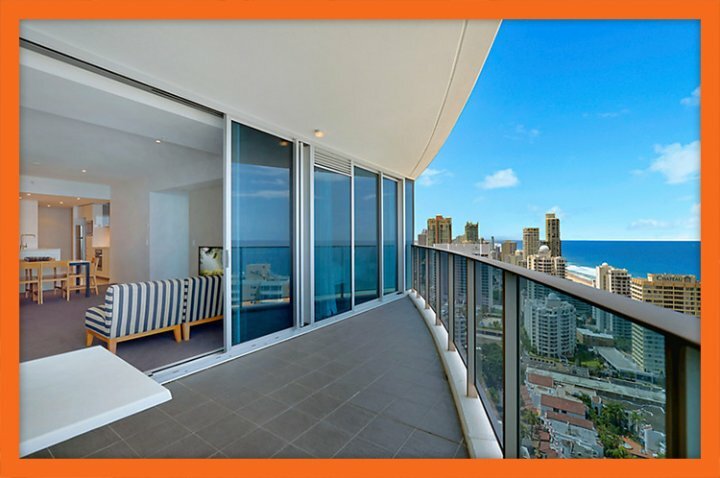 The large private balcony contains an outdoor dining set and offers ocean, beach and city views. And lastly, the laundry, with its washing machine/dryer and ironing board is sure to come in handy. Bedding Configuration Apartment 24502 features two bedrooms that sleep four guests, however, the apartment can sleep as many as six guests. Simply order roll-away beds when making a booking. The master bedroom contains a king size bed and a television. It features a private ensuite and great ocean views. 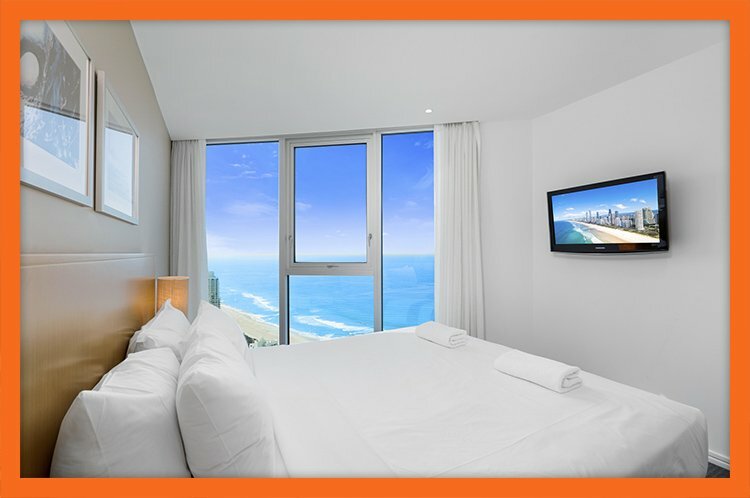 The second bedroom contains a double bed and also features ocean views. Resort Facilities Apartment 24502 is co-located in a 5-star resort, which is jam-packed with luxury facilities. These facilities include a sauna and spa, four swimming pools, two gymnasiums, BBQ area, a private theatre, and an on-site restaurant and bar, amongst others. For a refreshing getaway, book Apartment 24502 at Orchid Residences today. Apartment Overview Orchid Residences, Apartment 24802 is what dream holidays are comprised of luxurious accommodation, elegant interiors and spectacular views of crystal blue oceans everywhere you look. 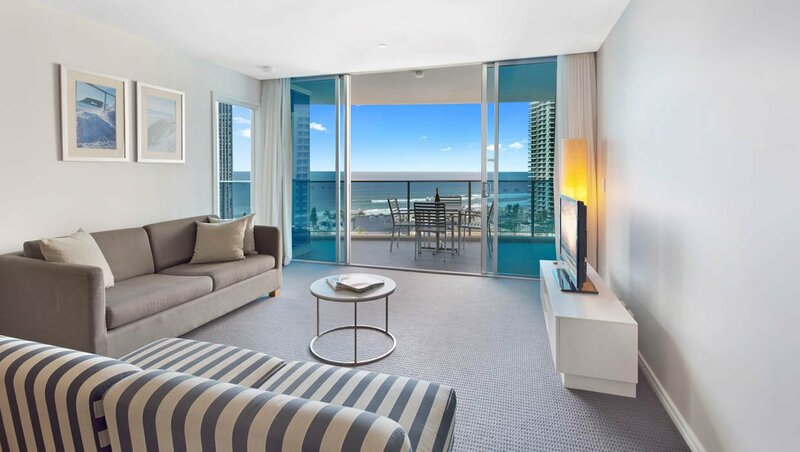 Located in the absolute heart of Surfers Paradise in one of the world's most famous hotels, Orchid Residences, Apartment 24802 offers privately managed self-contained holiday accommodation ideal for larger families and friends looking to live lavishly on the Gold Coast. 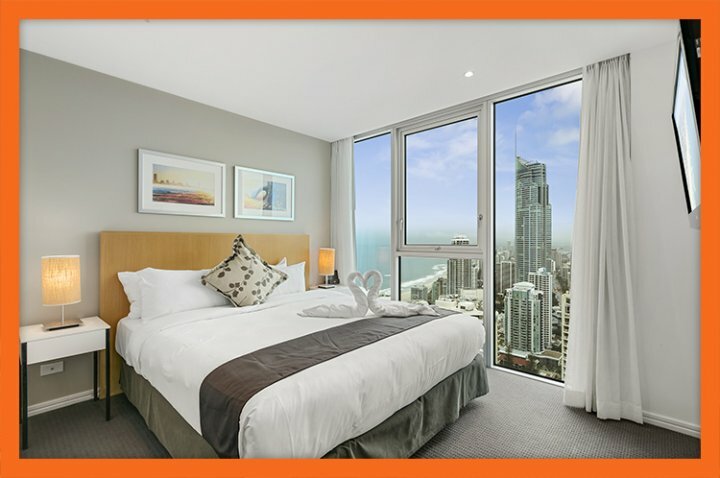 This 3 bedroom hotel-style holiday apartment is fully air-conditioned and located on the 48th floor, so immediately know you you'll be in for a treat. Enjoy amazing northerly views as you holiday in five-star comfort with all the comforts of home, and then some. 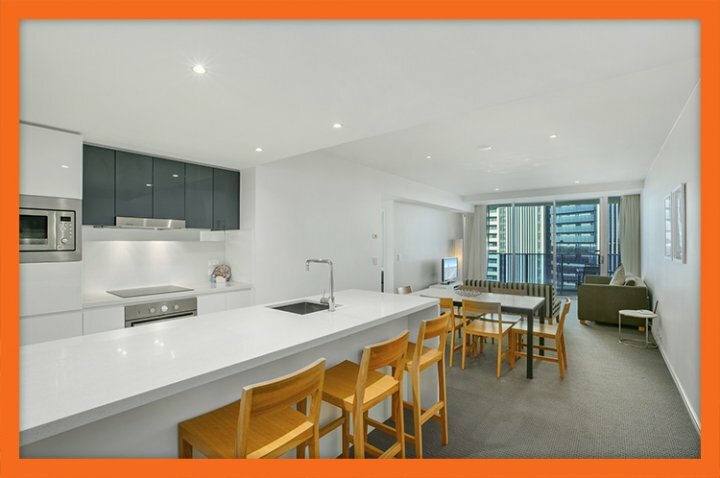 Apartment Features Apartment 24802 offers 130 square metres of luxury living space complete with 2.5 bathrooms and separate lounge, dining and laundry areas. The lounge offers large comfortable couches which can be enjoyed while watching the free Premium Foxtel or catching up on Social Media feeds thanks to the free unlimited Wi-Fi - available exclusively through GCHR. The lounge also features an entertainment system and a DVD player for your entertainment. The open-plan kitchen offers everything you'd expect from five-star holiday accommodation European appliances including a full-size refrigerator/freezer, dishwasher, stove-top, electric oven, full pantry and microwave. Full cooking utensils are also provided. A night-in is enjoyed all the more with good food and good company. Thankfully, Apartment 24802 makes this possible with a separate dining area and a 6 seater outdoor setting, which is located on the balcony the perfect spot to dine and chat about the day's activities while getting lost in the breathtaking city lights and ocean views. Bedding Configuration The accommodation does not disappoint either the spacious master bedroom features a king bed and private ensuite bathroom. It also contains a walk-in-robe and amazing views of the Pacific Ocean, which will surely be appreciated as you wake up to the sun-rise each morning. The second and third bedrooms each feature a double bed with built-in-robes. While the second bedroom offers similar views of the master bedroom, the third bedroom has direct balcony access. Orchid Residences, Apartment 24802 also features full laundry faculties including a washing machine, dryer, iron and ironing board, a hair dryer, personal safe and all linen is supplied. Everything you need for a hassle-free holiday is right here at Apartment 24802. All you need to do is turn up! 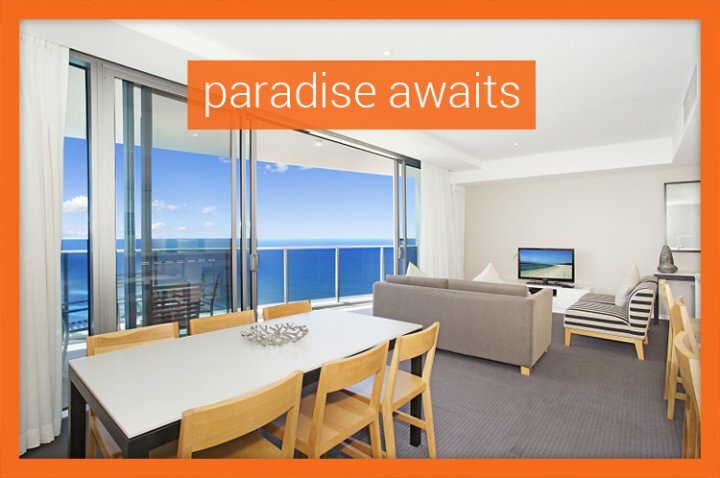 GCHR look forward to welcoming you on your Gold Coast holiday. 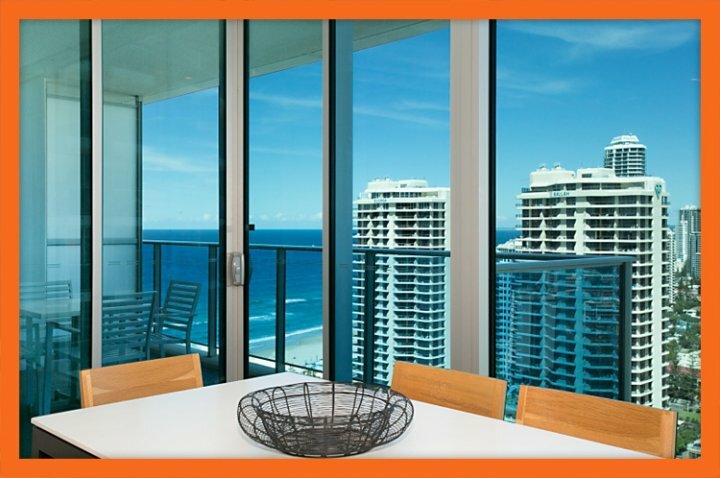 Apartment Overview Apartment 25102 at Orchid Residences is one of the most luxurious apartments in Surfers Paradise. 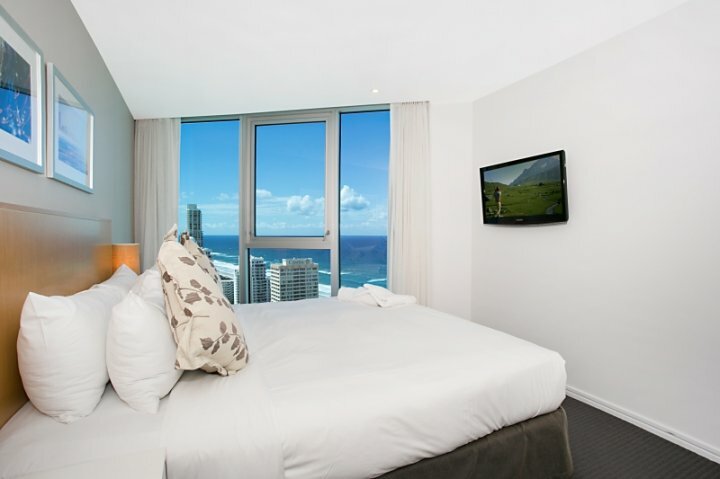 Located in one of newest and most well-known 5 star Surfers Paradise hotels, it is conveniently located close to the beaches and all major tourist attractions of Surfers Paradise making it the ideal choice for your Surfers Paradise accommodation needs. 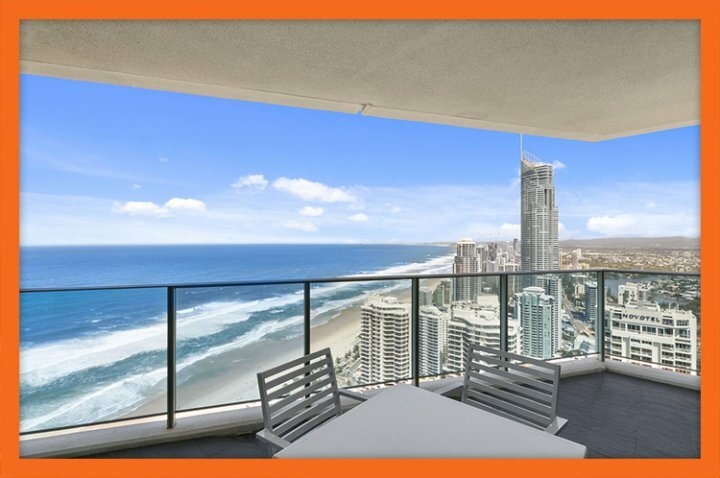 Nested high above Surfers Paradise on the 51st level of the Orchid Residences tower, Apartment 25102 offers ethereal panoramic views of the ocean, the beaches and the skyline. 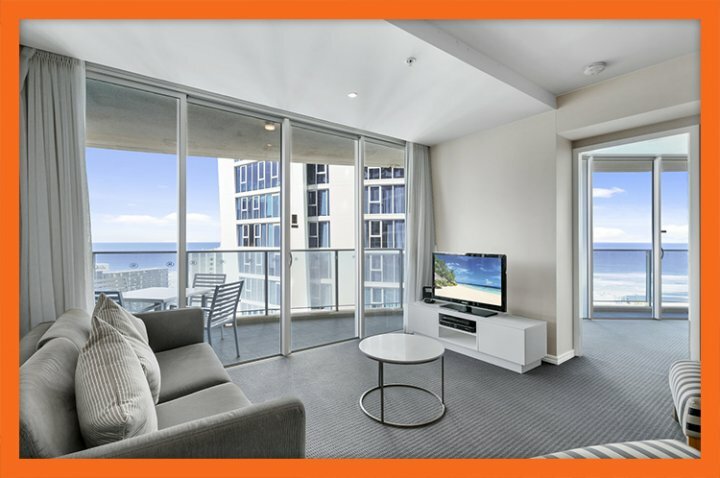 This spacious 3 bedroom/ 3 bathroom apartment offers stylish and sophisticated accommodation ideal for large groups of friends or families looking to enjoy a Gold Coast holiday. Apartment Features Boasting luxury and elegance, Apartment 25102 offers superior features and this is to be expected, given that it is located within a 5 star hotel. The sprawling living area of this apartment contains a fully furnished lounge, a dining area and a gourmet kitchen. 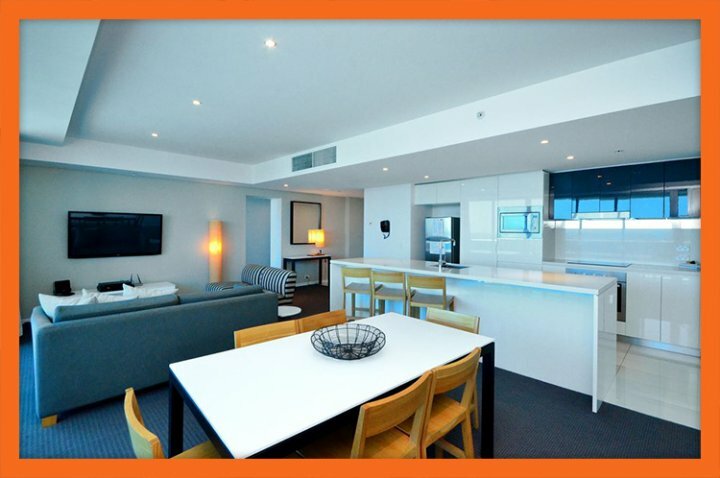 The lounge is one of the notable features of this apartment and includes sofas, entertainment systems and Foxtel Premium. The lounge also opens out to the balcony, which contains an outdoor setting. The gourmet kitchen is fully-equipped and allows you to enjoy home cooked meals whilst on holiday. The dining area lies just adjacent to the kitchen and promises to make your dining experience much more enjoyable. Other features of Apartment 25102 include full air-conditioning, free unlimited Wi-Fi and complete laundry facilities. A secure undercover parking space will also be provided to you at no extra charge. 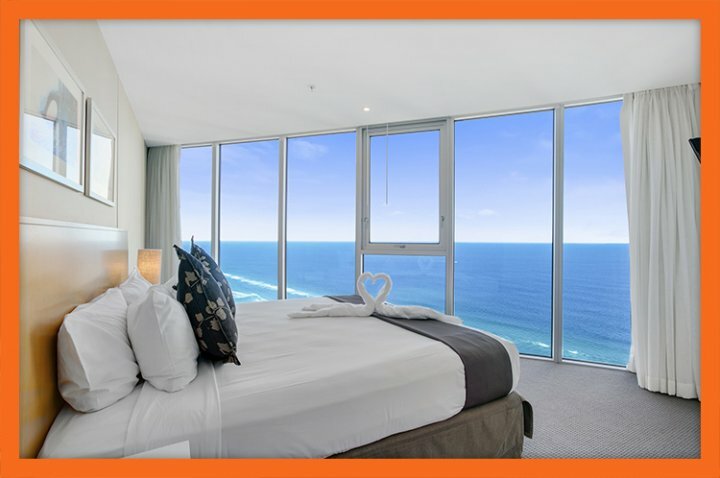 Bedding Configuration The bedrooms of Apartment 25102 are quite alluring, feature stunning interiors and offer splendid views of the beaches and the hinterland. The master bedroom is a suite of its own and contains a king bed, a TV and a private ensuite bathroom. Both the second and third bedrooms contain double beds. The third bedroom also has direct access to the main balcony. While Apartment 25102 include up to 6 people, it can accommodate 2 extra guests for a small additional fee. All you need to do is to place a request upon booking the apartment and you will be provided with extra rollaway beds. Resort Facilities Apartment 25102 gives you full access to the facilities of the 5 star hotel, which it is co-located in. Facilities to look forward to include four swimming pools, a spa and a sauna, a private theatre, two fitness centres and a choice of bars and restaurants. 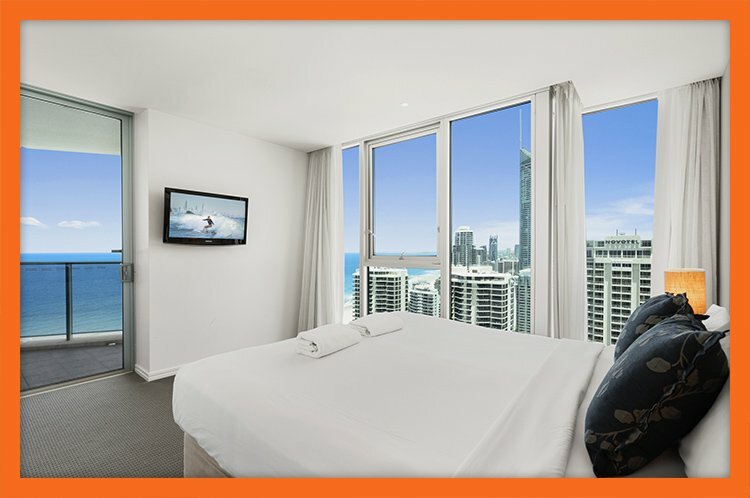 For the best possible holiday experience on the Gold Coast, choose Apartment 25102 at Orchid Residences for your accommodation. 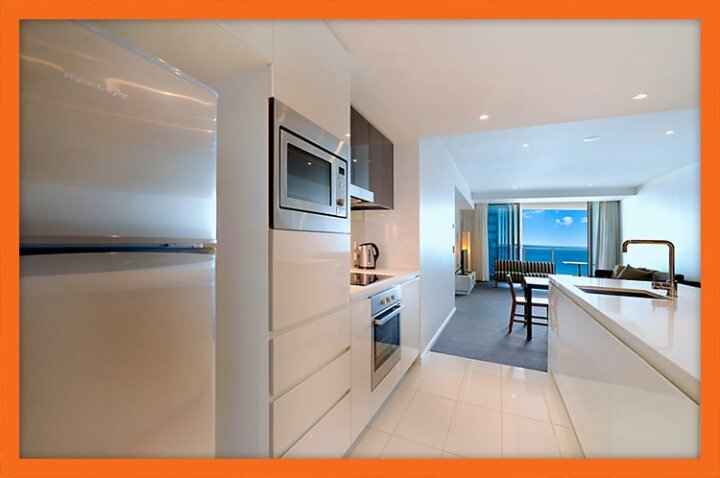 Apartment 25401 is one of the largest, most luxurious holiday apartments in Surfers Paradise! 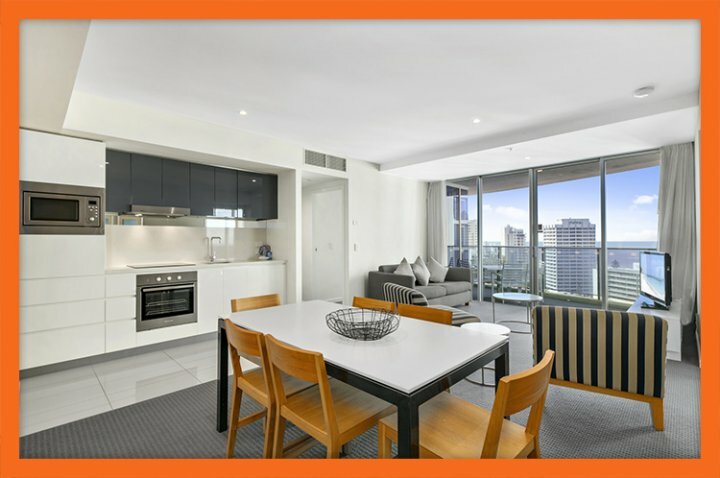 Covering more than 230 square metres, this 5-star apartment boasts 4 spacious bedrooms, 3 bedrooms, and comes with three free car parking spaces, free Wi-Fi and Foxtel Premium. 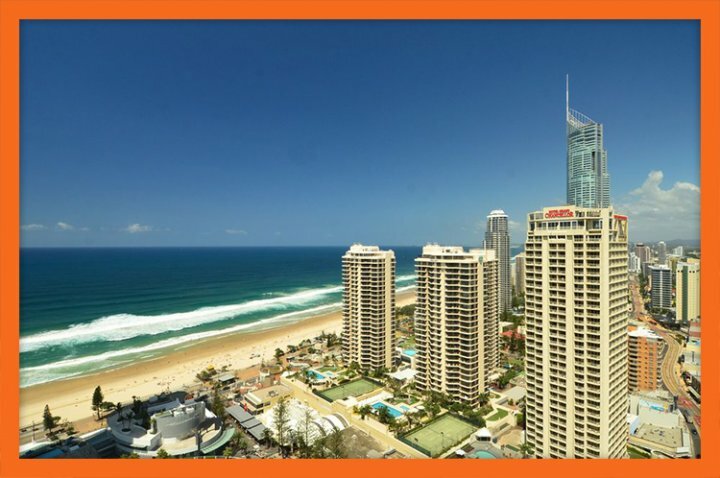 Moreover, it is located on the 54th floor of one the most prestigious hotels on the Gold Coast and offers spectacular views of Surfers Paradise Beach and the Pacific Ocean. 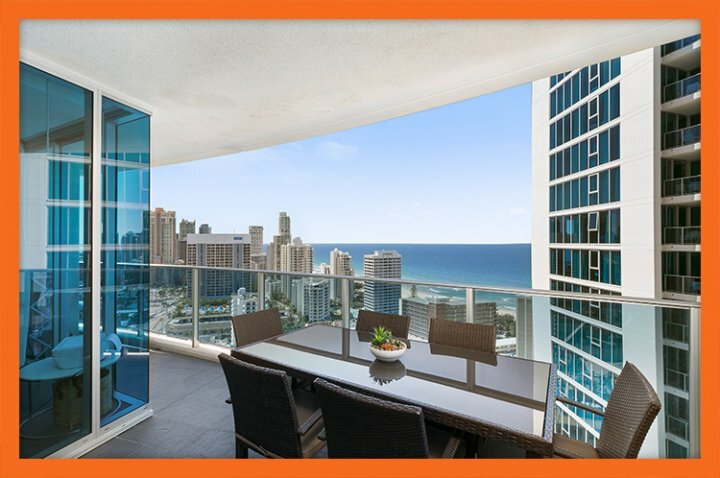 Apartment Features Apartment 25401 is the epitome of luxury and sophistication. 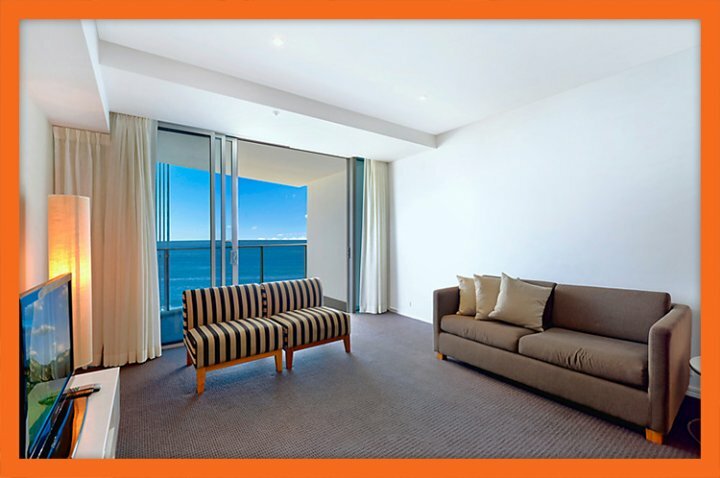 With tasteful modern décor, this luxurious holiday apartment offers the best of the best. It is spacious and fully-equipped to offer all the comforts of home with a 5-star twist. The apartment features three bedrooms and three bathrooms. 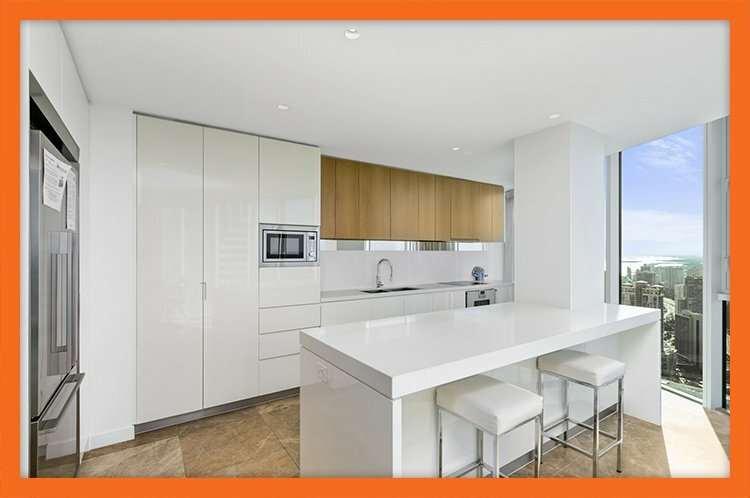 There is a separate living area and dining area, and a high-end gourmet kitchen that is equipped with every appliance needed to cook up a storm. The apartment also features a separate laundry room with a washing machine/dryer and has a large furnished balcony so you can enjoy the views on display. Bedding Configuration Apartment 25401 features four spacious bedrooms. The master bedroom contains a king bed and has an ensuite bathroom. The second, third and fourth bedrooms all contain double beds. The tariff for Apartment 25401 sleeps 8 people however, this apartment can accommodate two extra guests for a small additional fee. 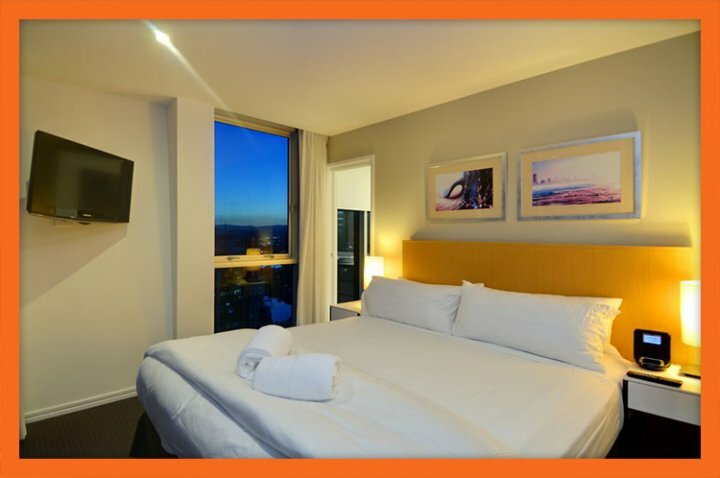 (Simply, place a request for one or two roll-away beds when booking this apartment) Resort Facilities Being co-located within a 5-star hotel, guests have total access to all the great facilities that are on offer. Such facilities include four swimming pools, a sauna and spa, two gymnasiums, a private theatre, BBQ area and an on-site restaurant and bar, amongst others. 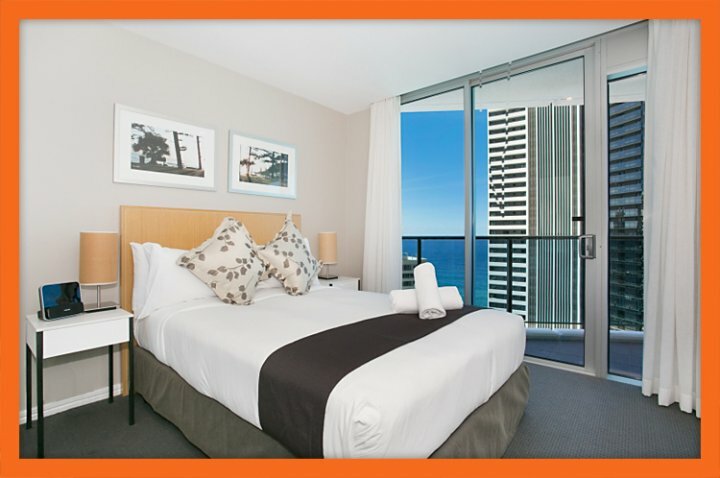 Choose Orchid Residences Apartment 25401 as your Surfers Paradise holiday accommodation. You simply cannot go wrong! 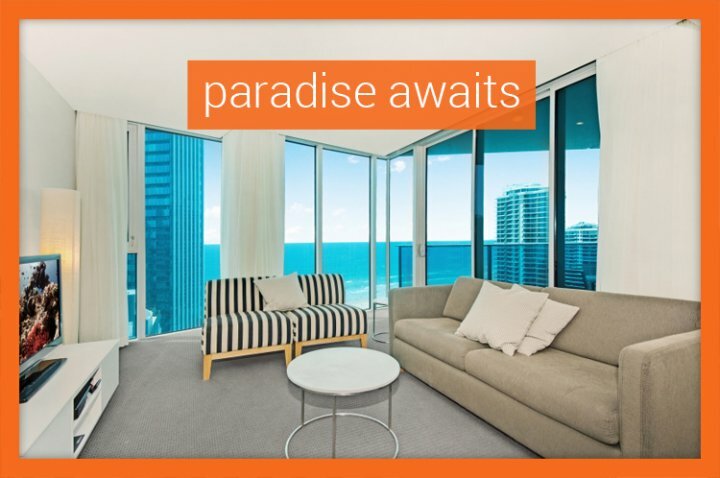 Orchid Residences is located between Surfers Paradise Boulevard and Orchid Avenue in the centre of Surfers Paradise. The main entrance is to be found on Orchid Avenue. This is also the entrance to the car park. 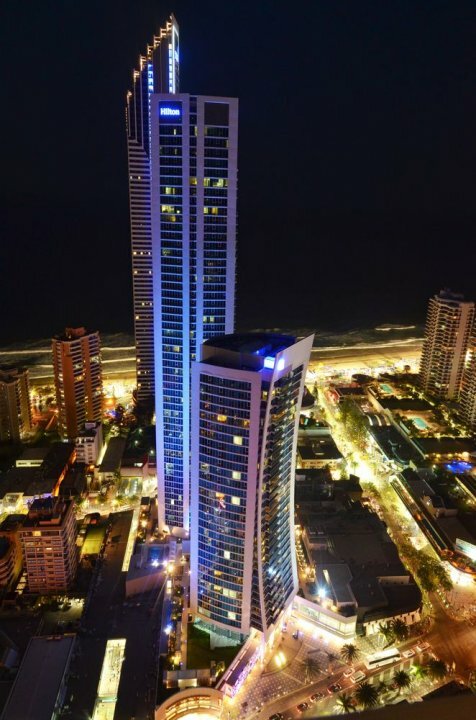 A second entrance is located on Surfers Paradise Boulevard. 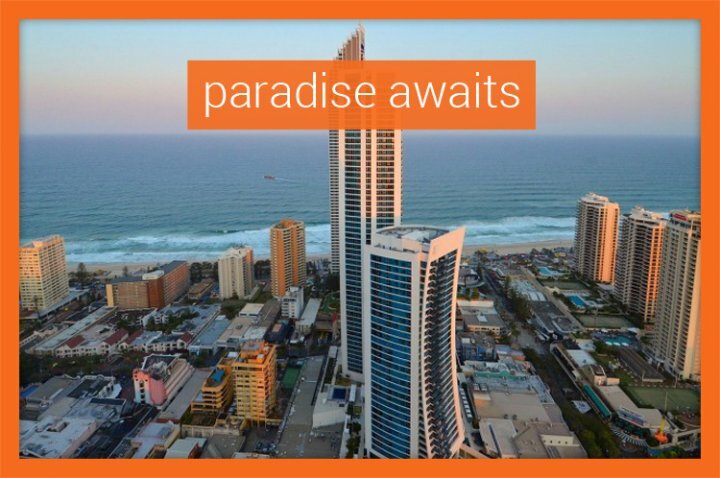 Orchid Residences is just north of the GCHR Office on the ground floor (street frontage) of the Cosmopolitan Building on the corner of Surfers Paradise Boulevard and Beach Road. Entrance to the Orchid Residences is through the Arcade opposite the Cavill Avenue station. 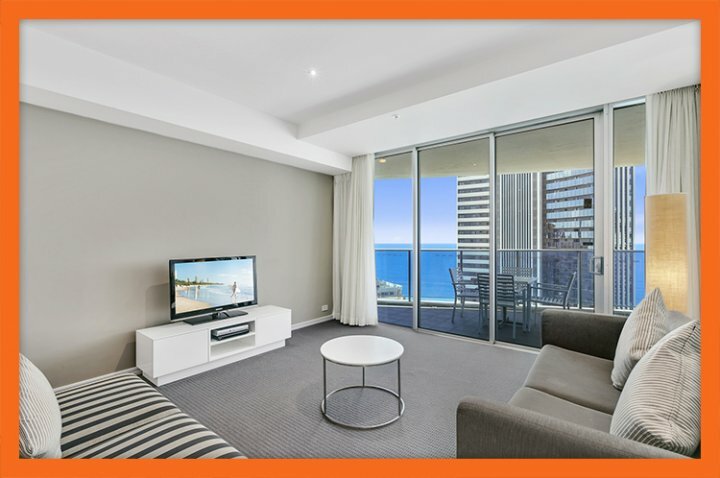 On behalf of the Body Corporate for 3113 Surfers Paradise Boulevard - This apartment is NOT managed by HILTON. Hilton do not provide any services to this apartment. Towels at the Pool Deck are for Hilton guest use only. ALL enquiries Contact you Booking Agent or the apartment Owner.